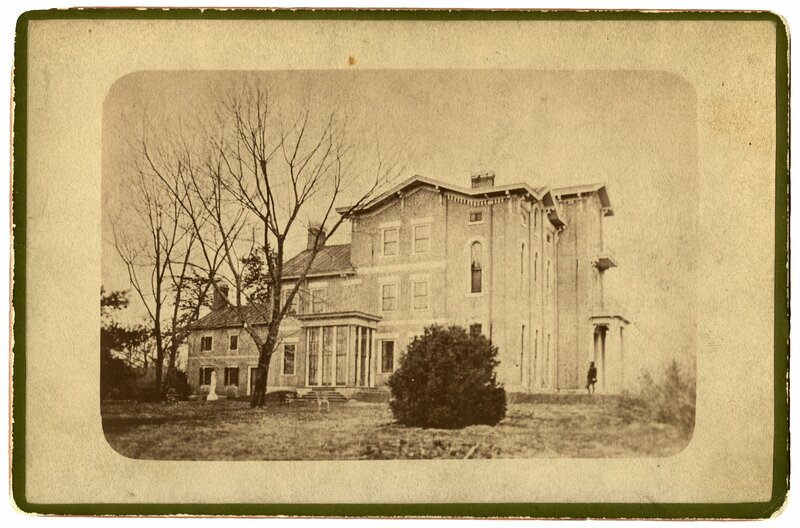 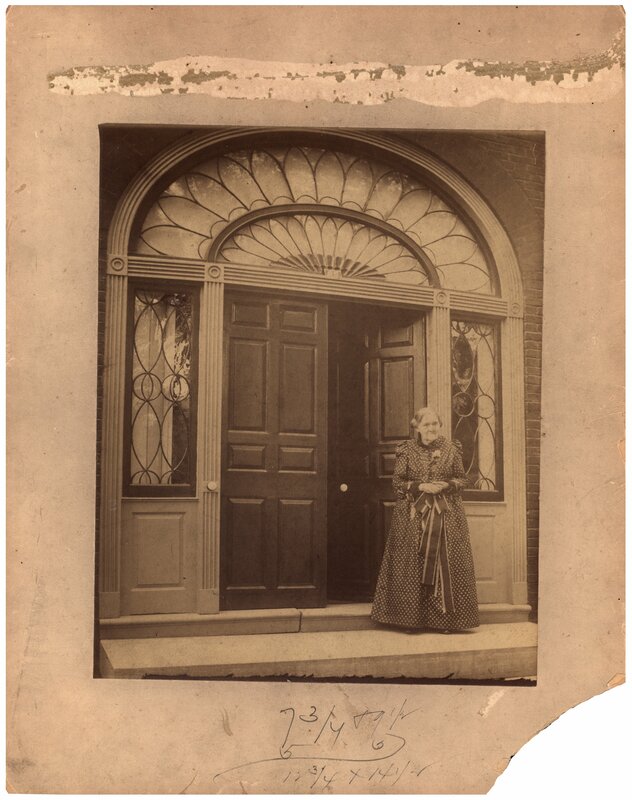 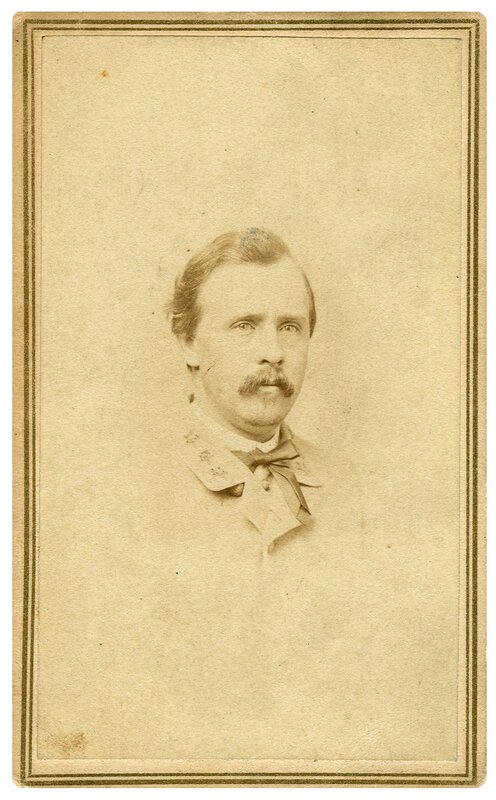 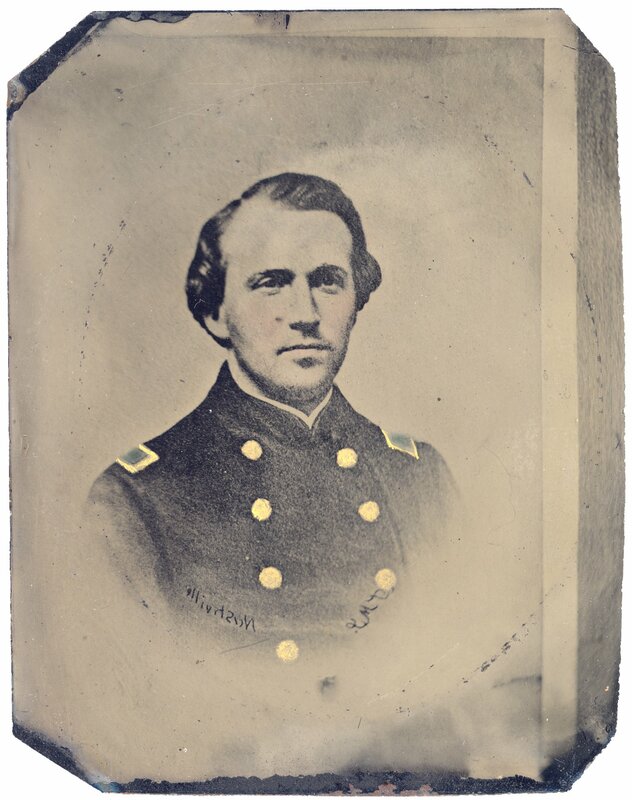 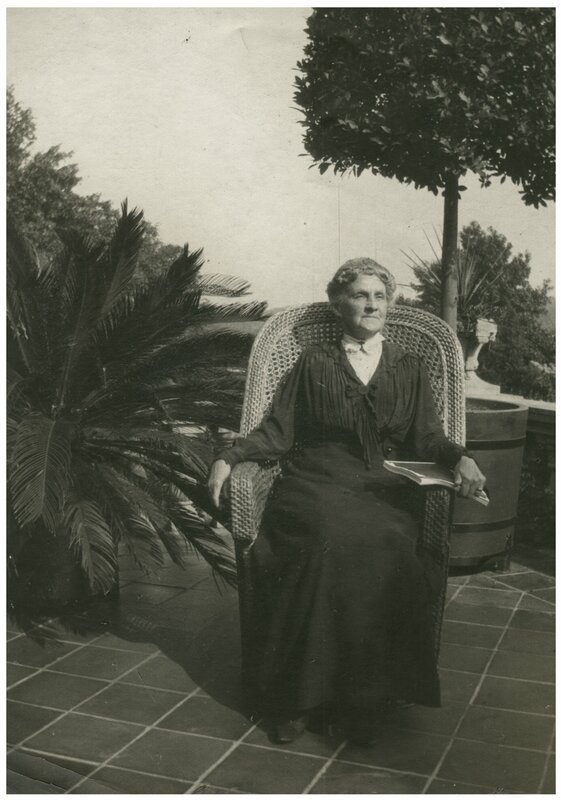 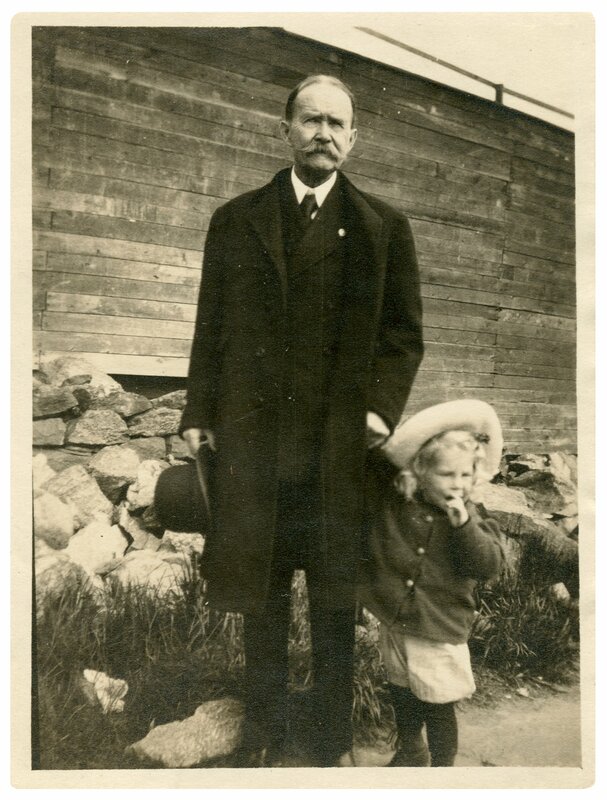 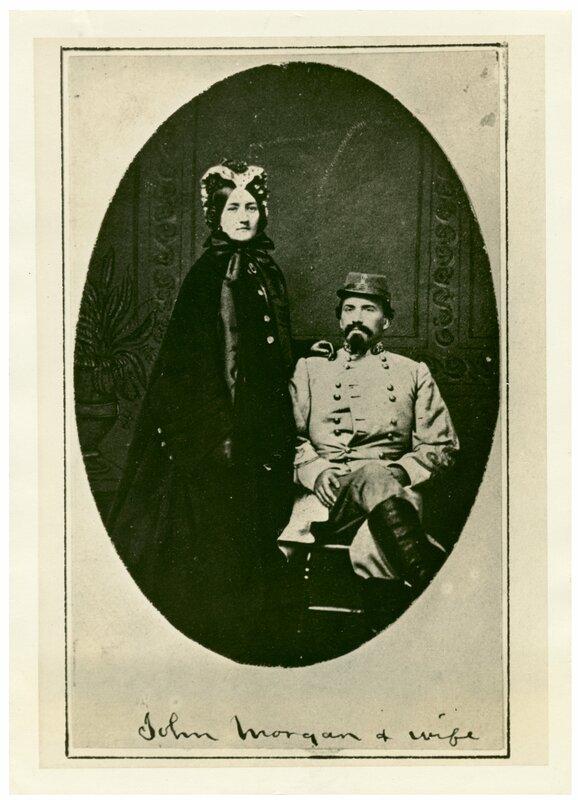 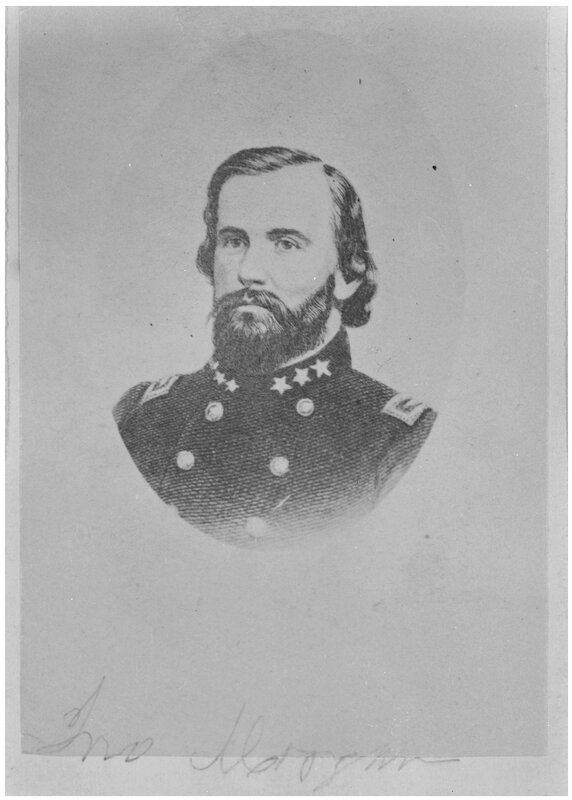 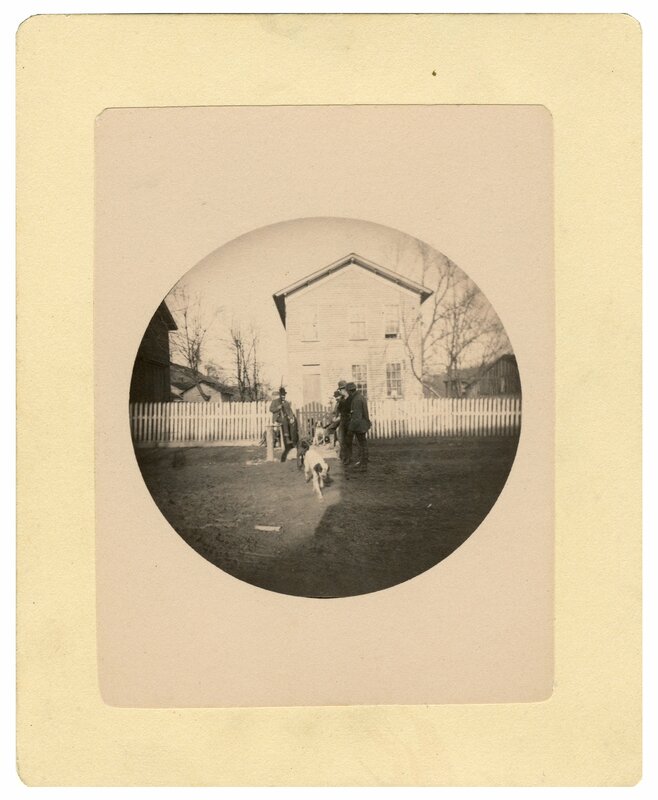 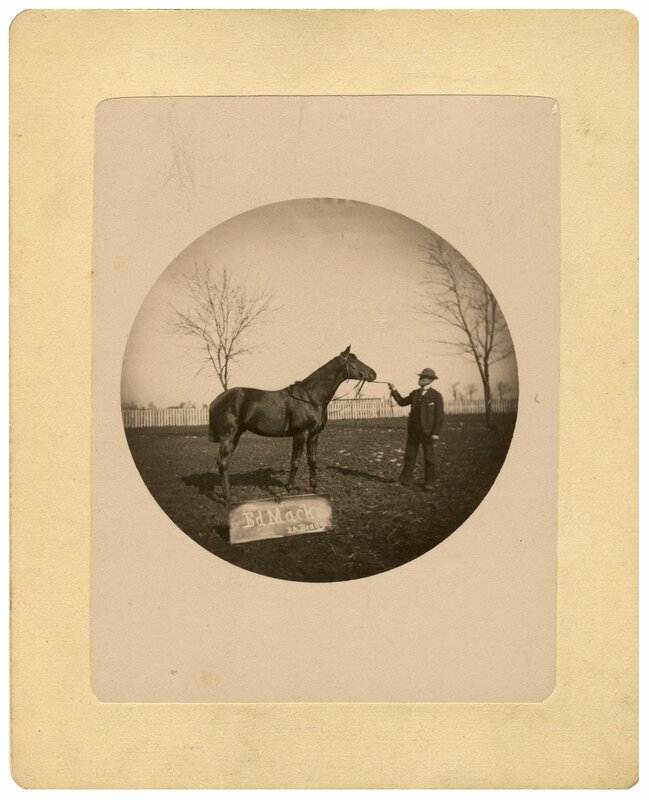 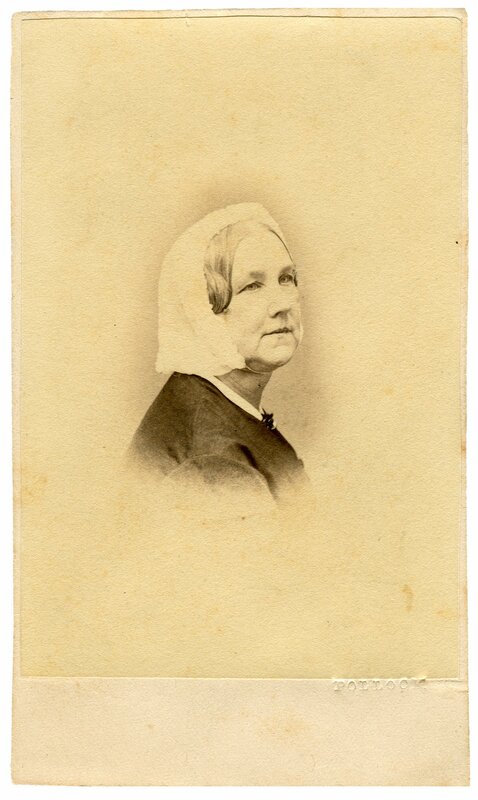 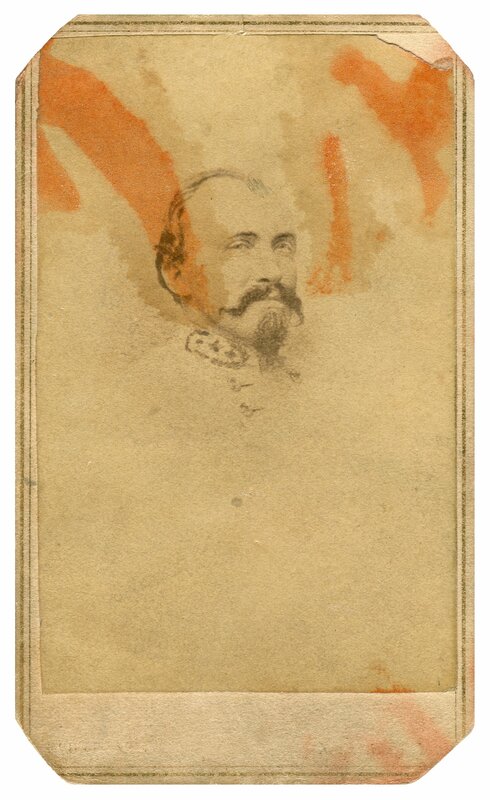 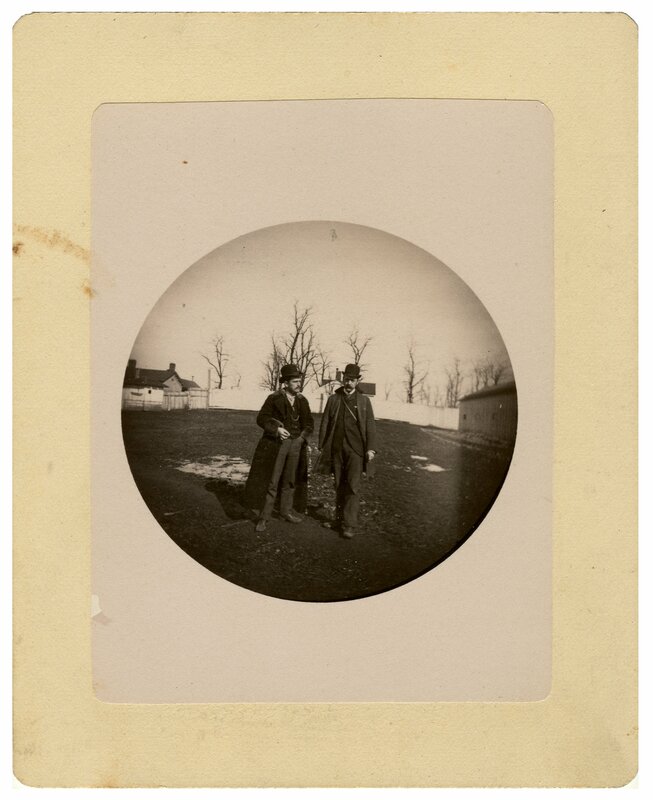 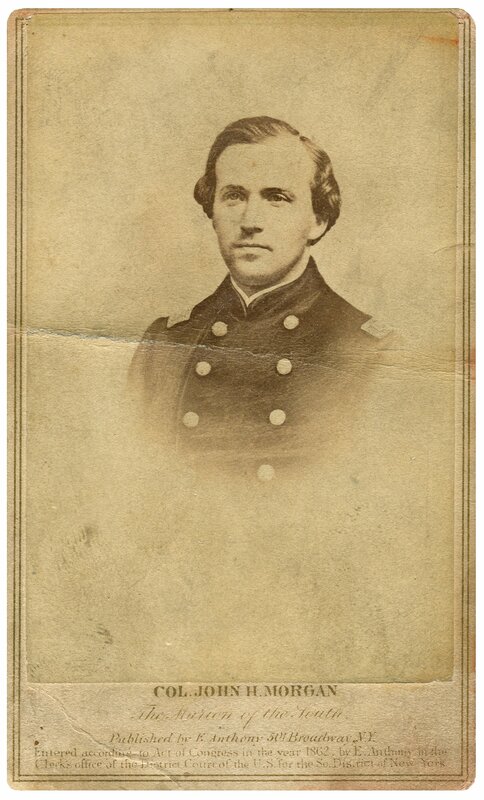 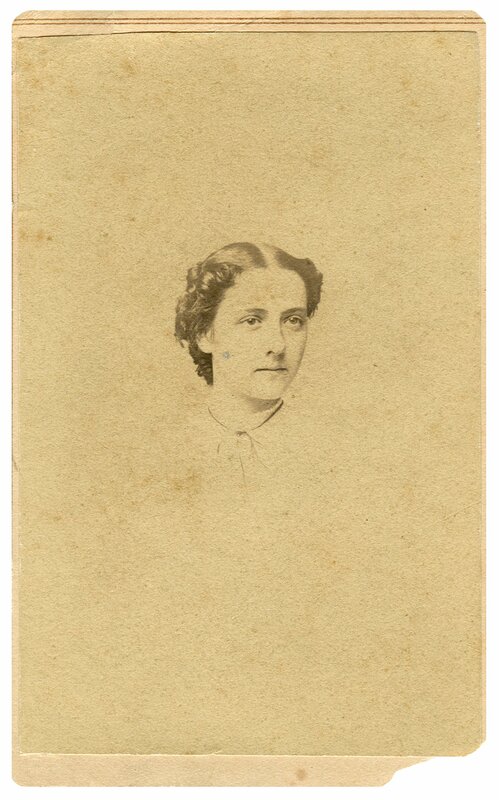 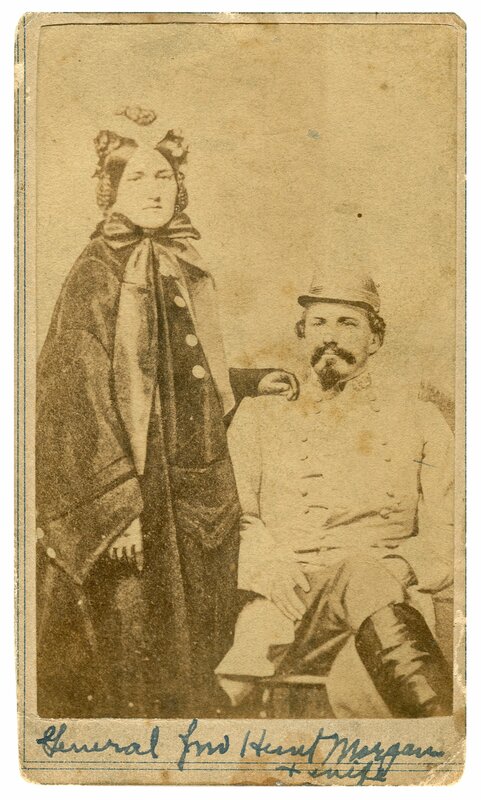 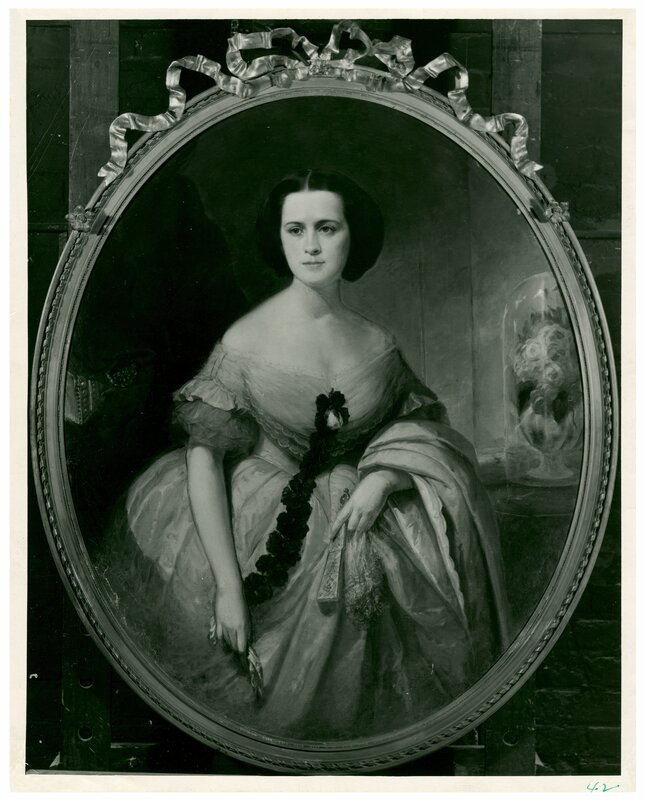 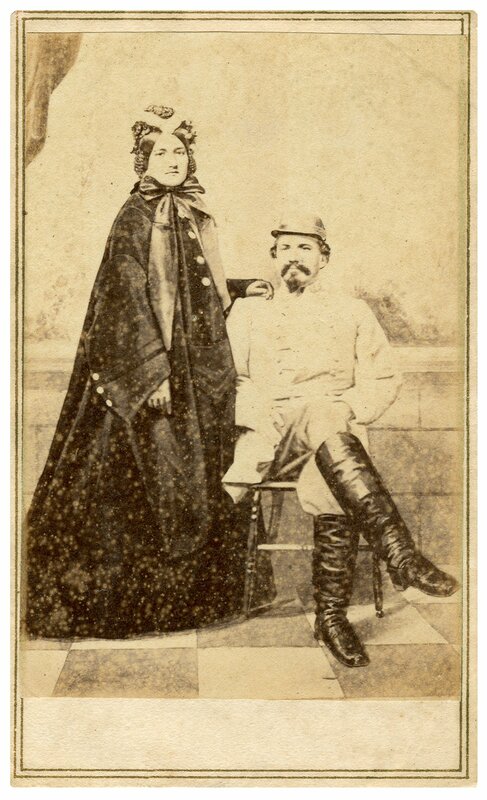 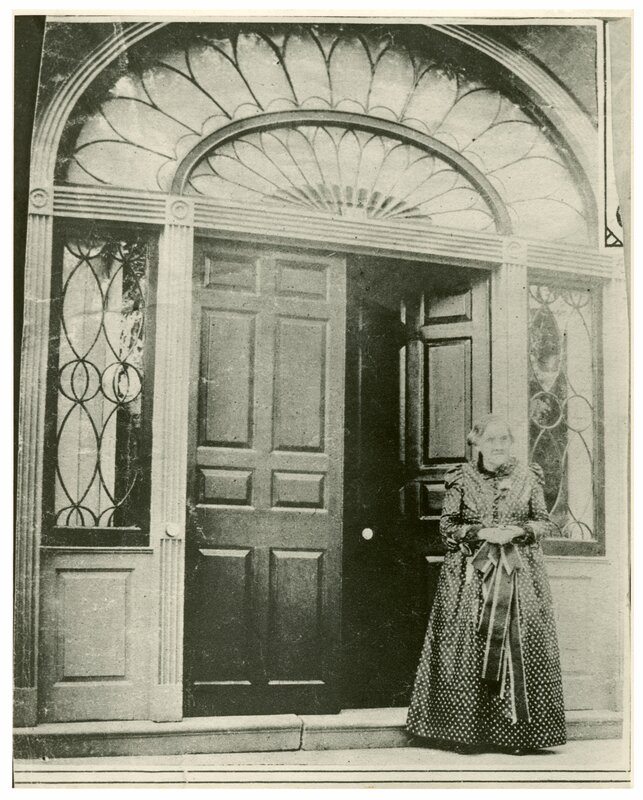 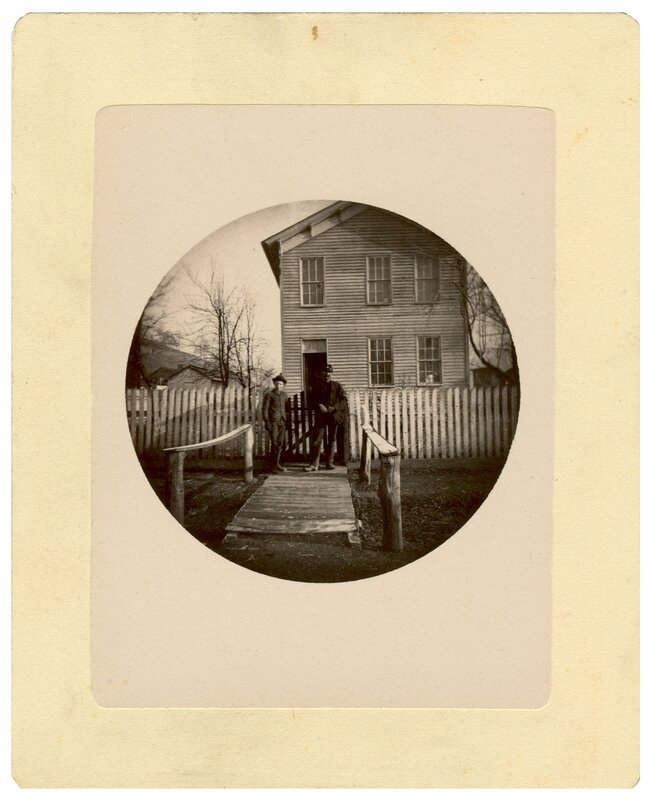 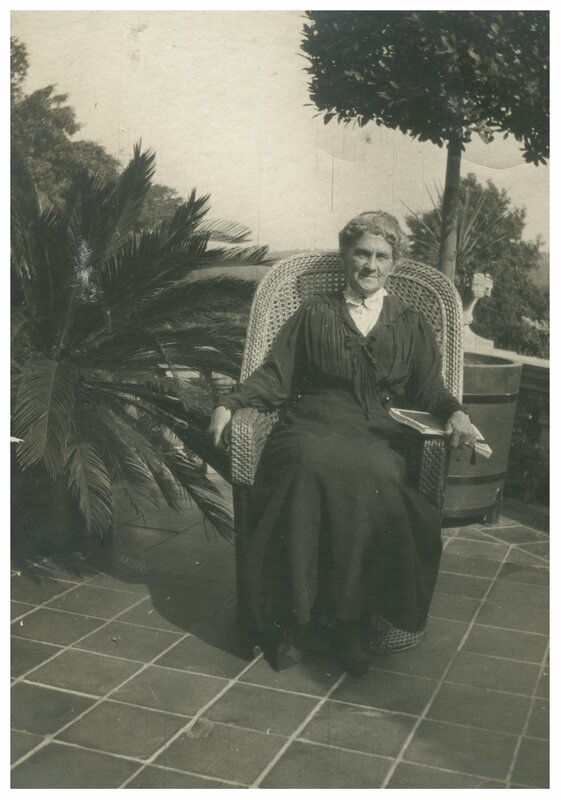 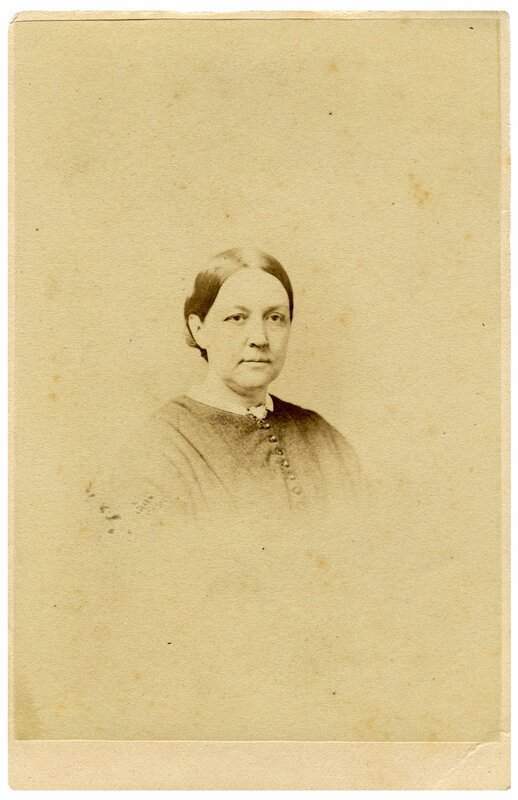 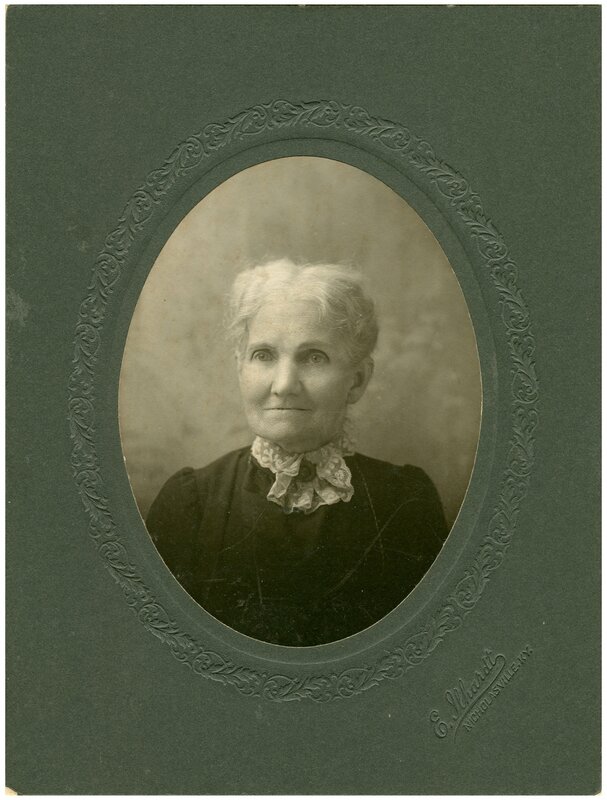 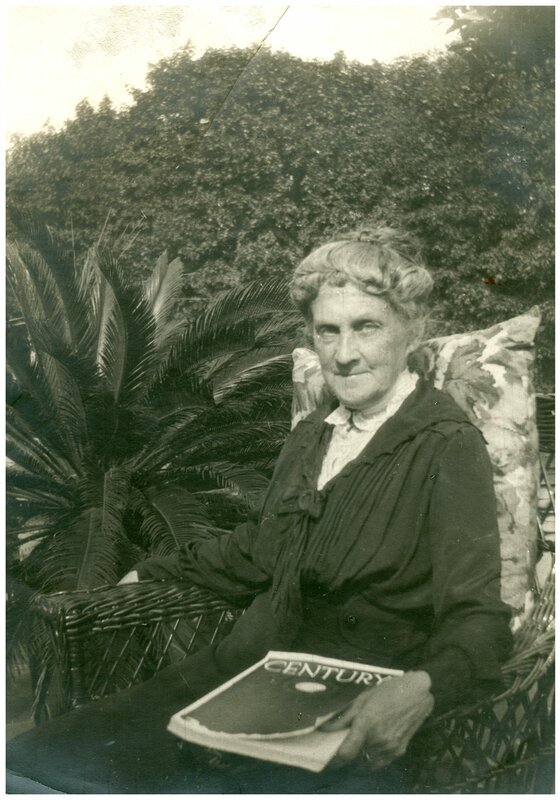 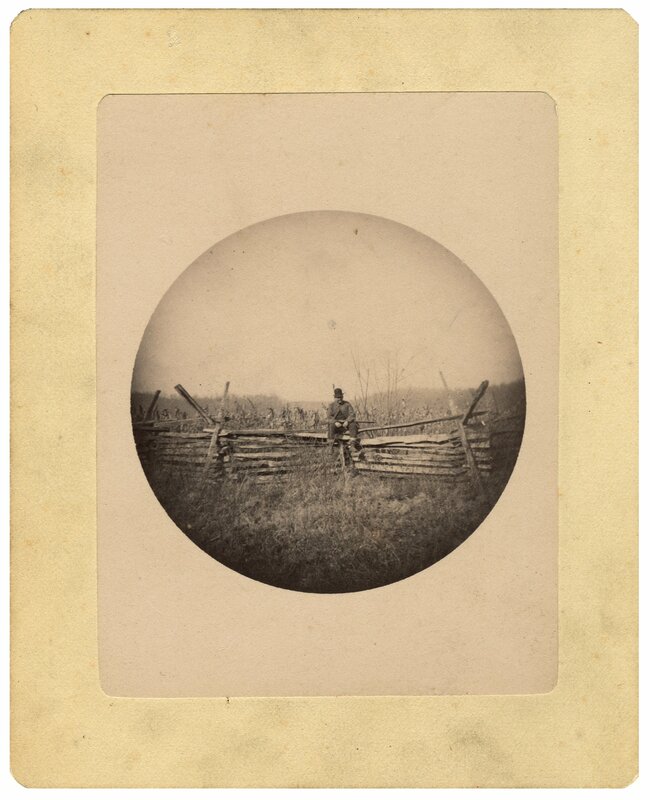 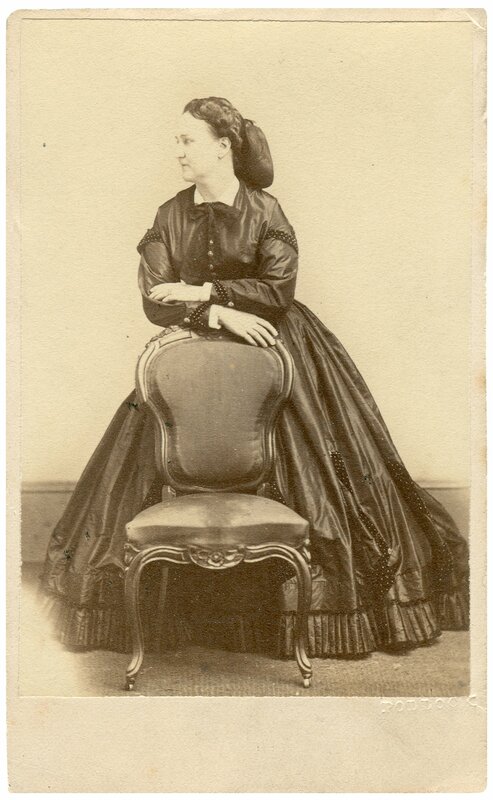 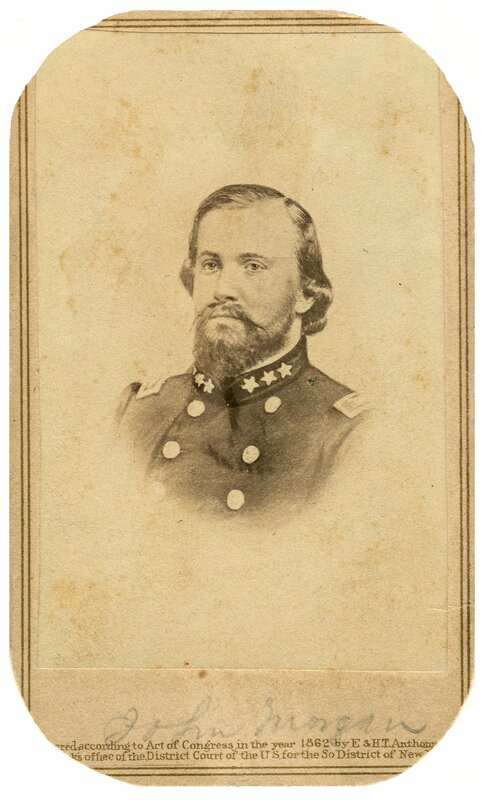 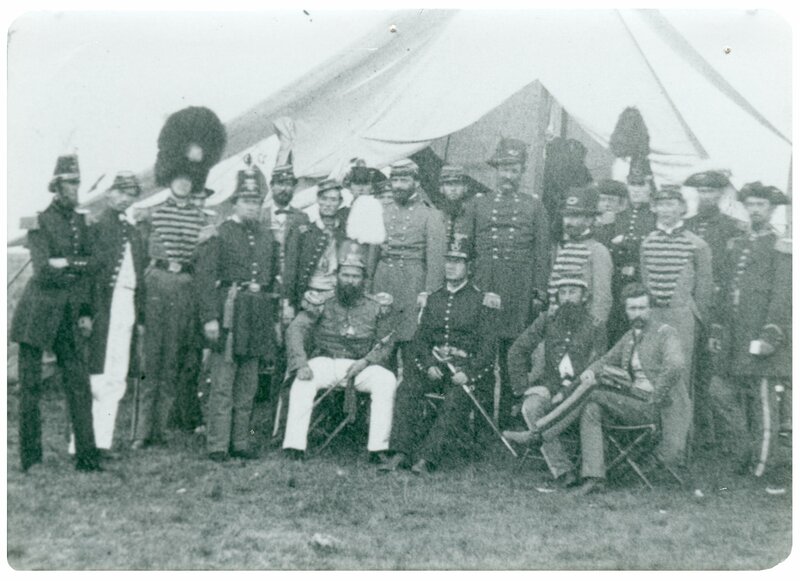 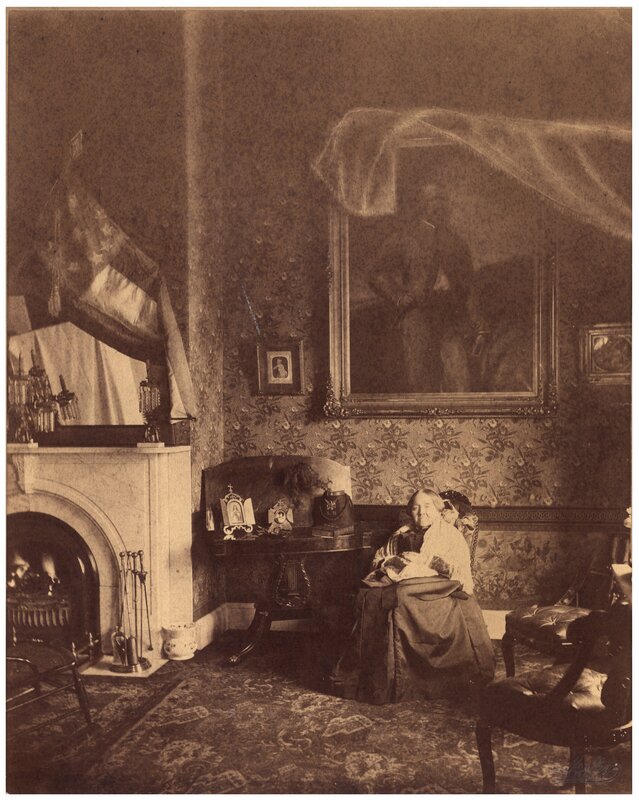 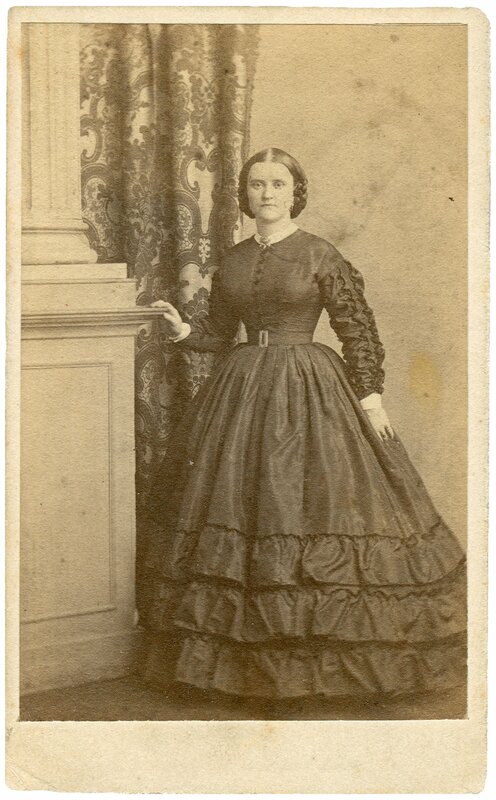 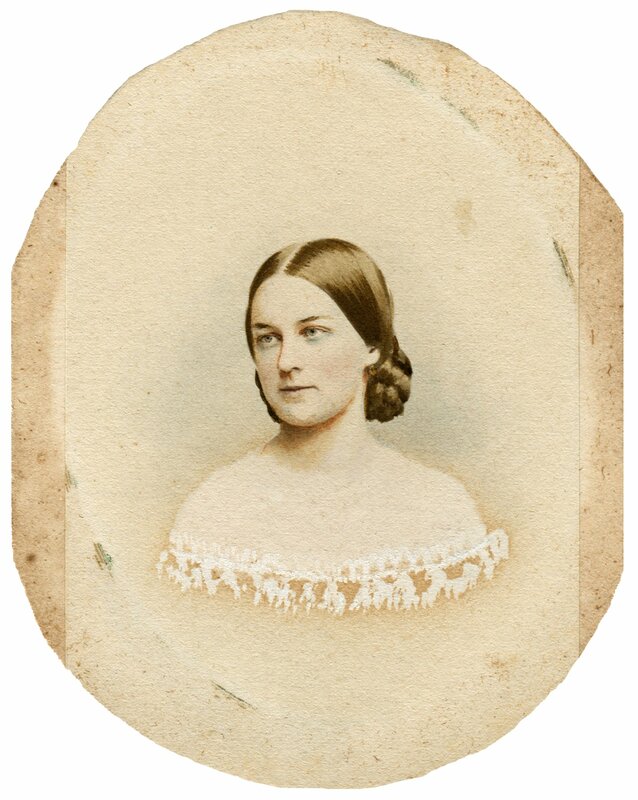 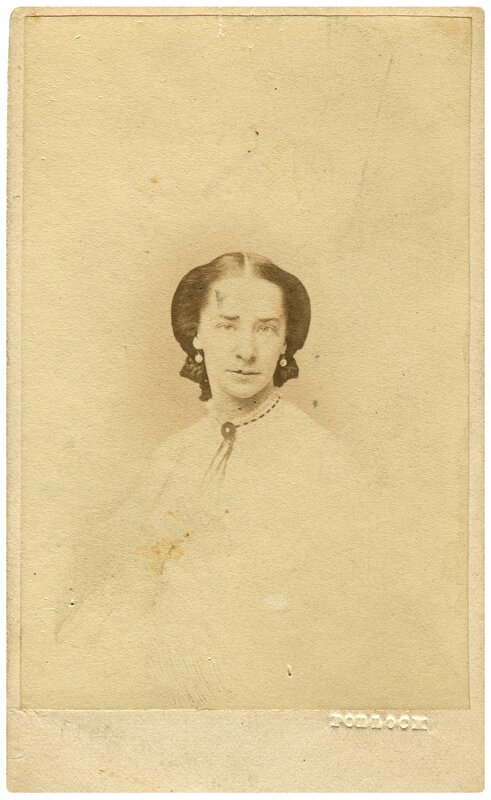 The Hunt-Morgan House Deposit photographs (dated 1860-1949; 2 cubic feet; 234 items) consists of images documenting the lives of Hunt-Morgan family members, primarily Brigadier General John Hunt Morgan. 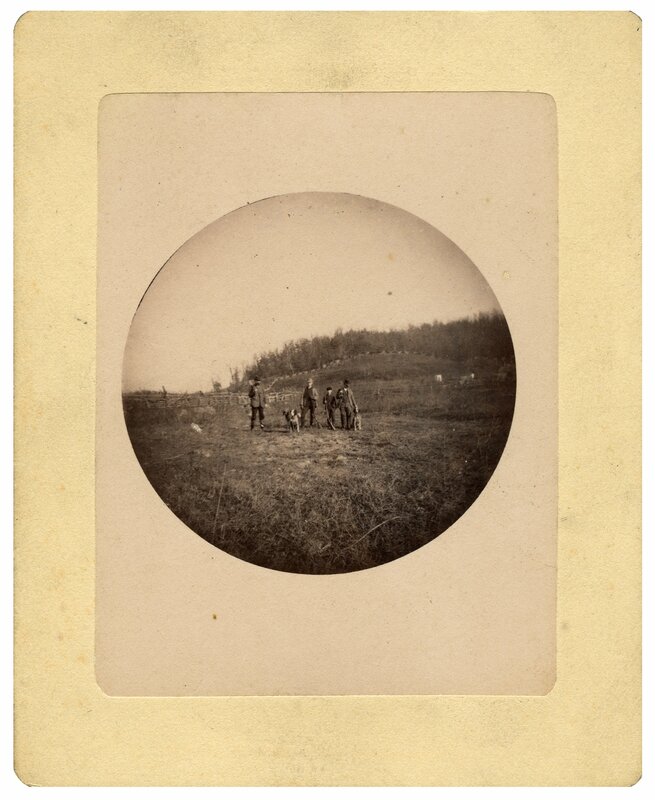 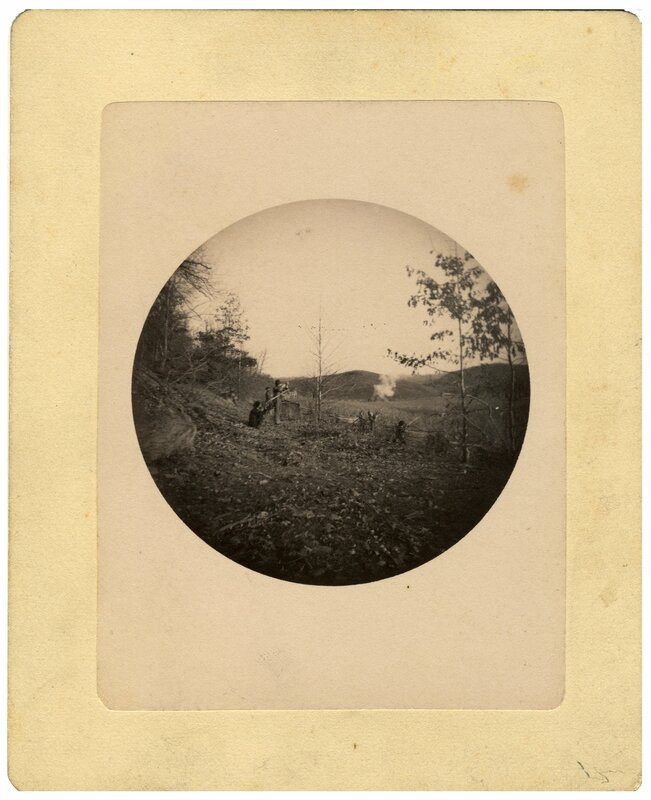 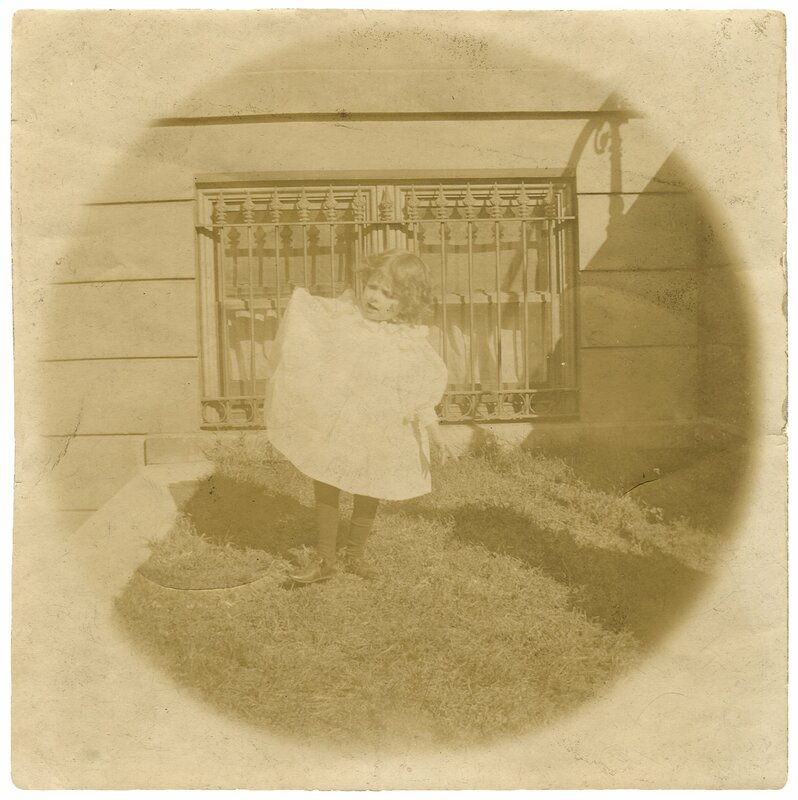 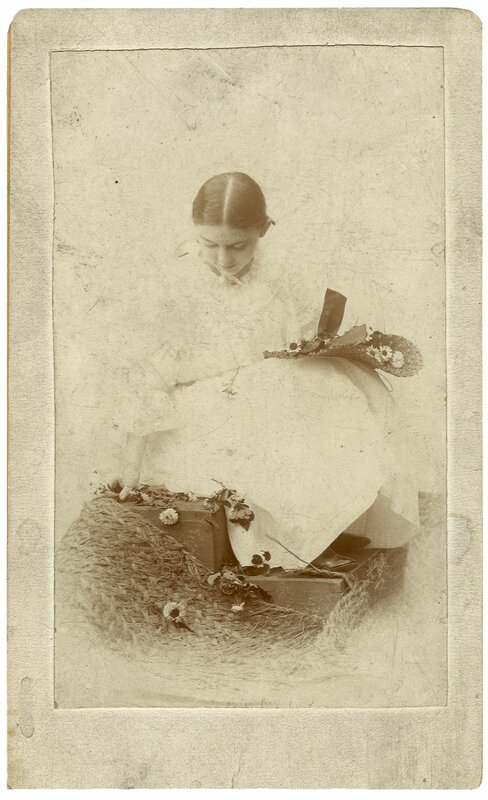 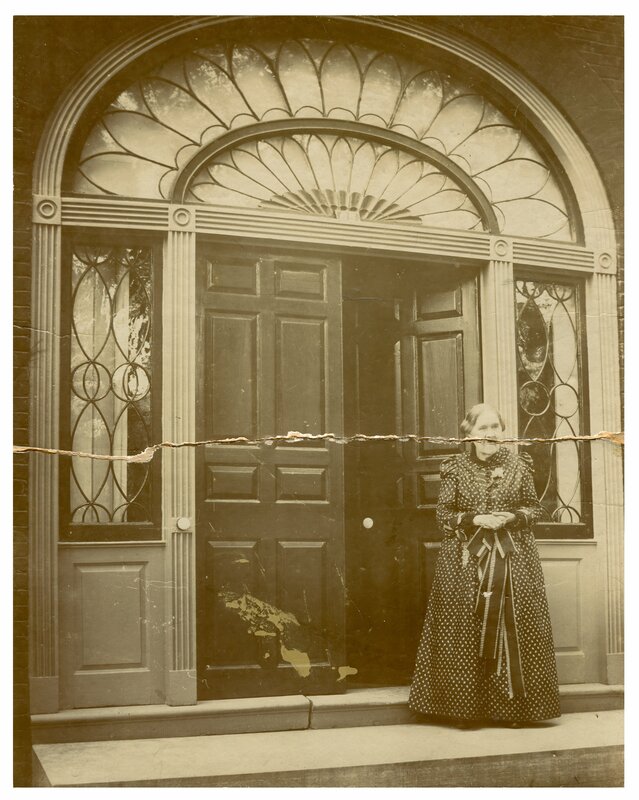 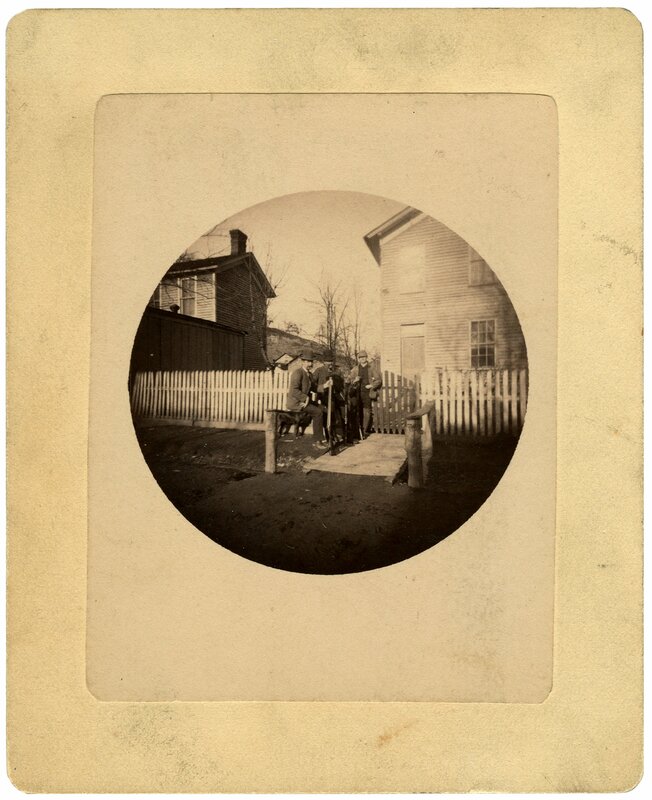 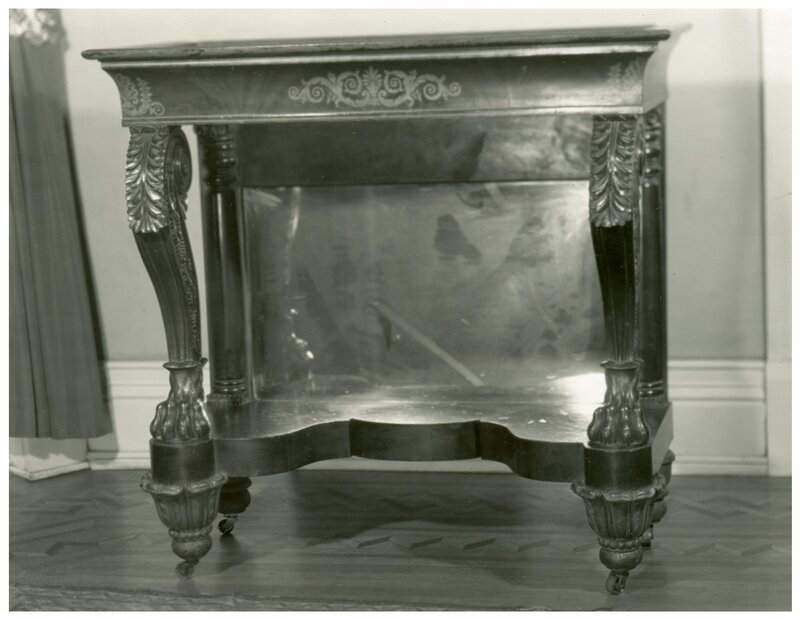 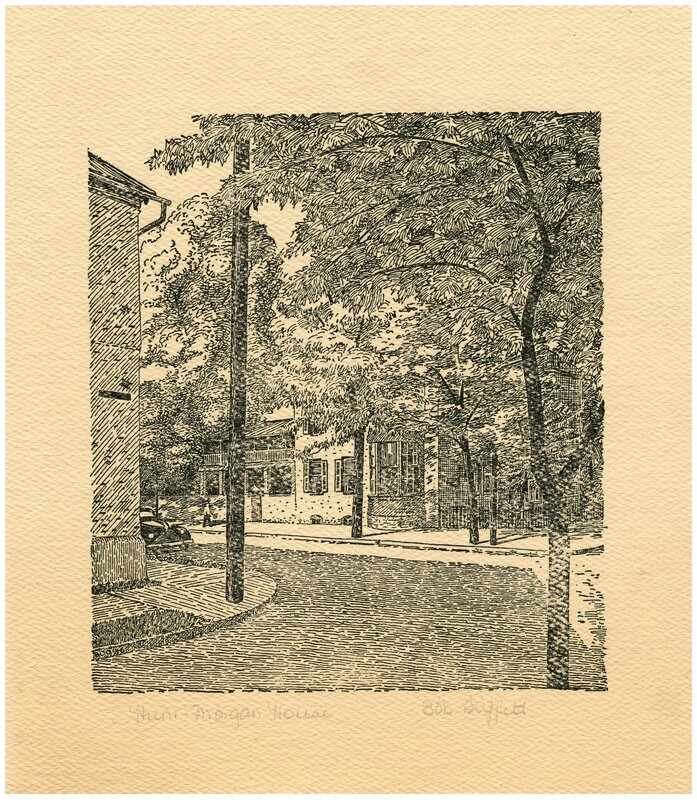 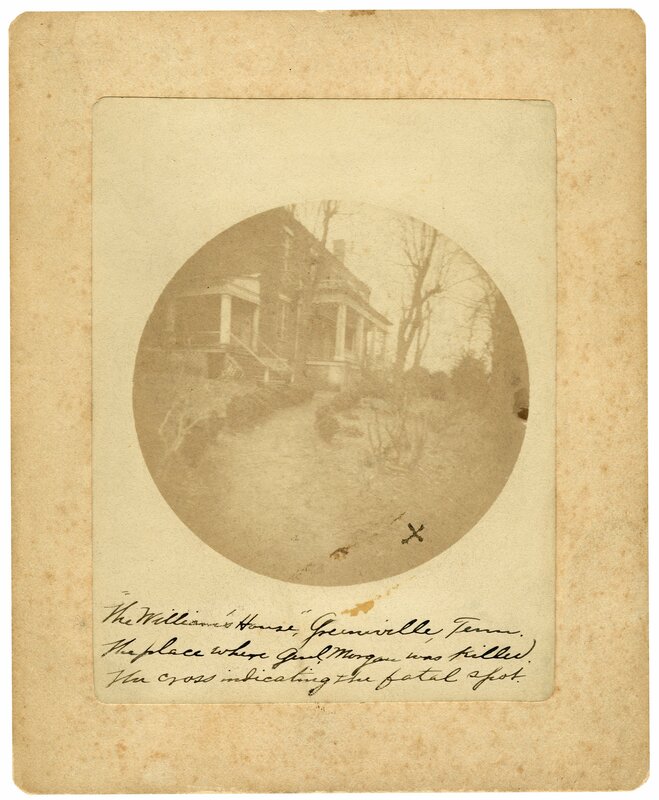 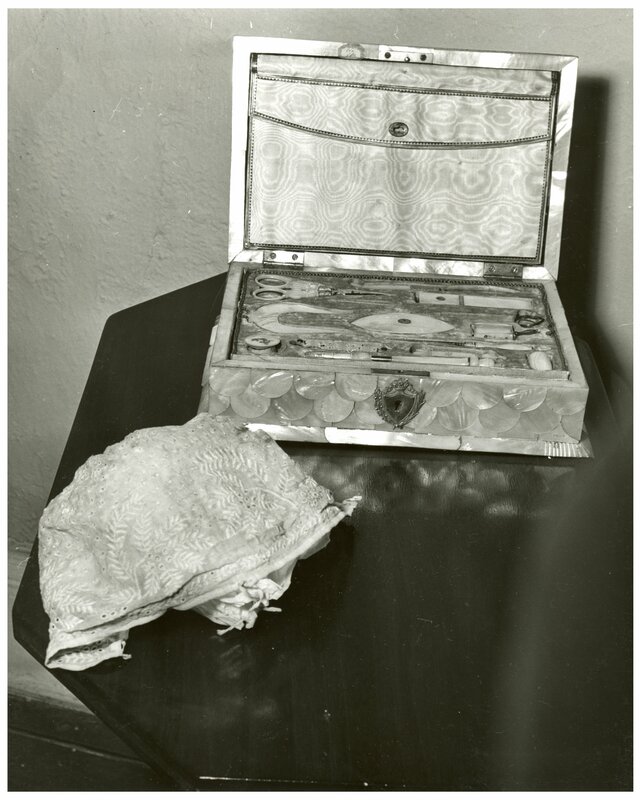 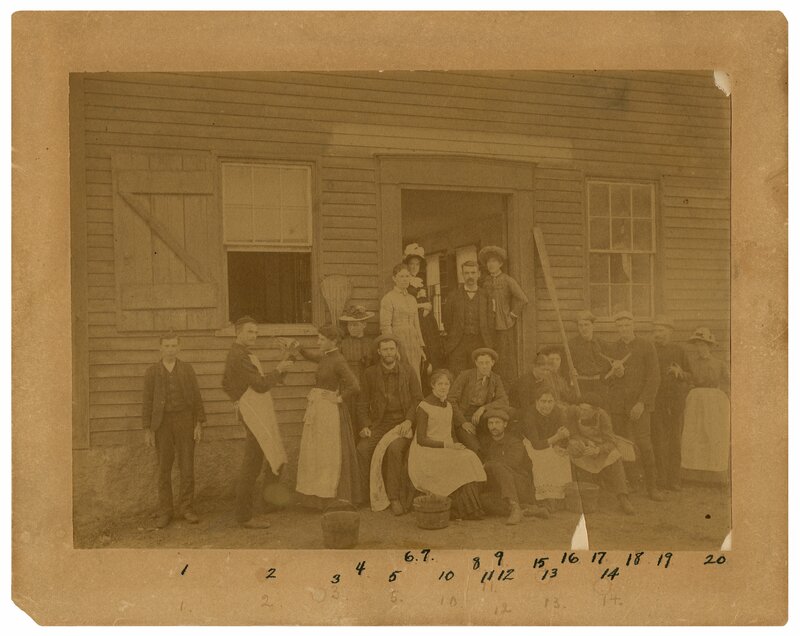 PA96M3: [identification of item], Hunt-Morgan House deposit photographs, 1847-1966, University of Kentucky Special Collections. 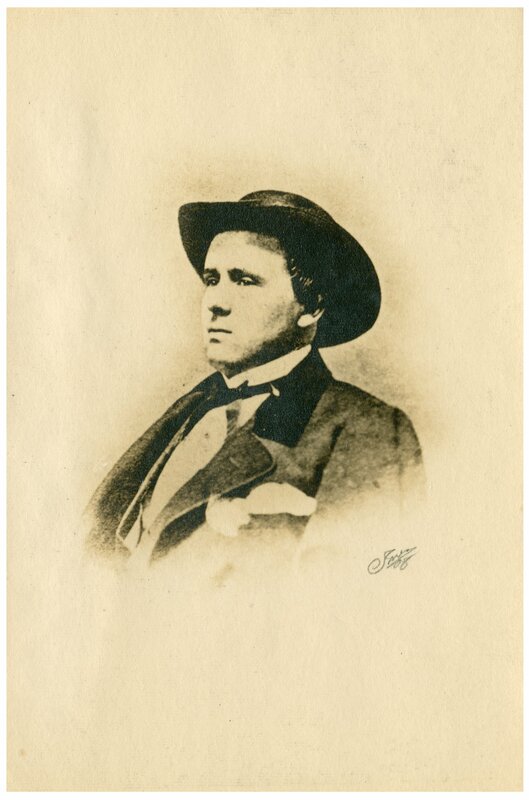 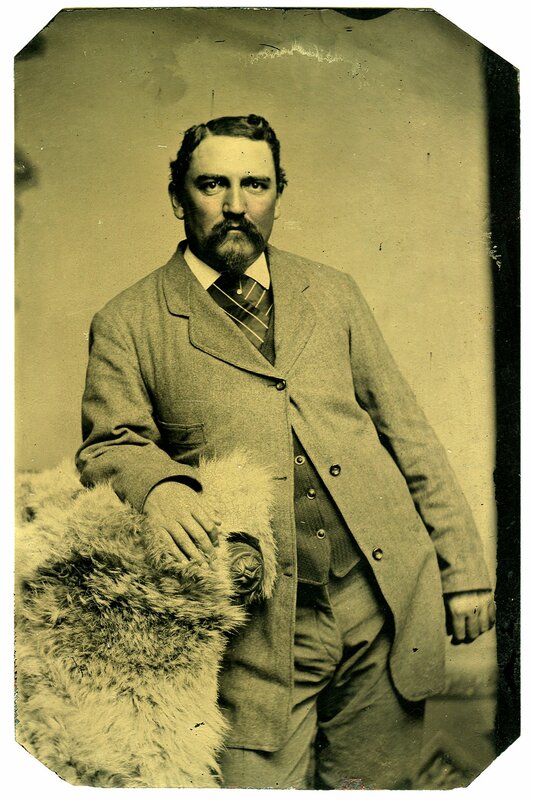 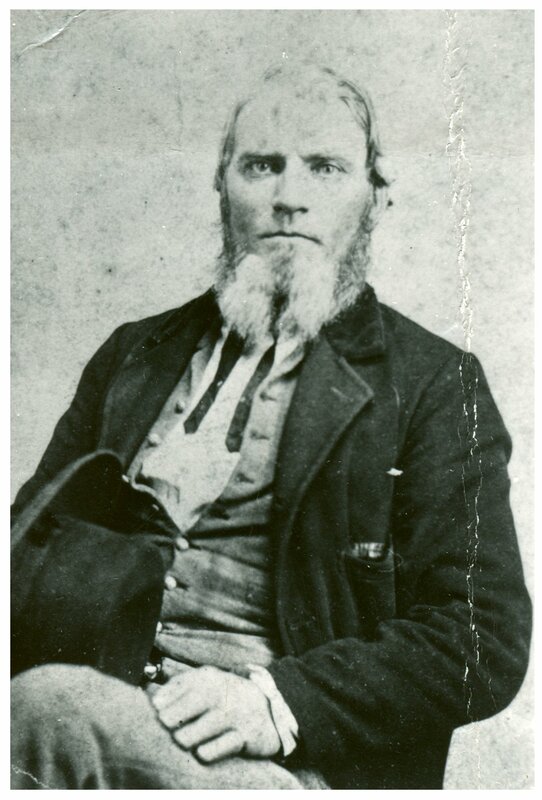 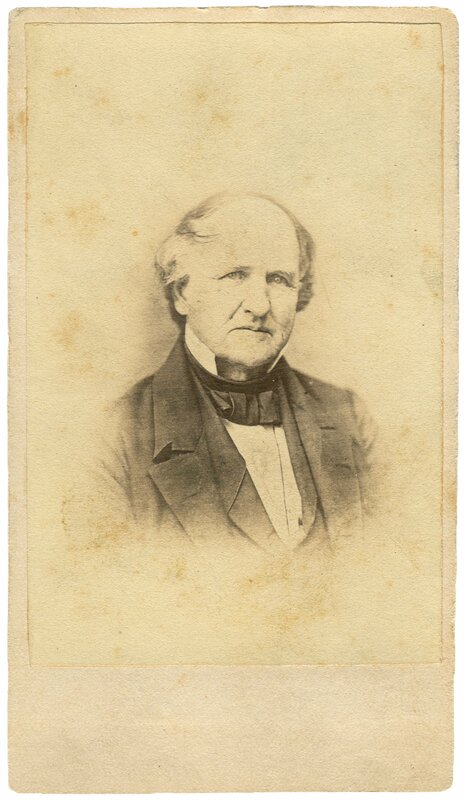 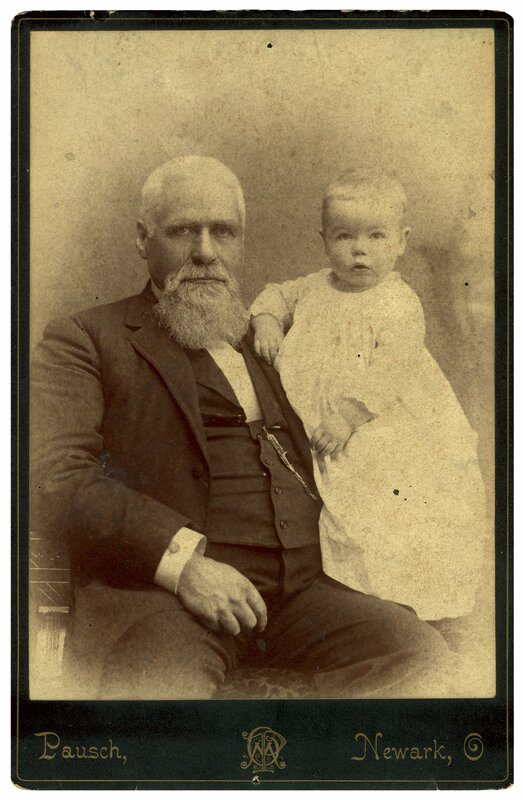 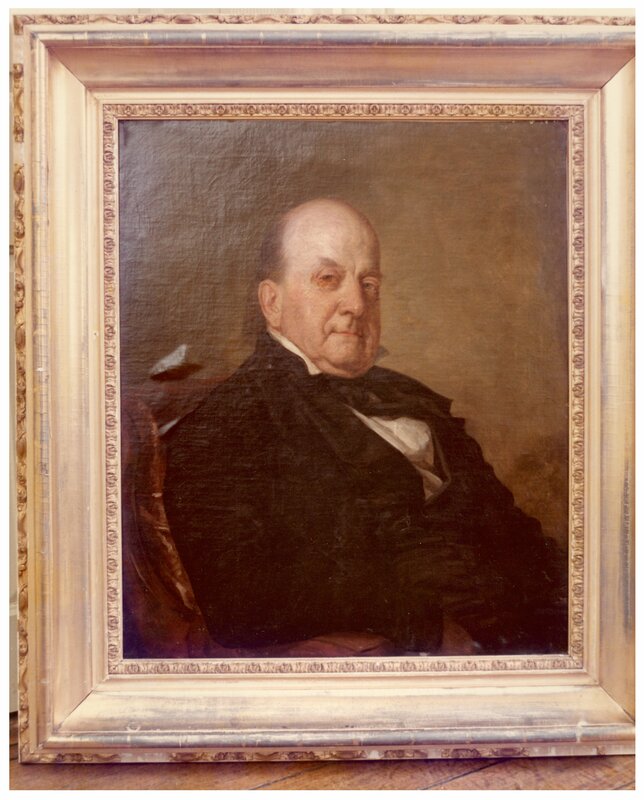 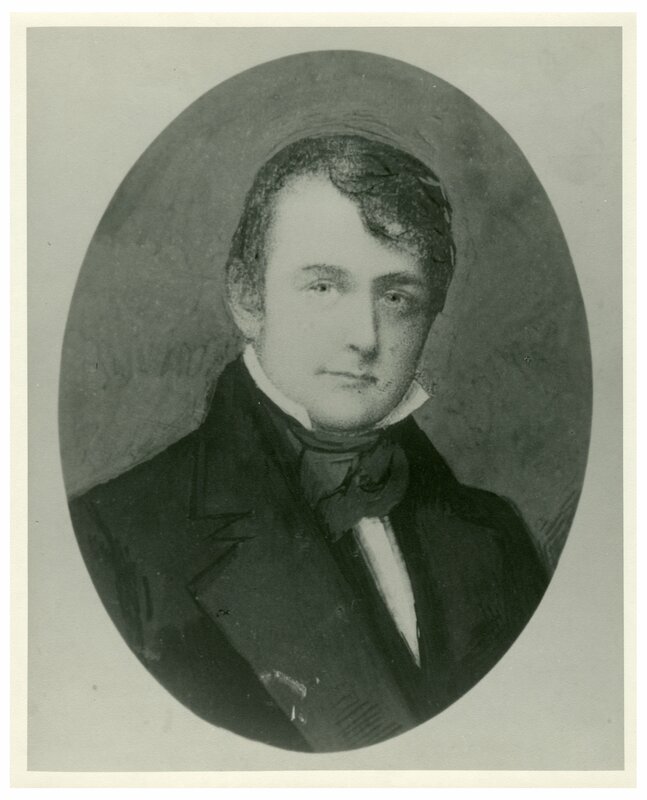 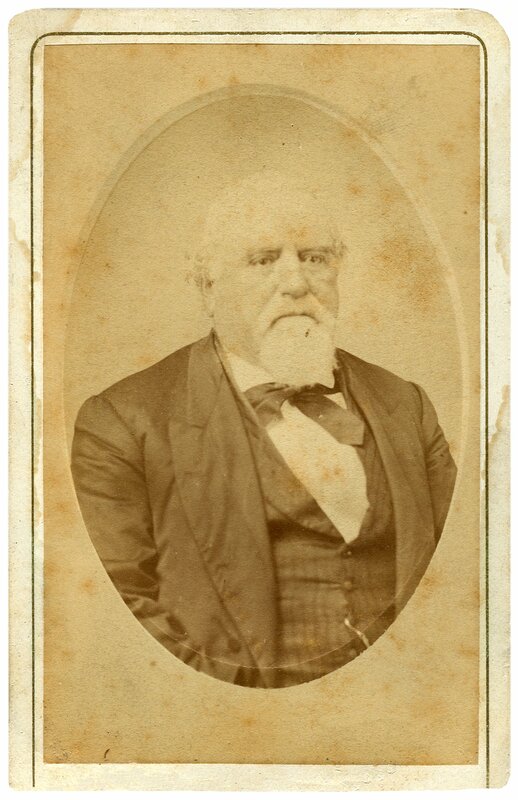 John Wesley Hunt, grandfather of John Hunt Morgan, became one of the wealthiest men in the western part of the country, involved in banking, mercantile interests, manufacturing and agriculture. 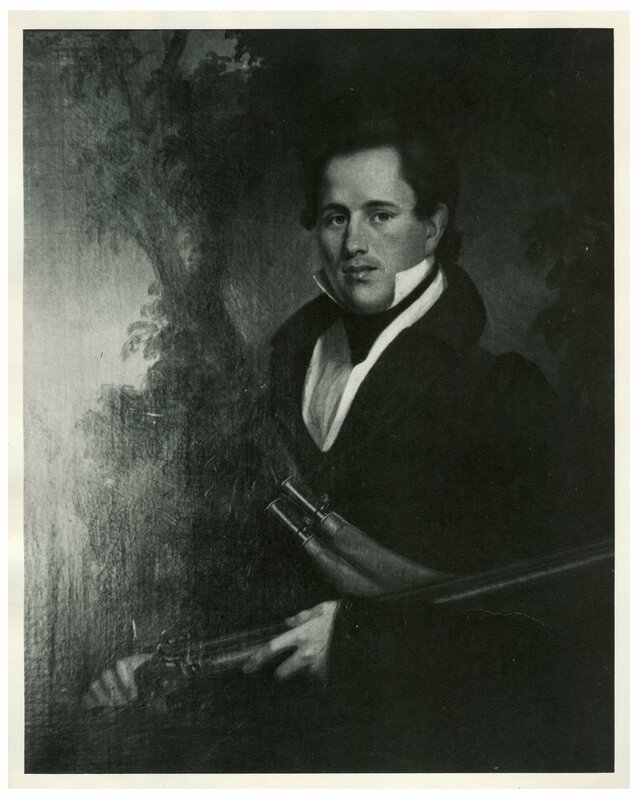 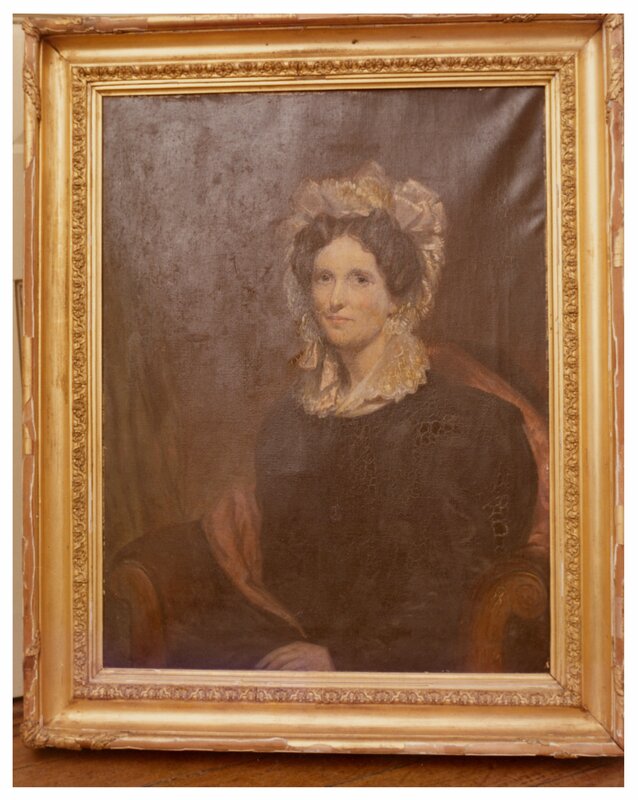 By 1801 Hunt had become a leading landowner and businessman in Fayette County, Kentucky, founding a hemp factory in 1803 and expanding his business empire to include commissioned merchandising of hemp fiber, salt peter and tobacco in 1810. 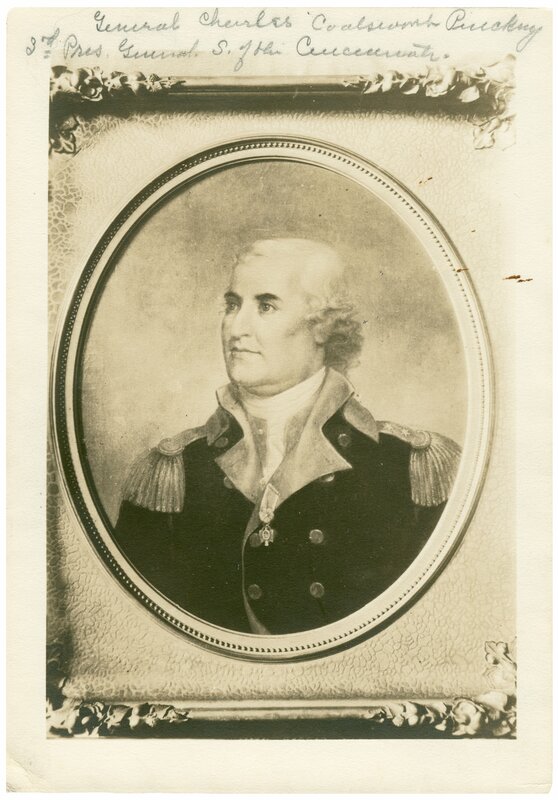 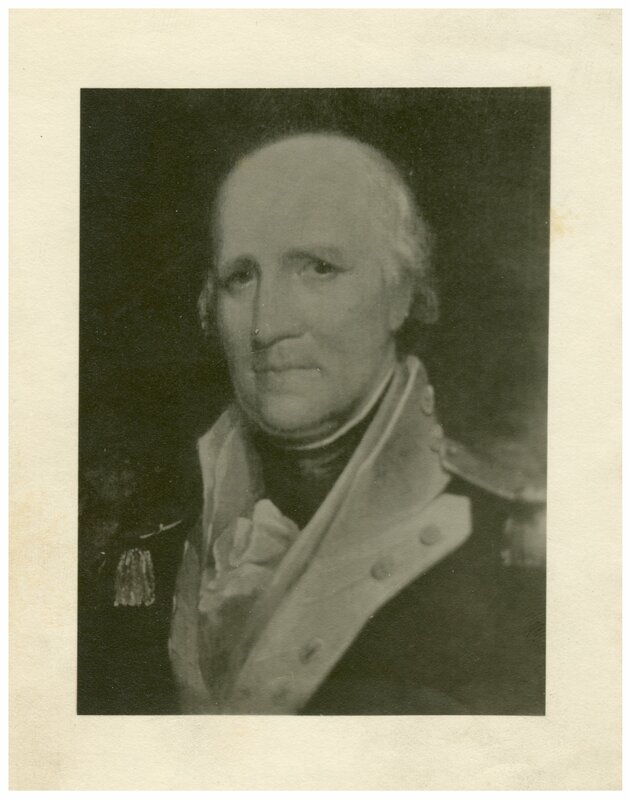 Hunt’s banking interests included the Bank of the United States, where he served as director of the Lexington branch in 1817 and president of the Farmers and Mechanics Bank of Lexington in 1818. 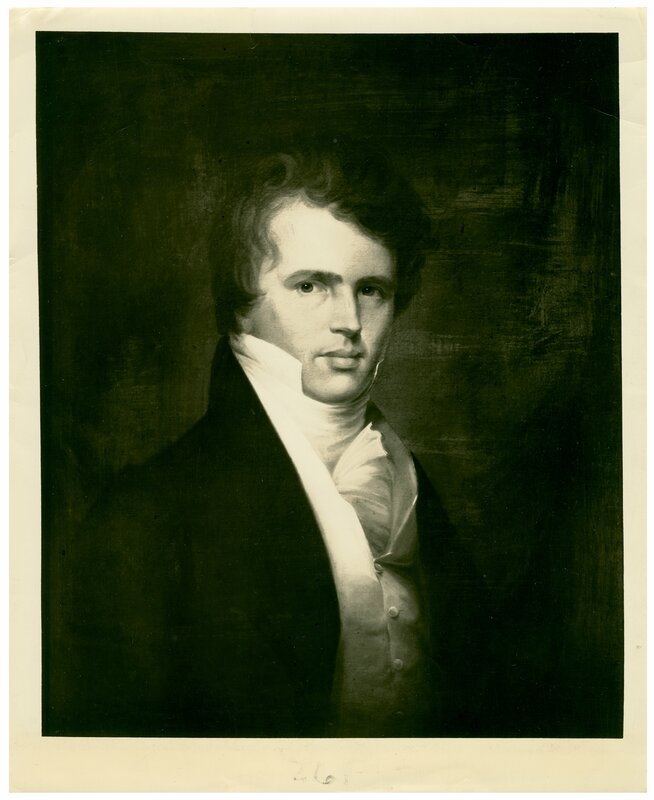 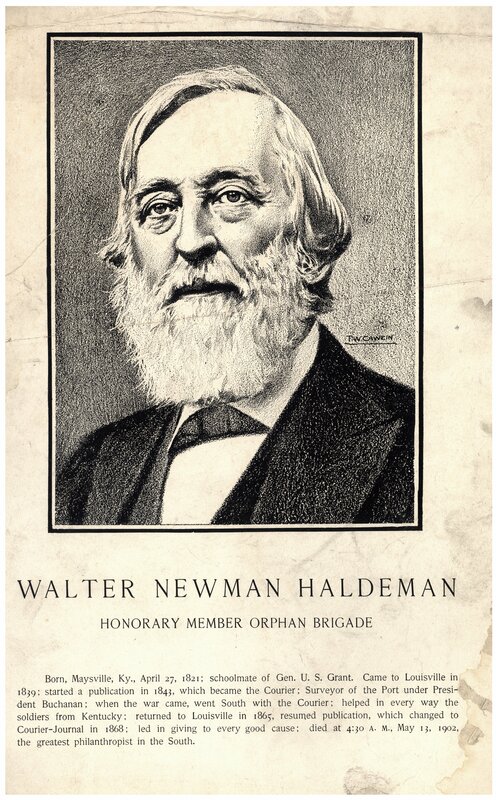 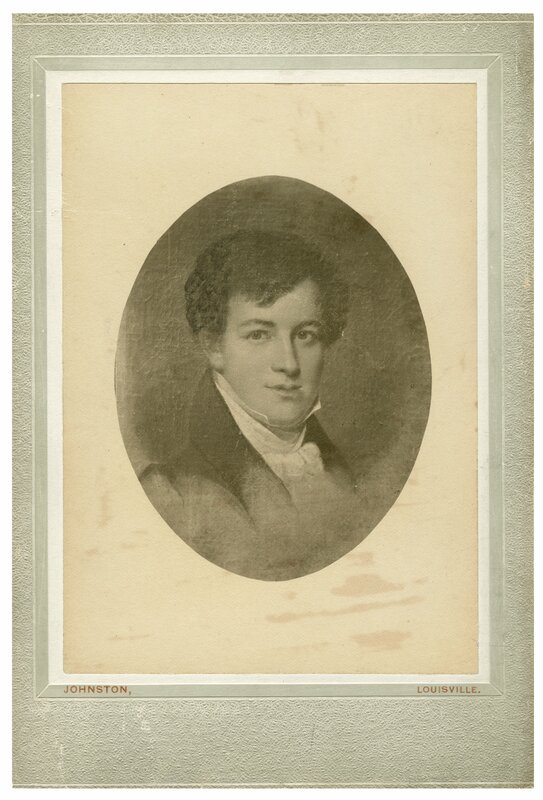 His philanthropic concerns led him to serve on the Board of Trustees of Transylvania University for sixteen years and to aid in the establishment of the Lunatic Asylum in Lexington, Kentucky in 1820, serving as Chairman of the Board of that institution for twenty years. 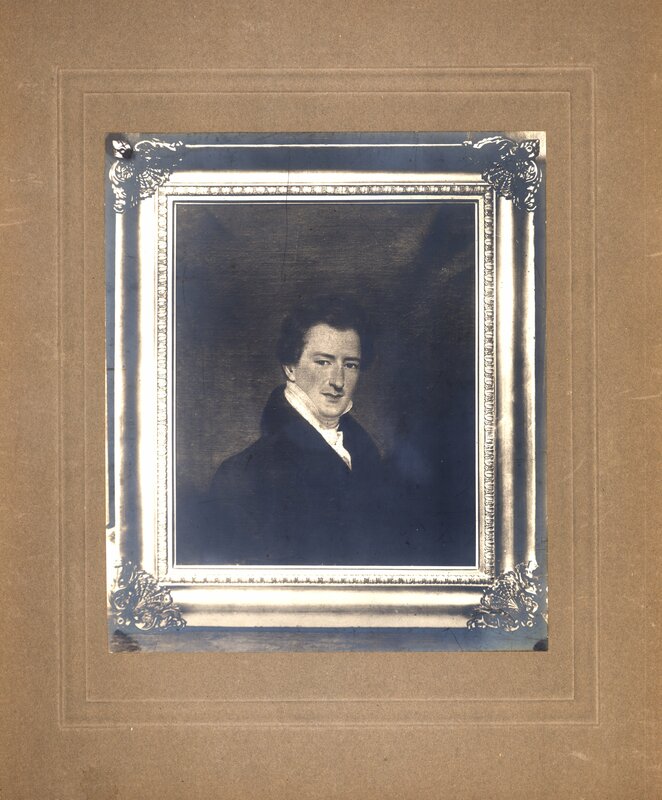 John Wesley Hunt died in 1849, a suspected victim of cholera. 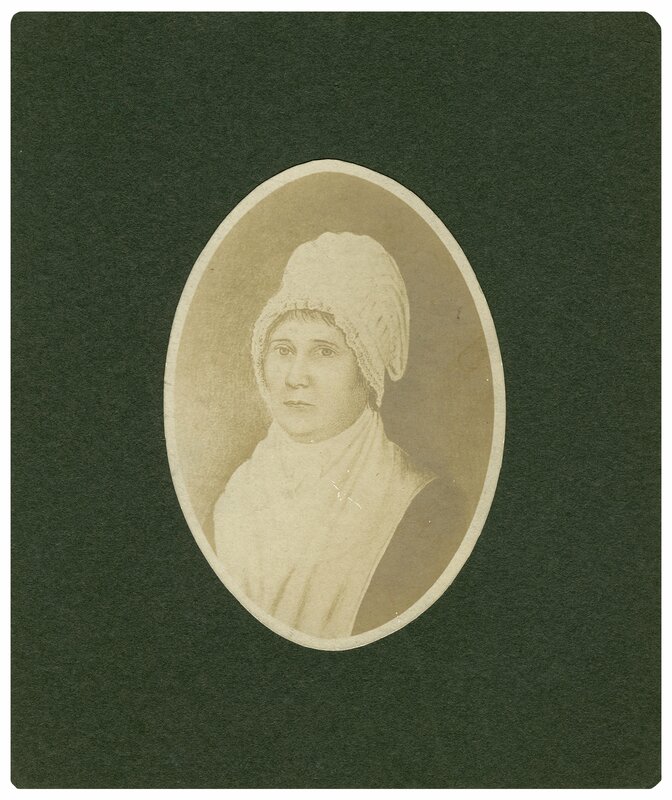 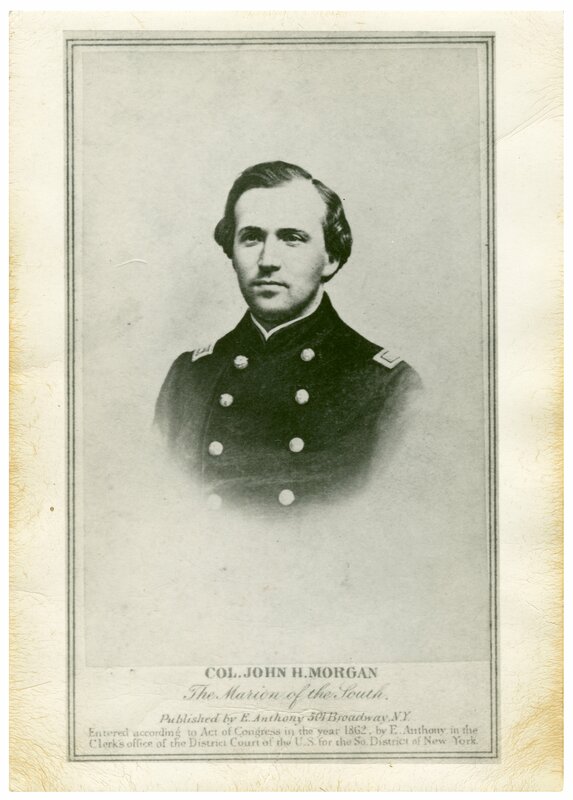 The Morgan family was noted for their military service, its members serving with distinction in the Revolution and the War of 1812. 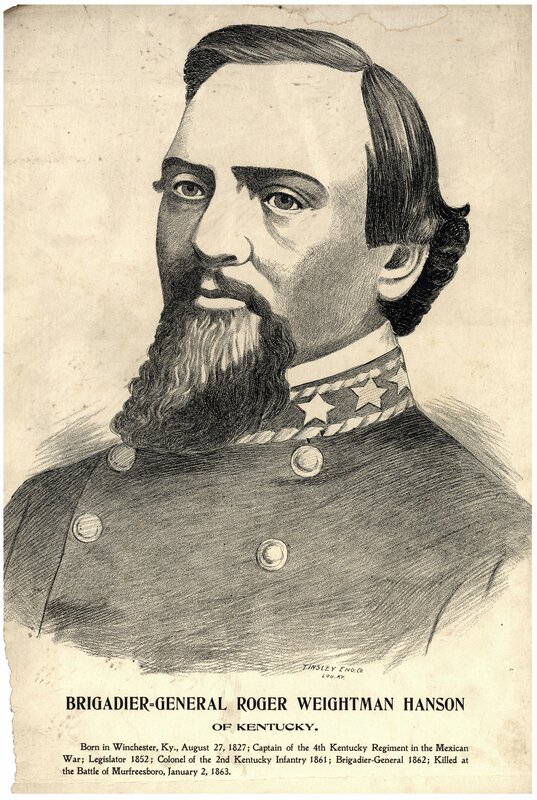 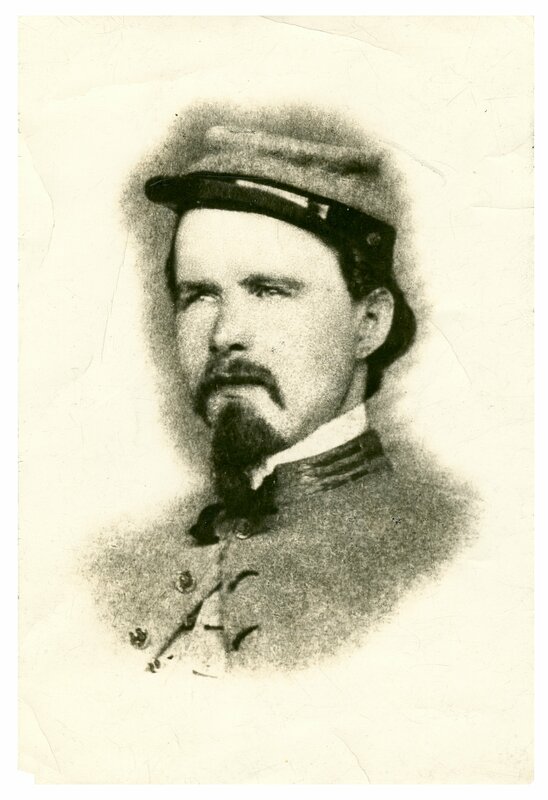 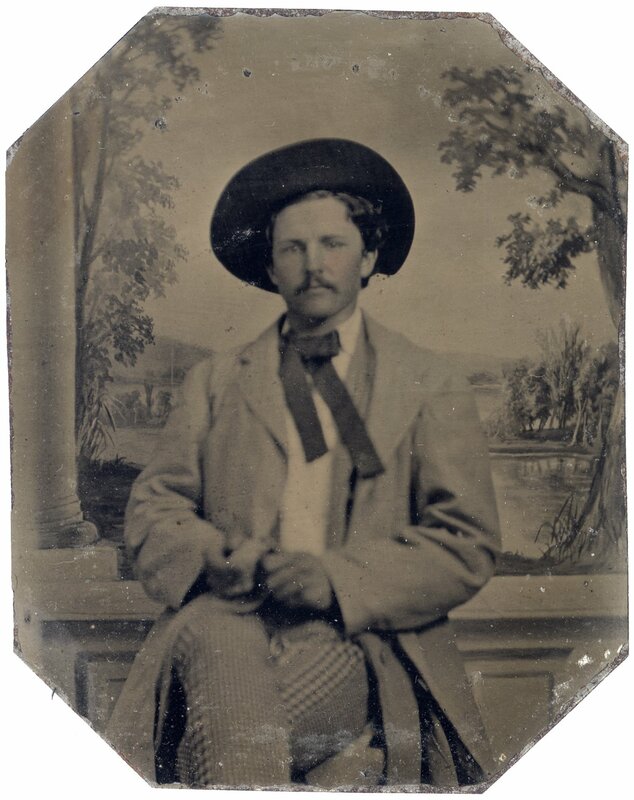 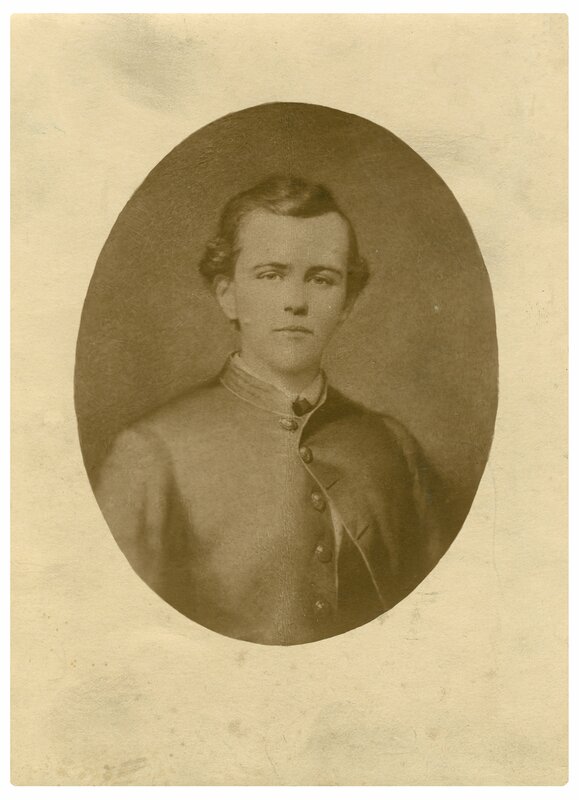 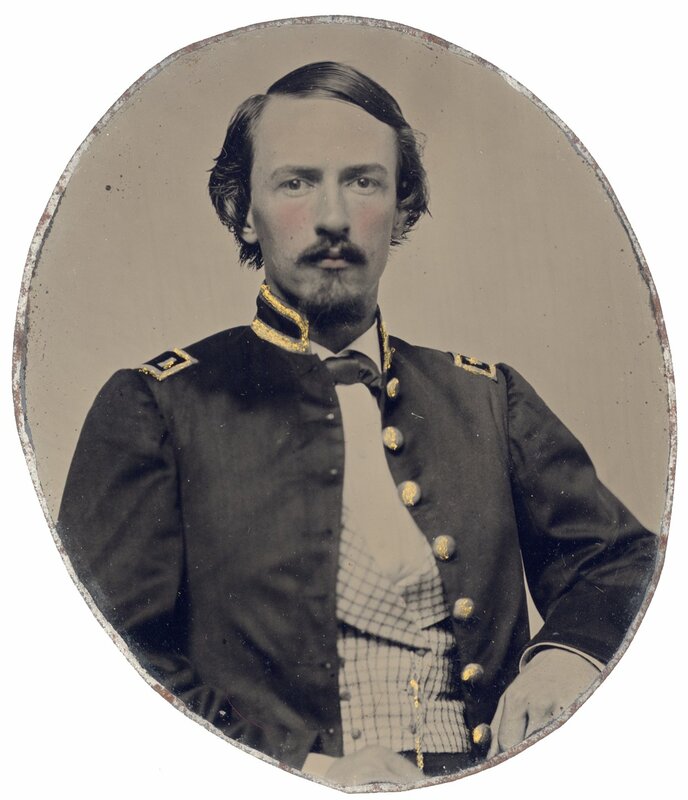 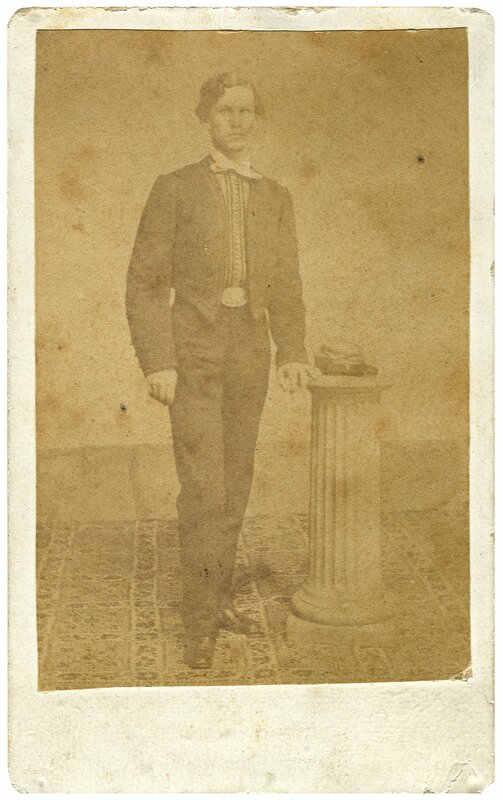 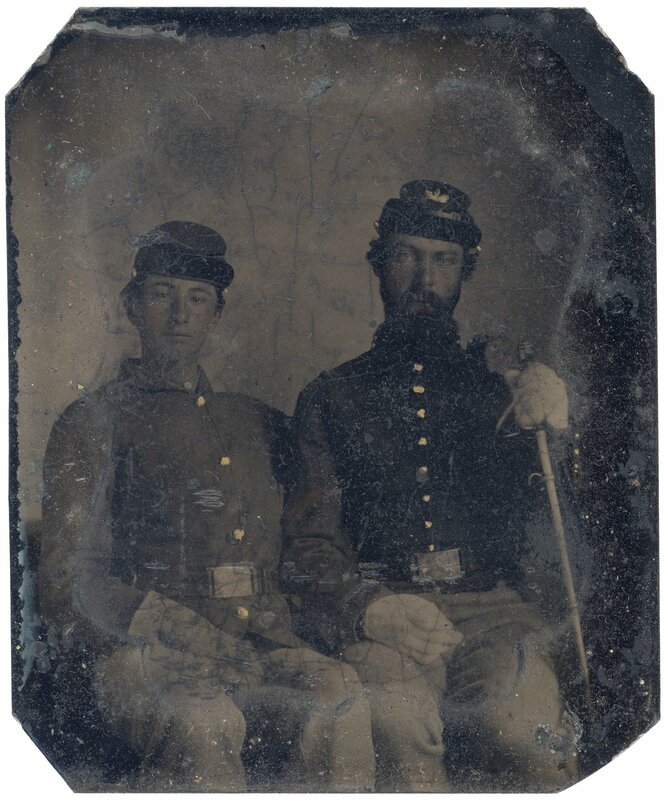 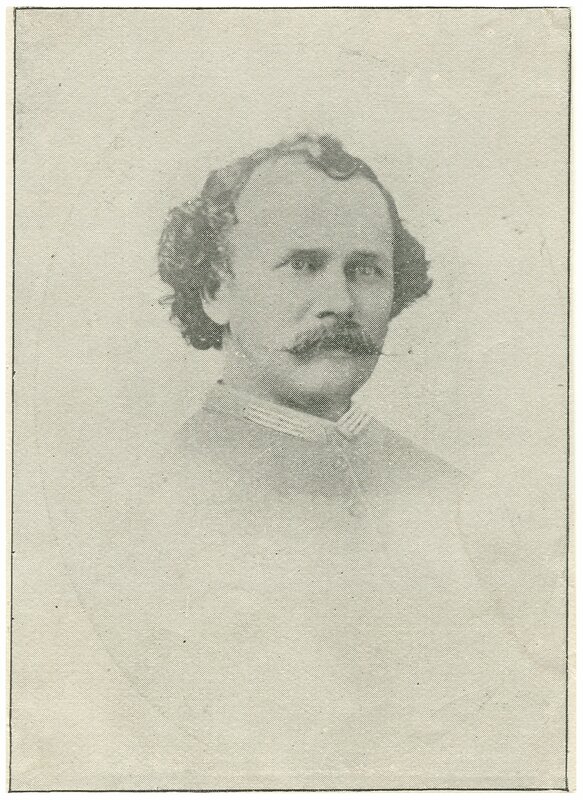 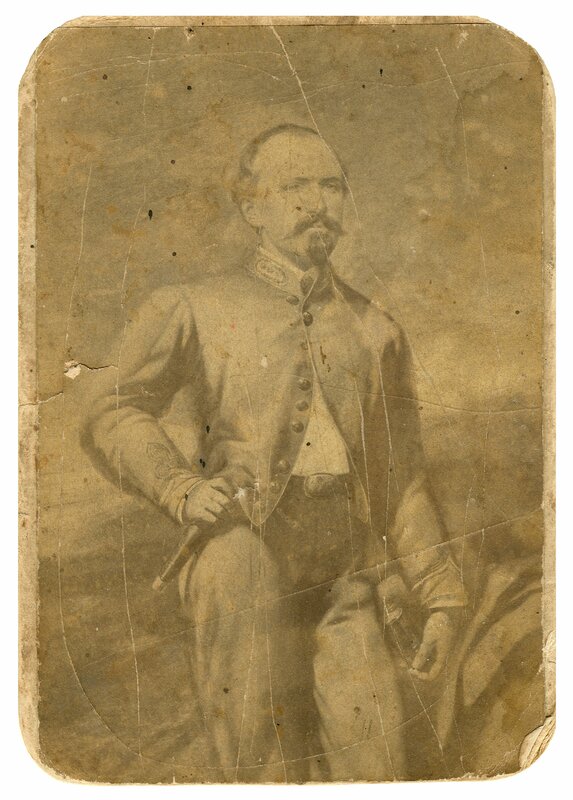 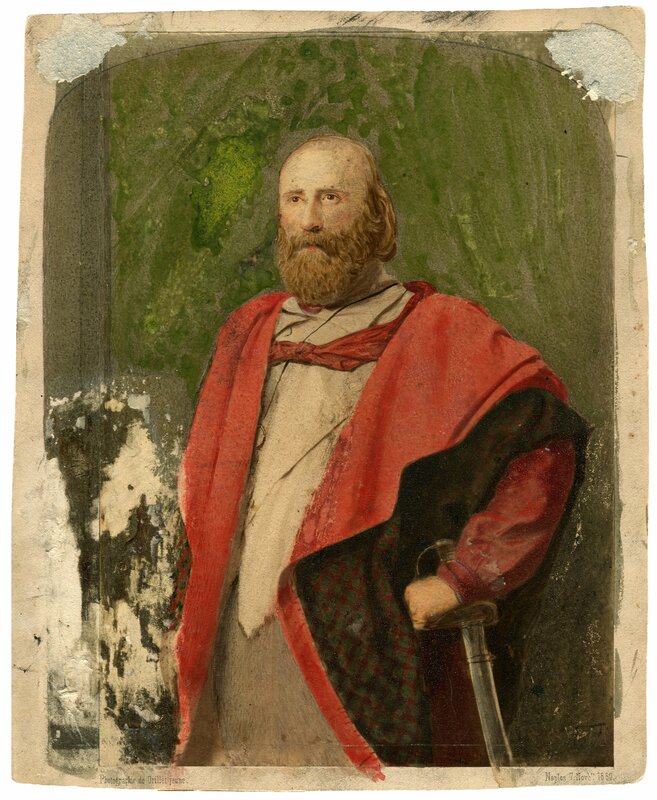 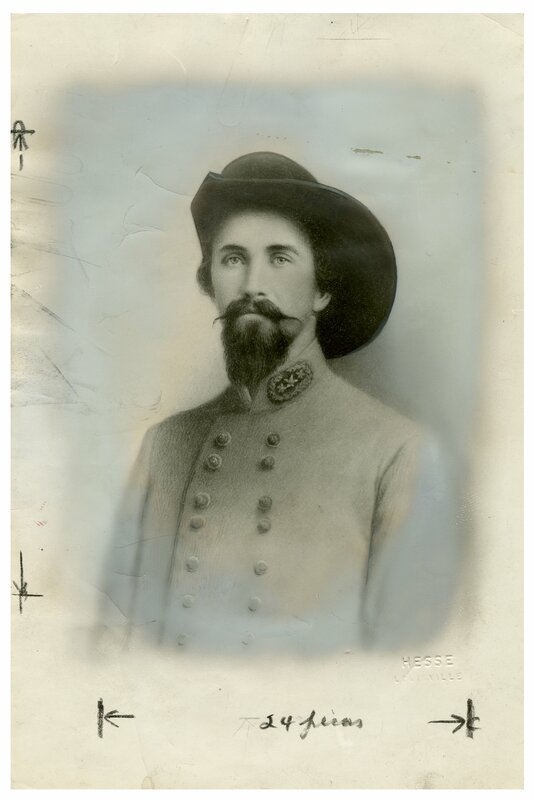 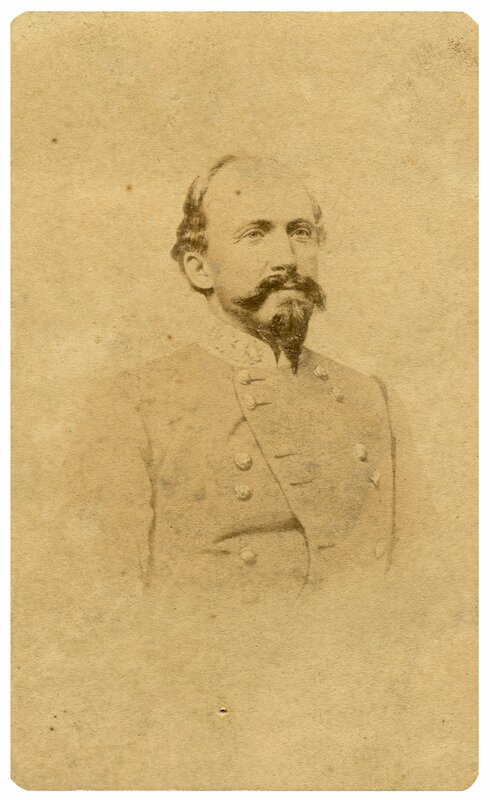 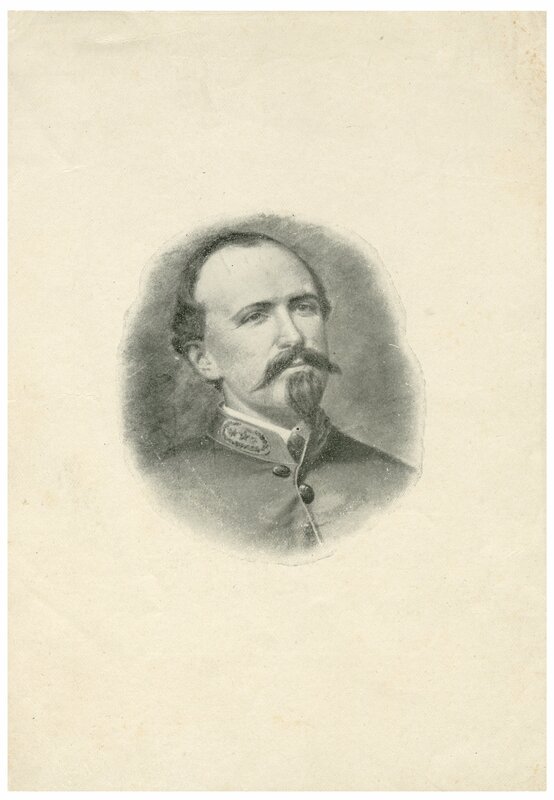 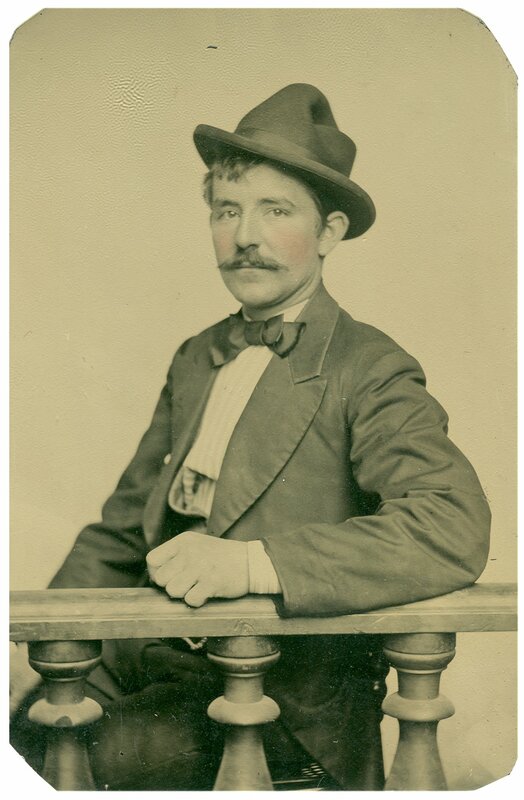 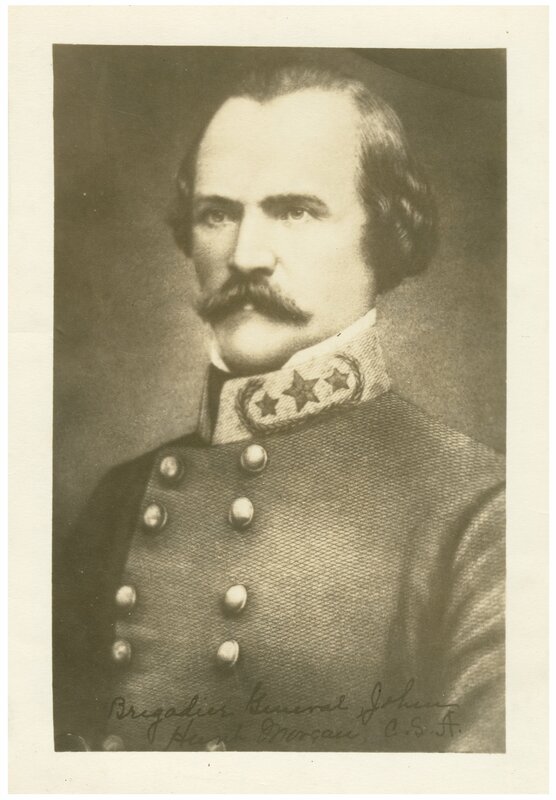 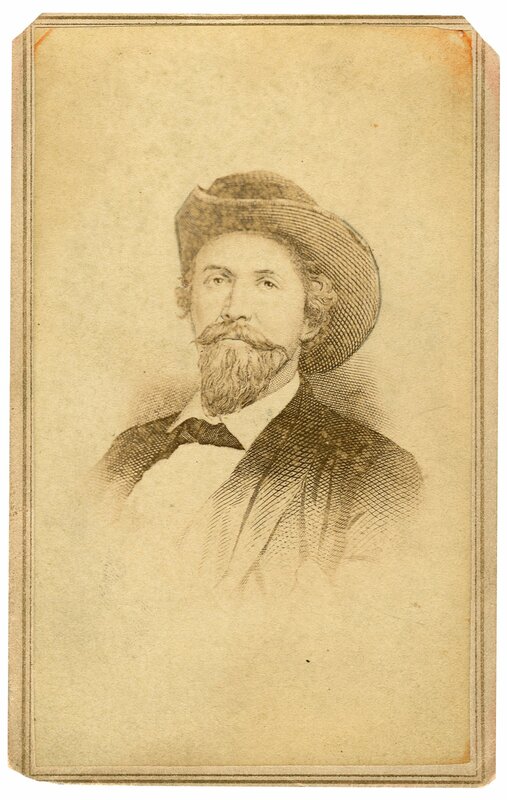 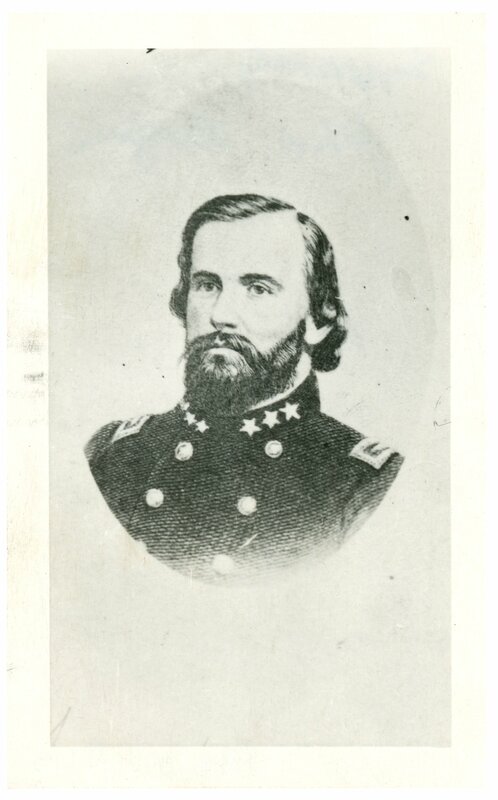 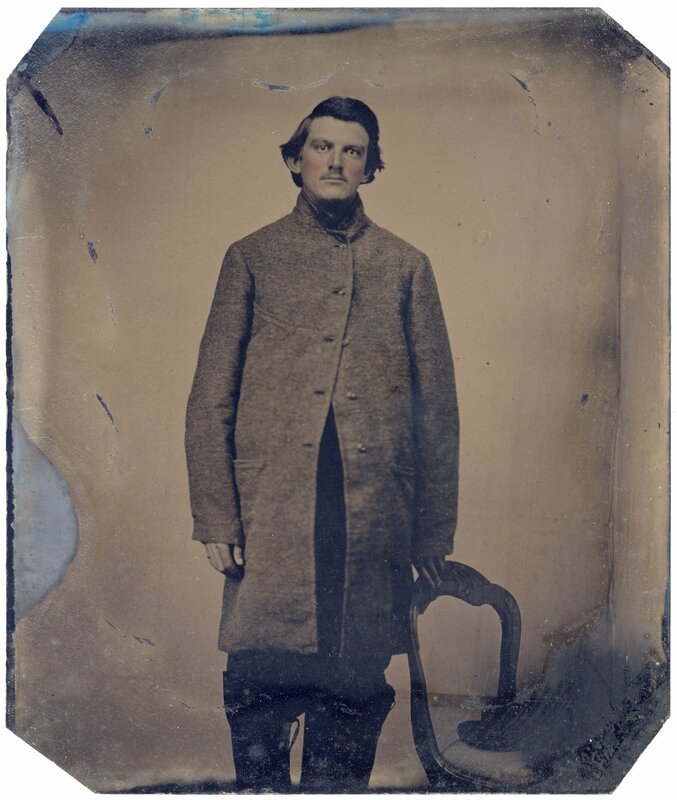 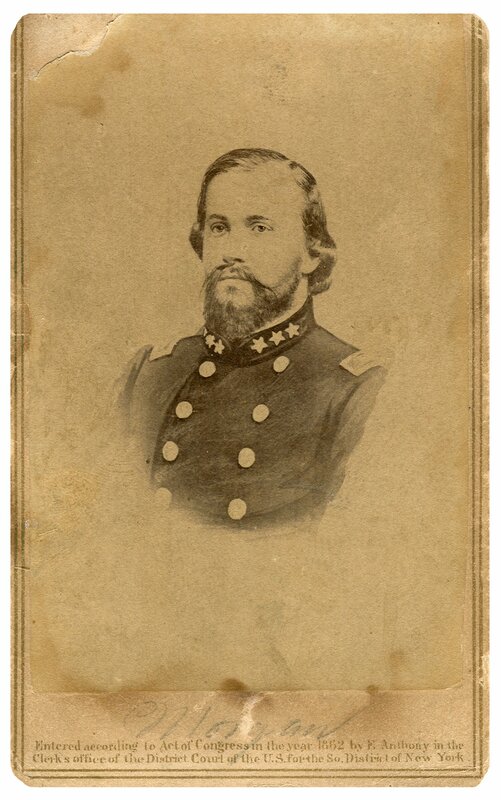 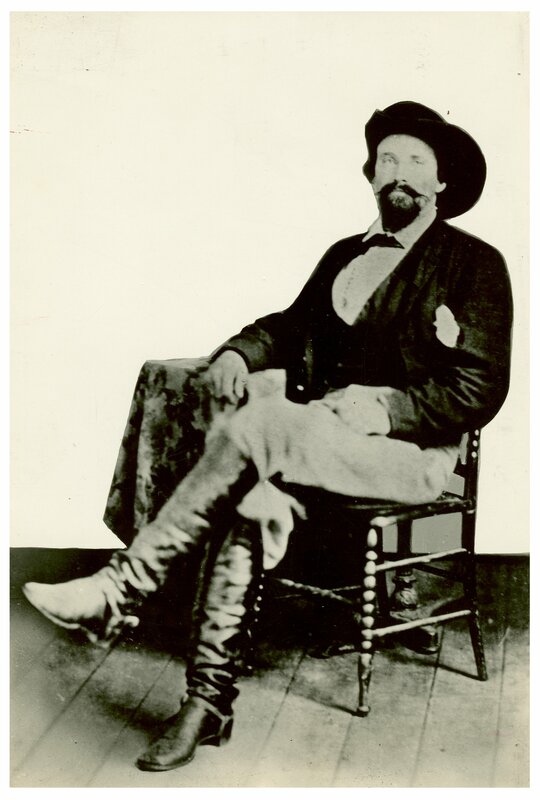 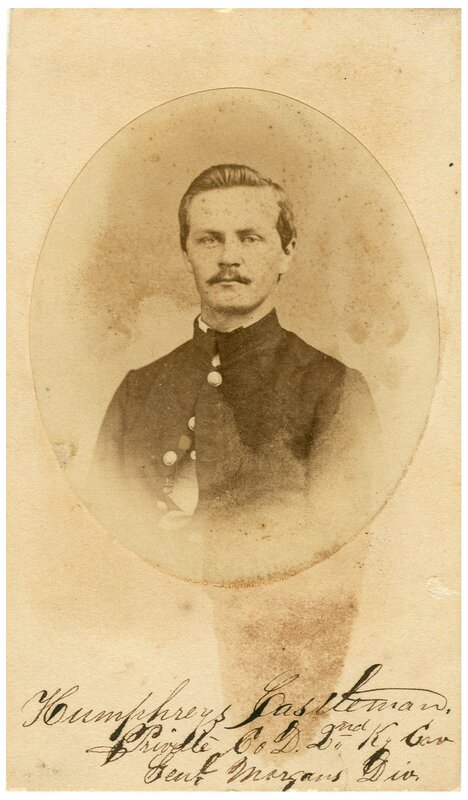 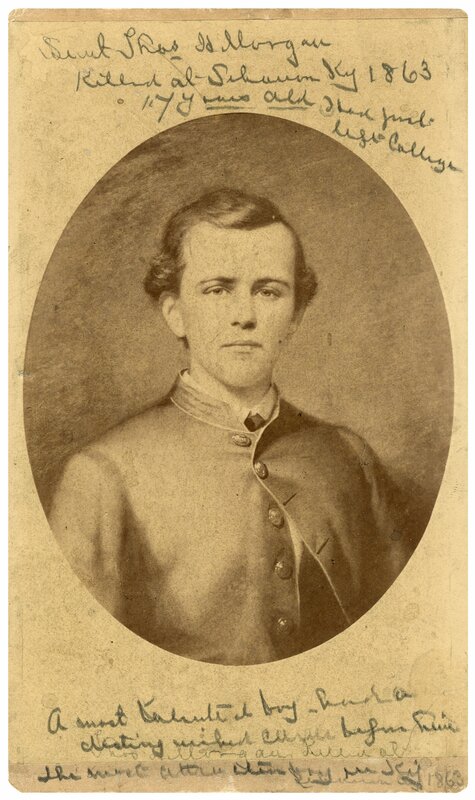 John Hunt Morgan excelled as a horseman from a childhood spent on a Bluegrass farm along Tates Creek Pike, Fayette County, Kentucky and served in the First Kentucky Cavalry with his brother Calvin and his uncle Alexander Morgan in the Mexican War. 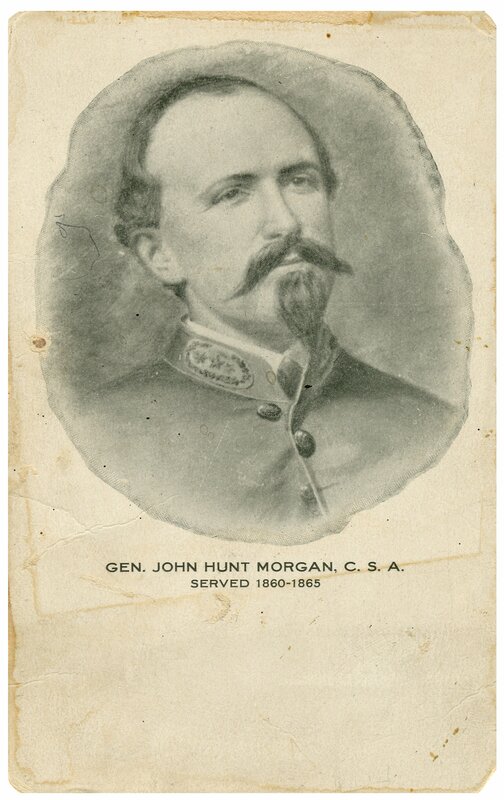 On his return, John Hunt Morgan operated a profitable hemp farm and wool mill. 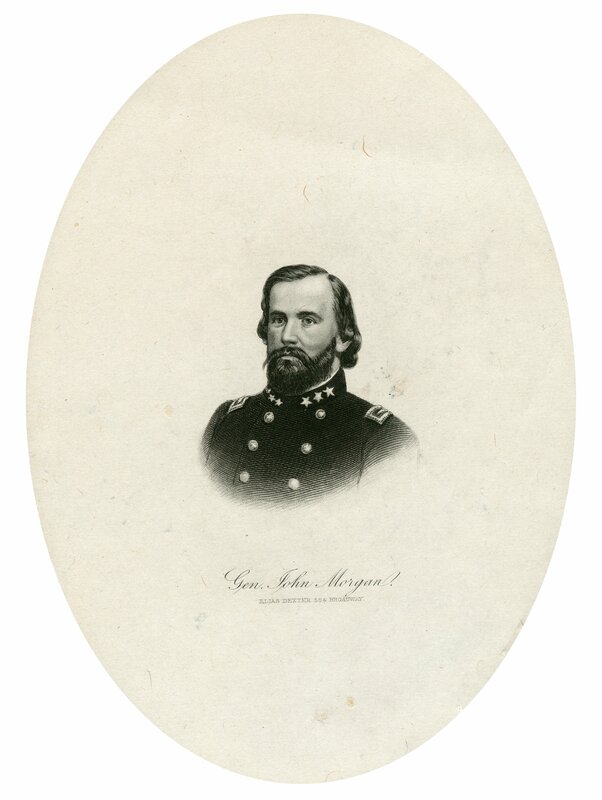 Morgan’s chief fame, however, emerged from his service in the Civil War. 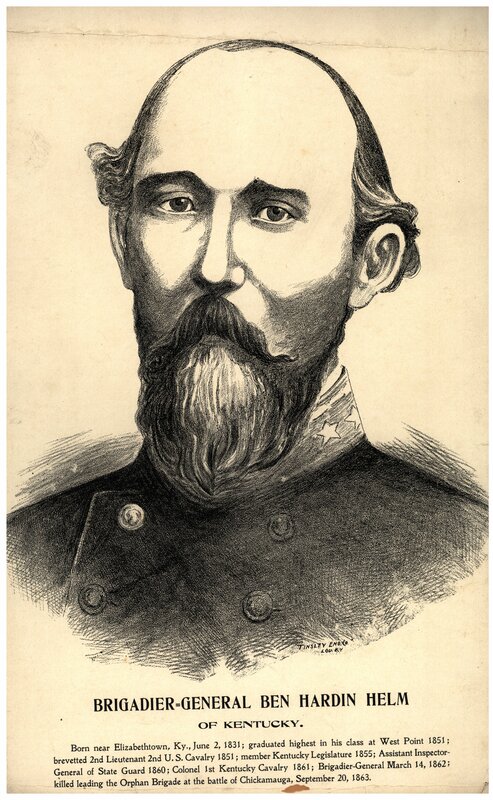 Christened Thunderbolt of the Confederacy by an adoring South, he was described as King of the Horse Thieves by Northern sympathizers. 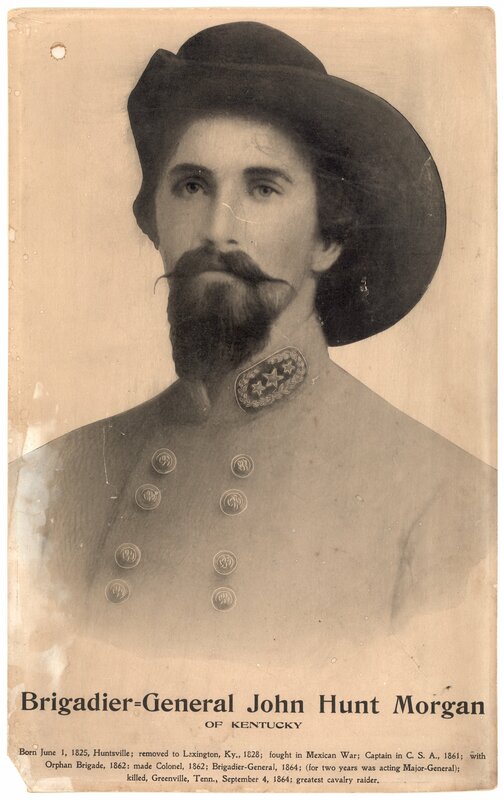 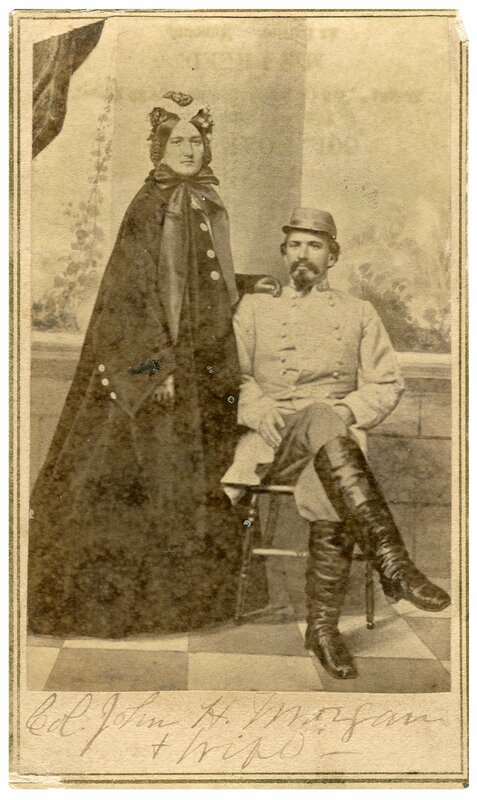 Centering his raids on Kentucky, Morgan supported Confederate General Braxton Bragg’s campaigns in Kentucky and Tennessee and instituted new practices of military tactics with his masquerades as a Union trooper behind enemy lines and his use of civilians in his raids. 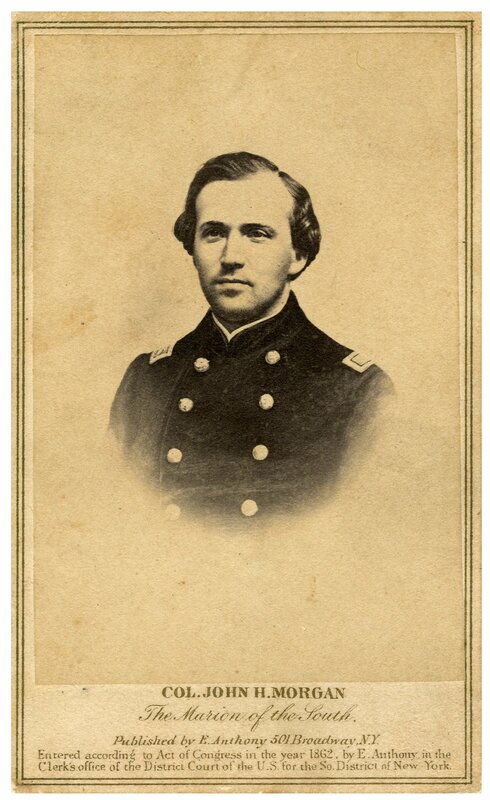 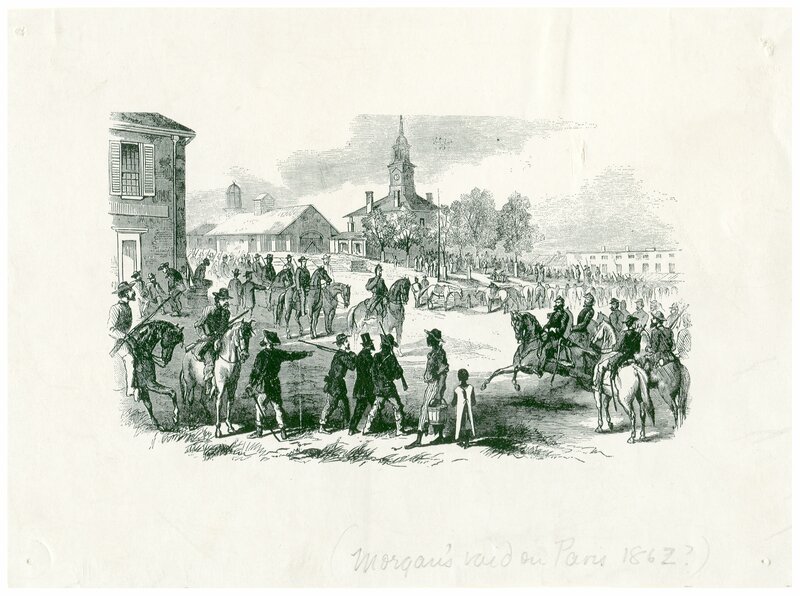 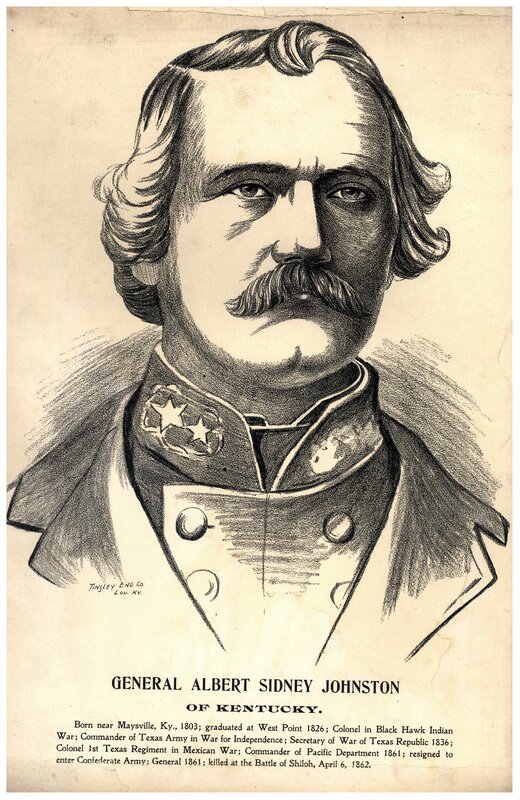 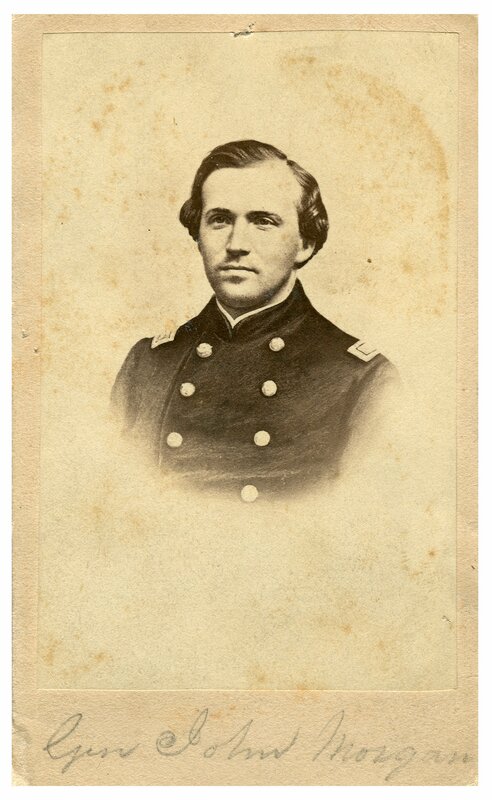 His Great Raid of June 1863 took the war into Ohio and coincided with Lee’s invasion of Pennsylvania in an attempt to take the war to the North. 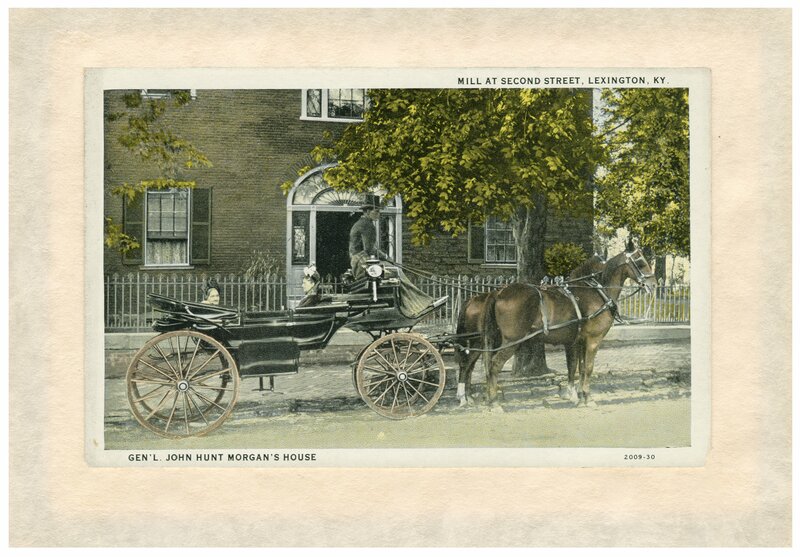 Morgan legends abound, from his dramatic escape from Ohio’s federal penitentiary to a ride through his mother’s house on horseback to kiss her goodbye. 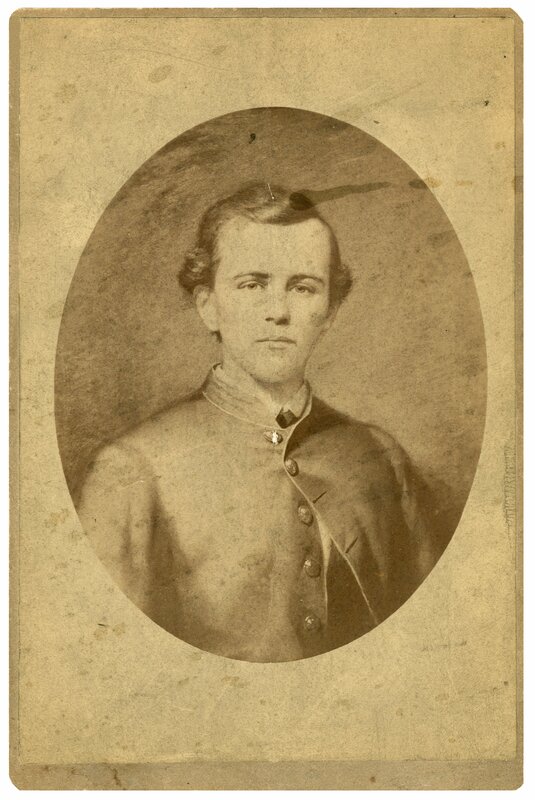 His death September 4, 1864, was the cause of intense mourning throughout the South. 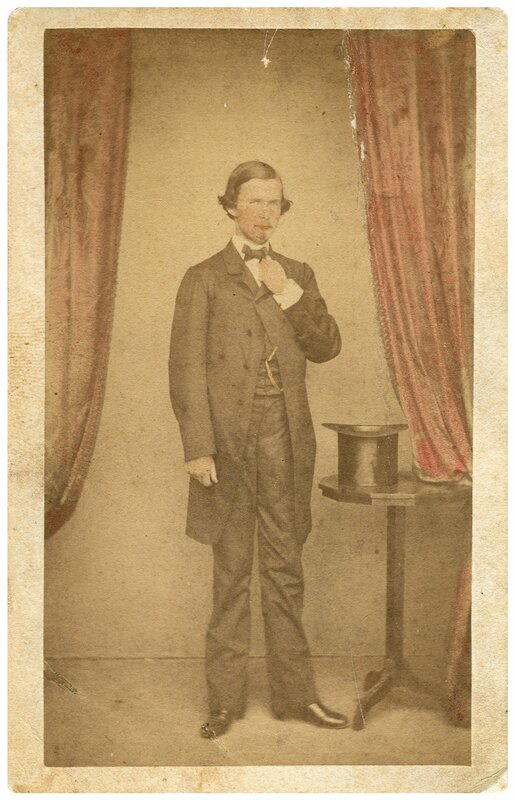 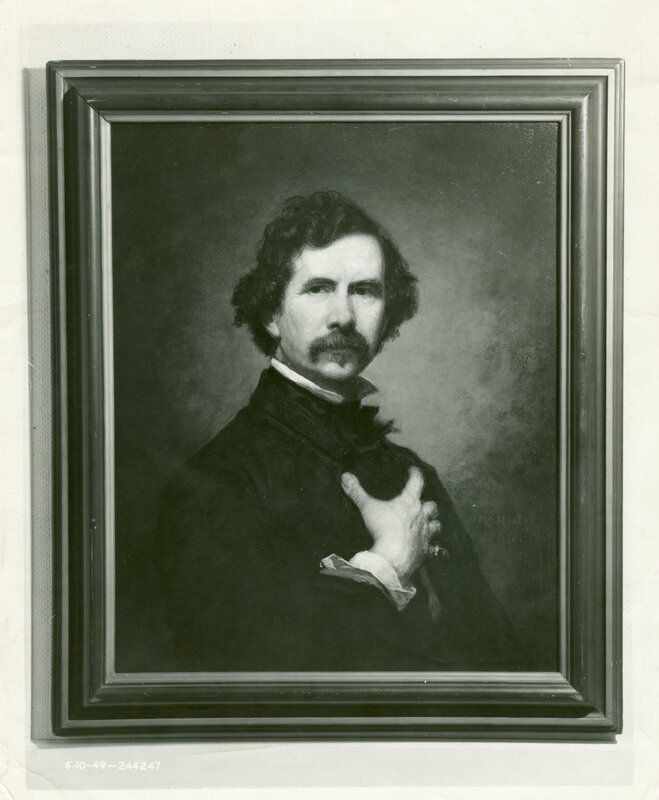 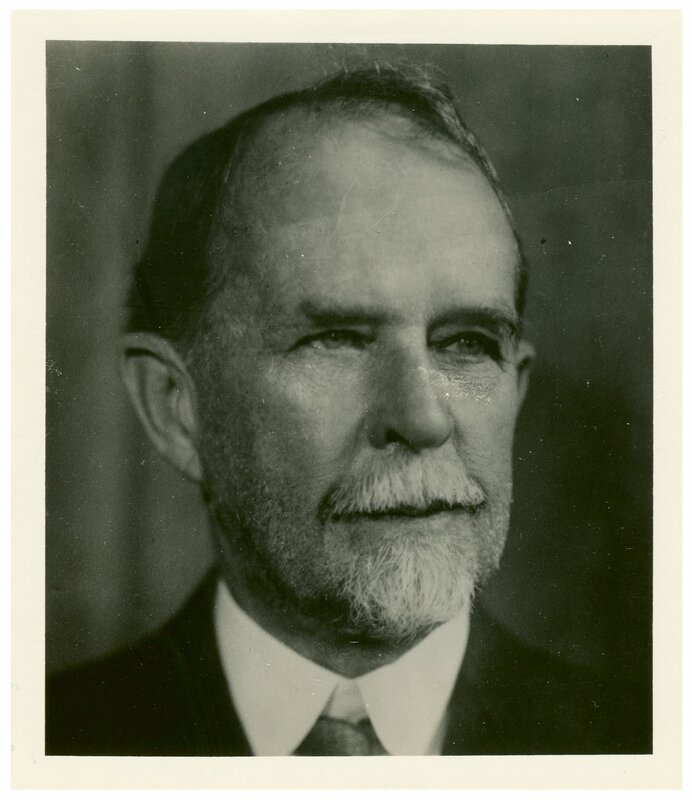 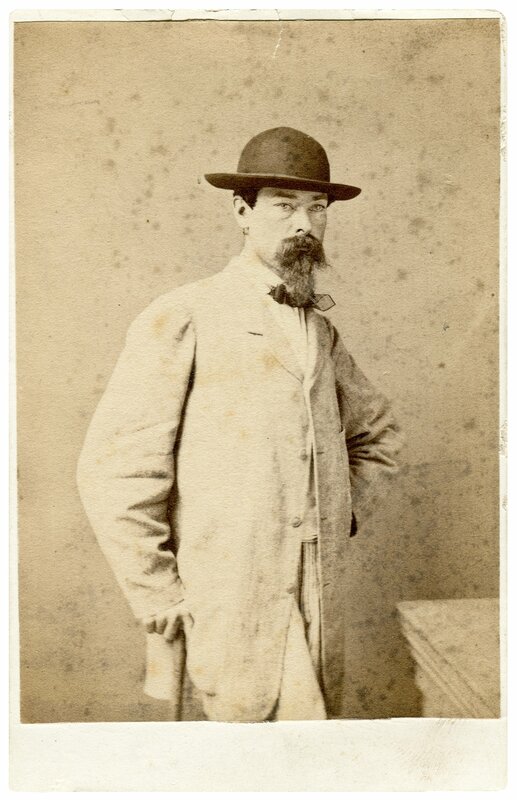 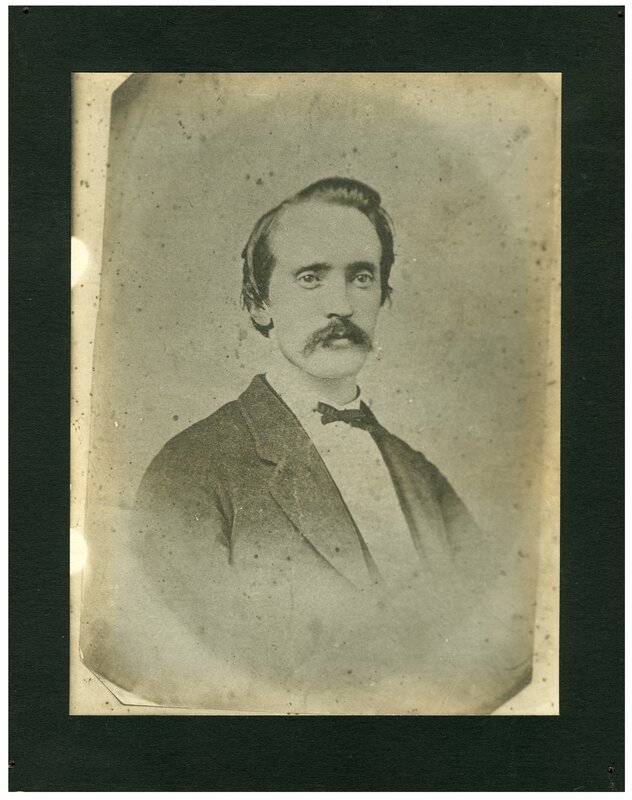 John Hunt Morgan’s nephew, Thomas Hunt Morgan, brought international fame to the family and the Bluegrass in becoming the first Kentuckian to win a Nobel Prize. 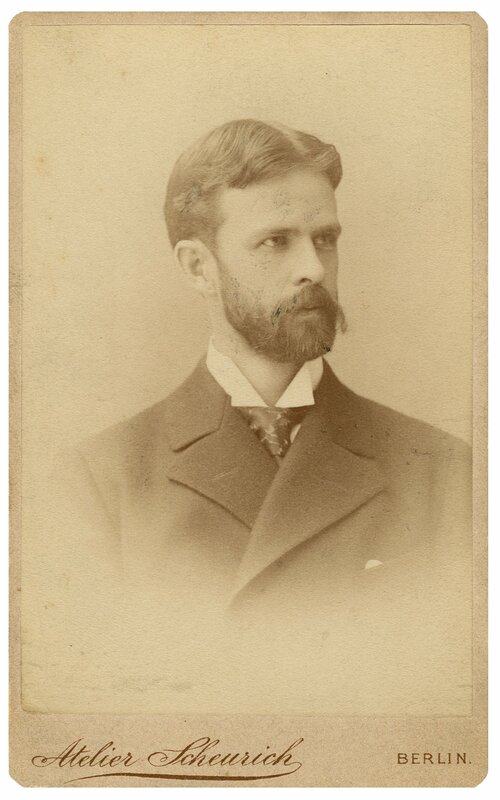 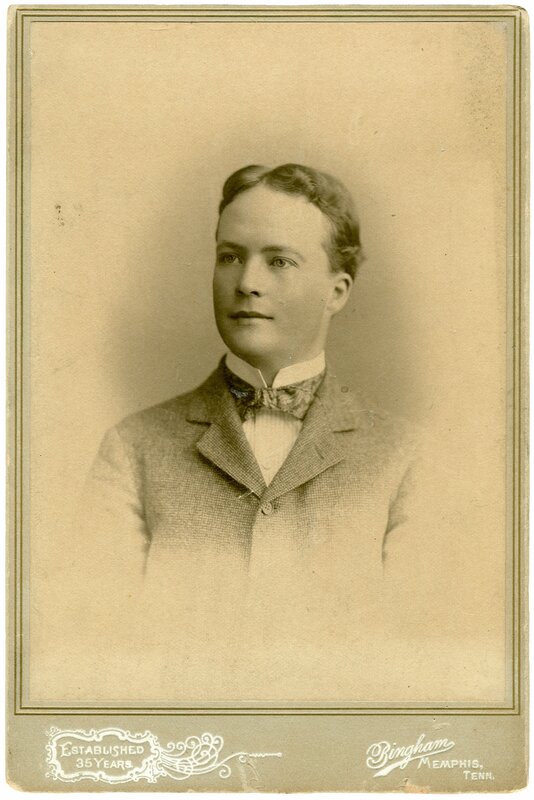 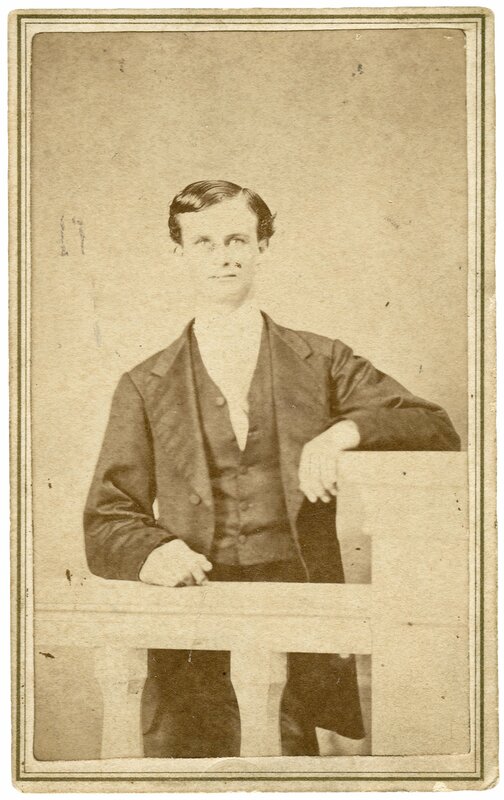 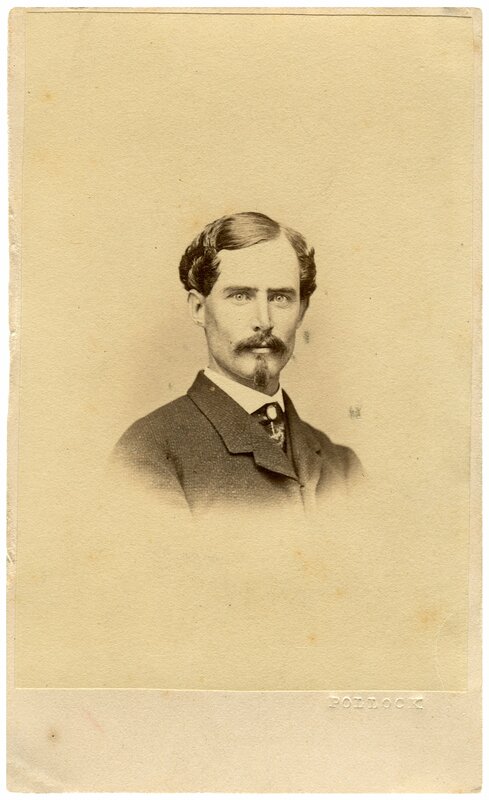 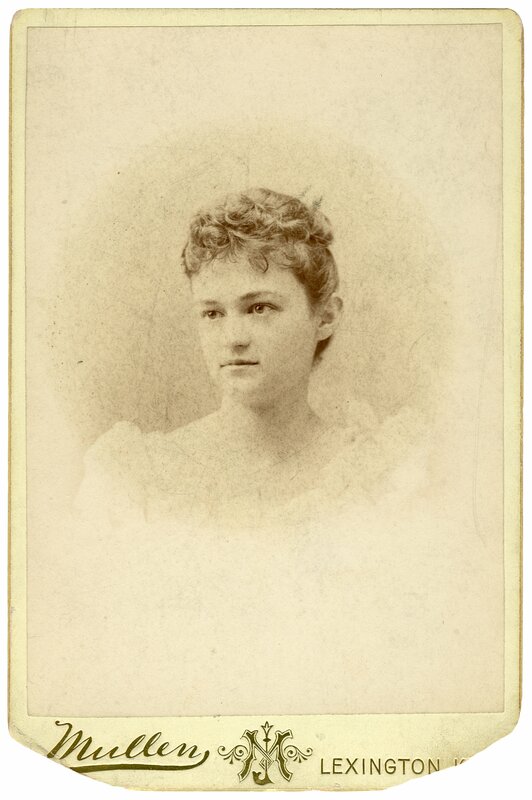 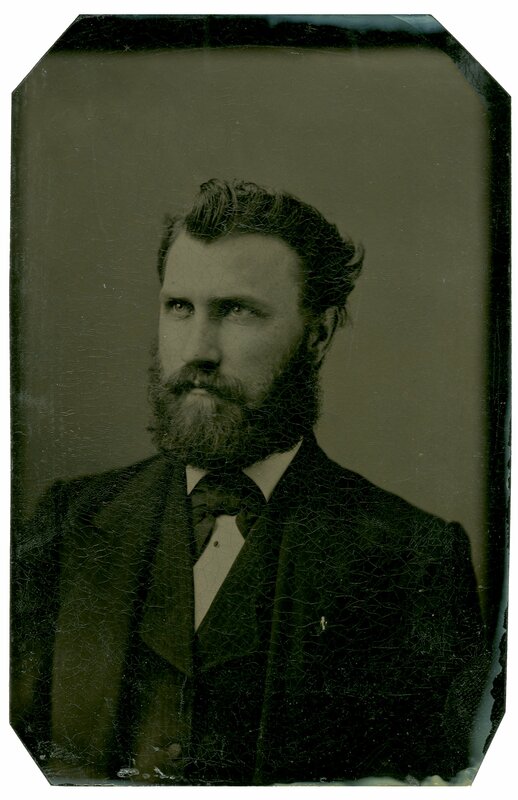 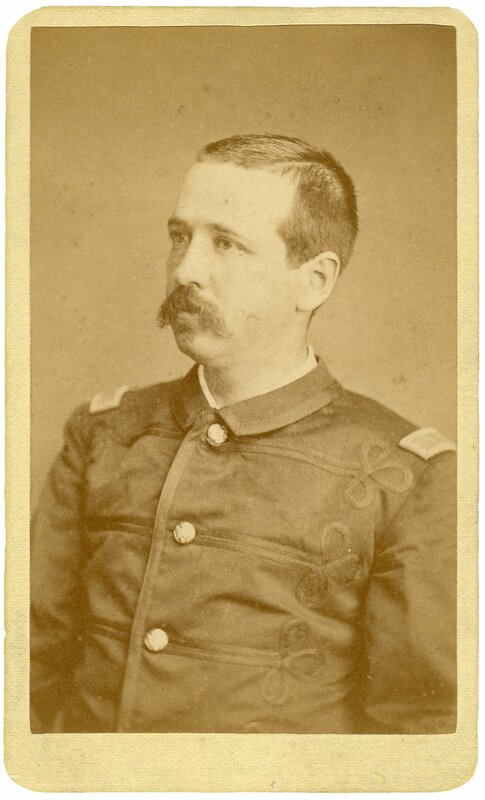 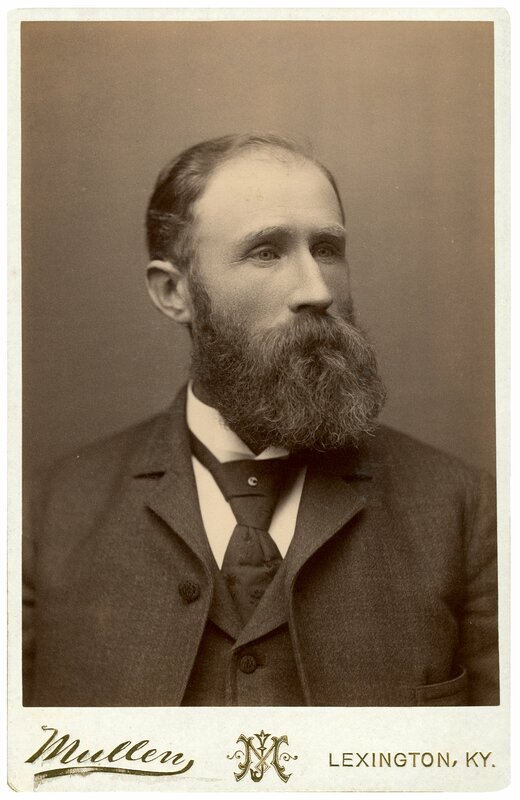 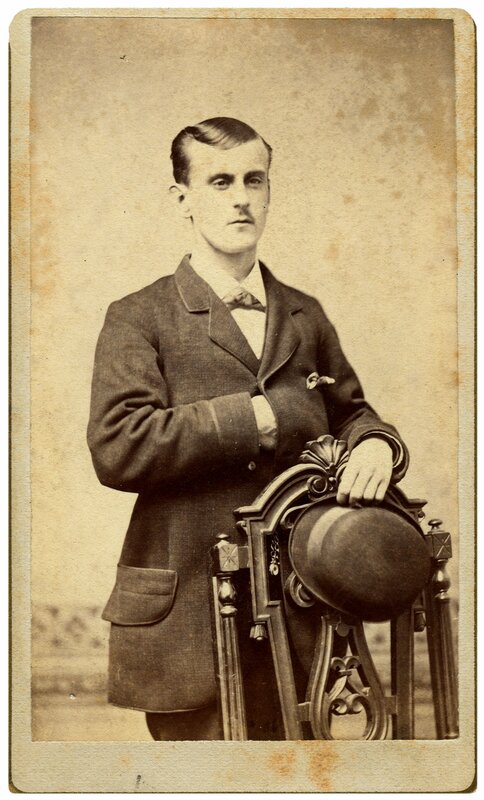 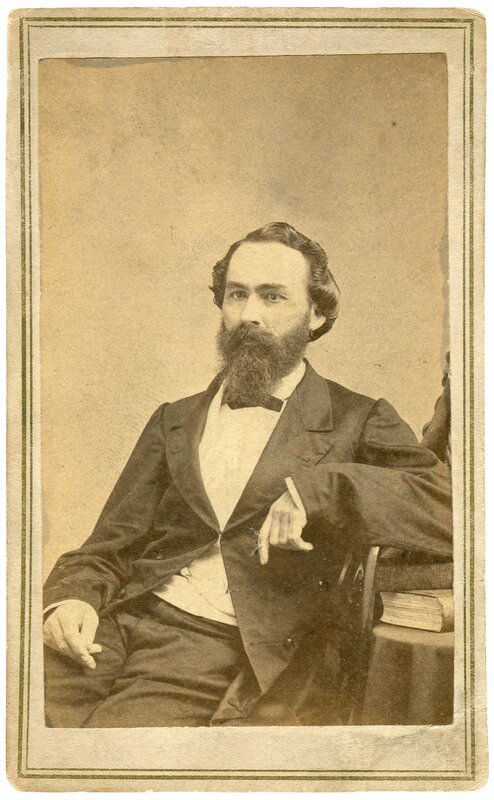 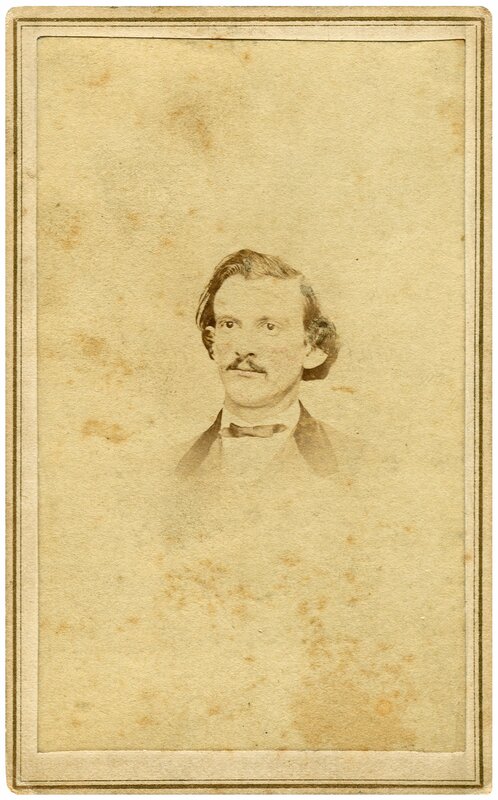 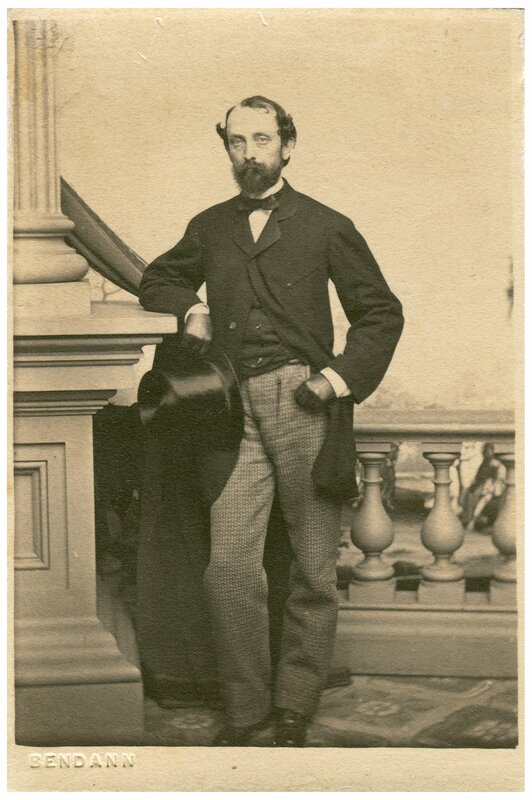 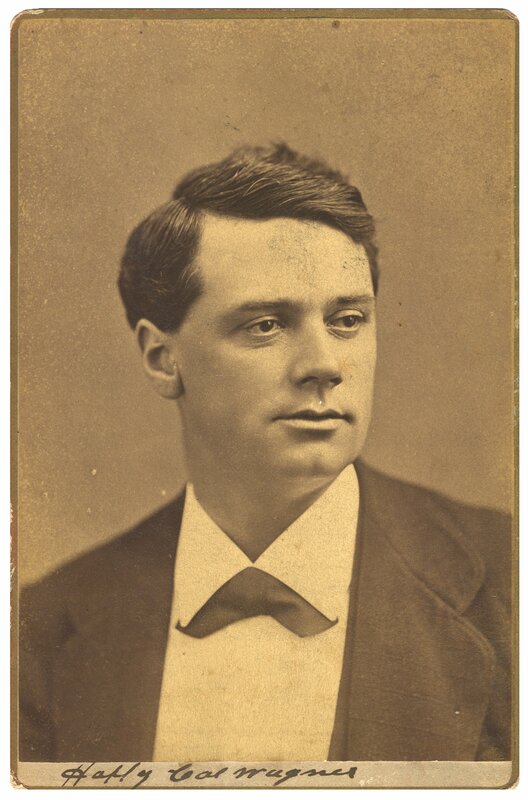 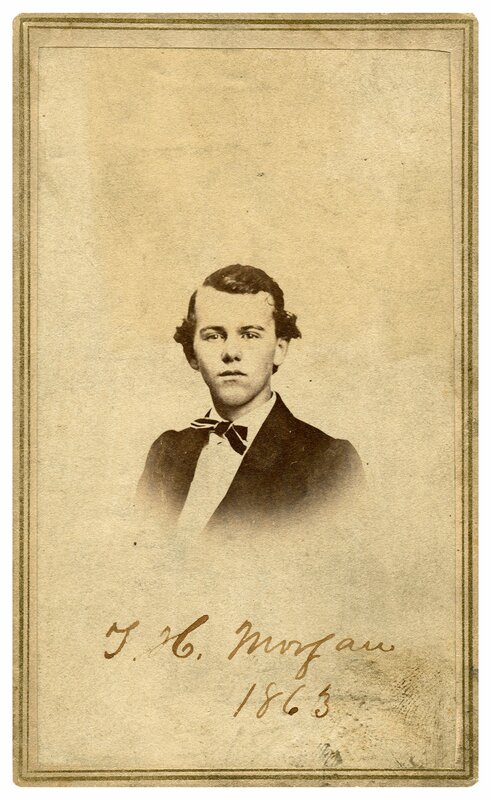 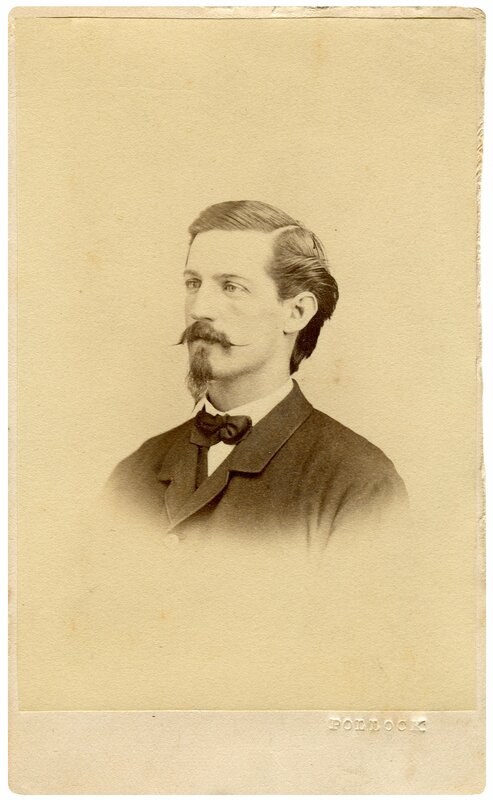 Thomas Hunt Morgan graduated valedictorian in 1886, receiving the only Bachelor of Science degree awarded by the State College of Kentucky (later the University of Kentucky). 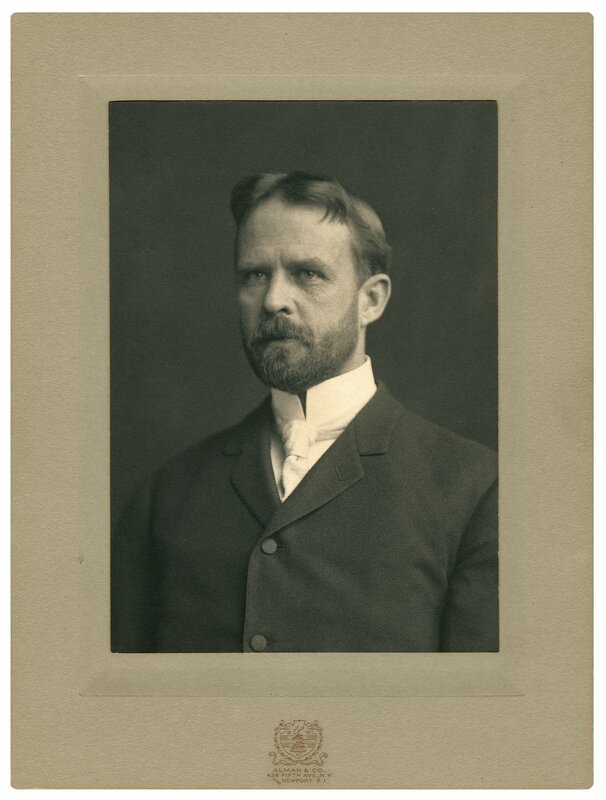 He continued his studies of biology at Johns Hopkins for the next several years, receiving his doctorate there in 1890. 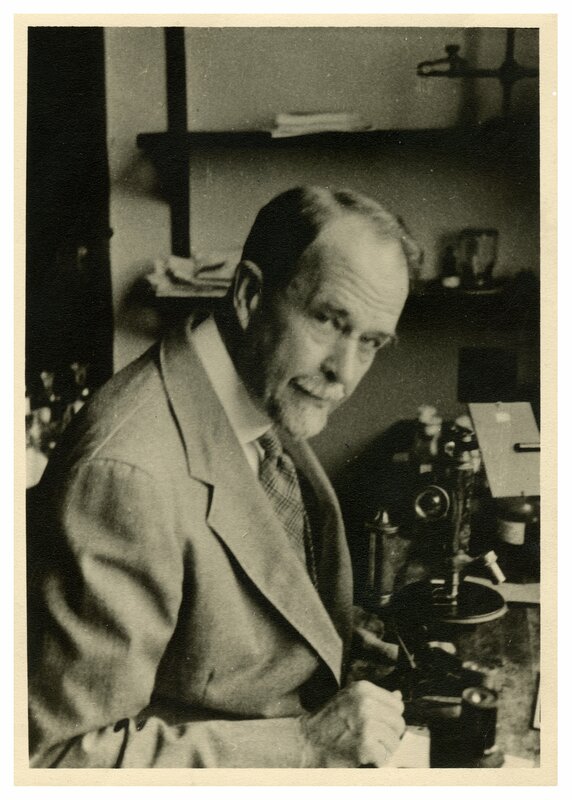 He began his teaching career at Bryn Mawr, later becoming professor of experimental zoology at Columbia University (1904-1928) and Caltech (1928-1945). 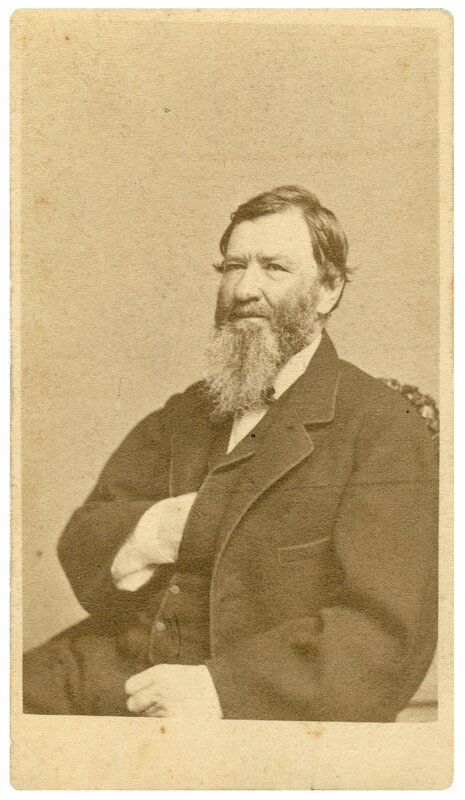 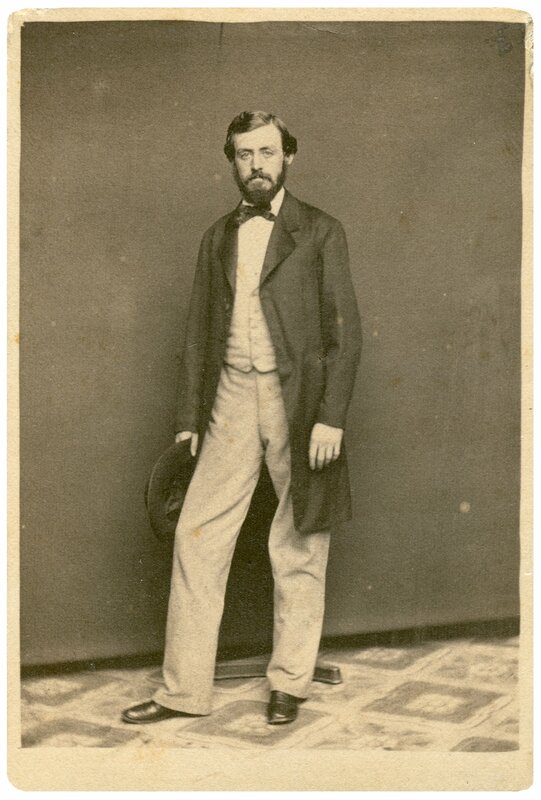 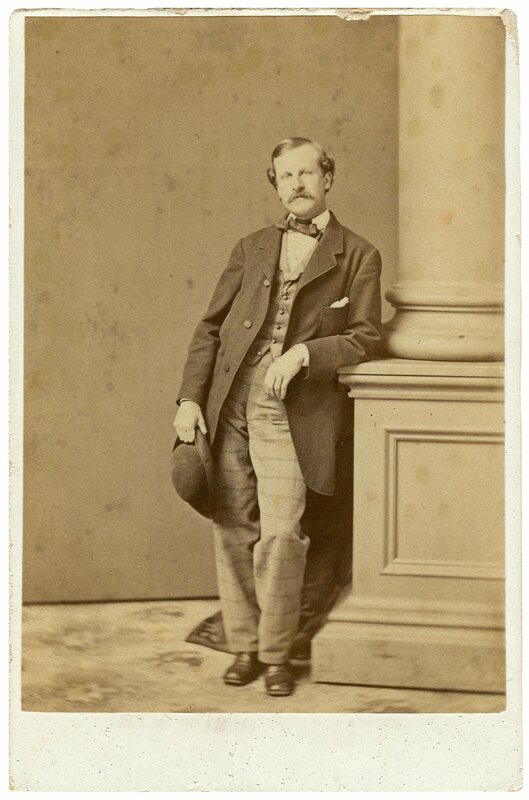 Thomas Hunt Morgan began his work in experimental embryology at Columbia University where he strove to determine the influence of heredity and mutation on evolution. 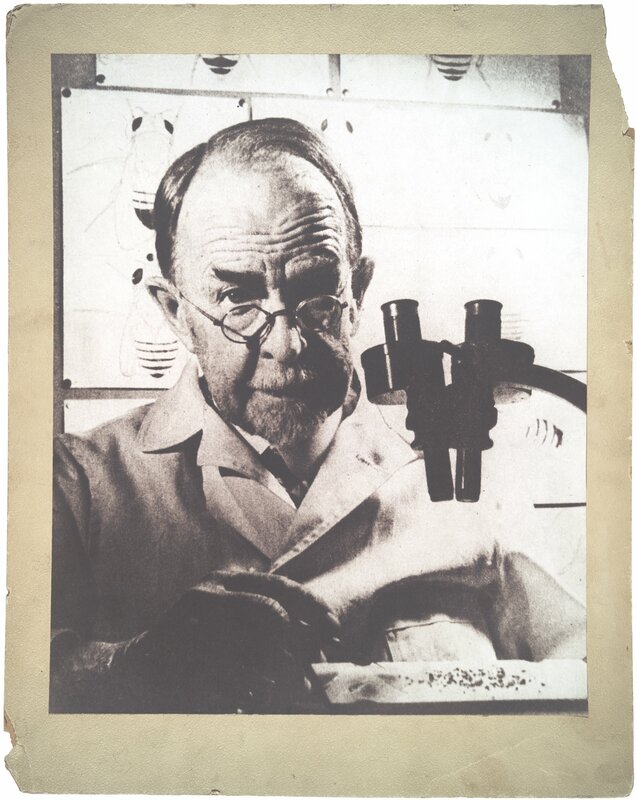 The fruitfly Drosophila became his main experimental vehicle and by 1910 he began dedicated gene mapping. 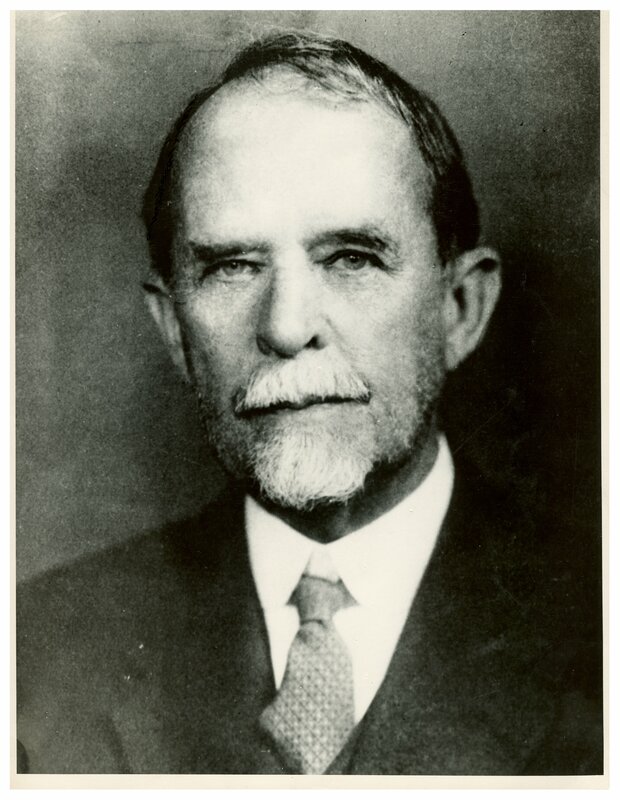 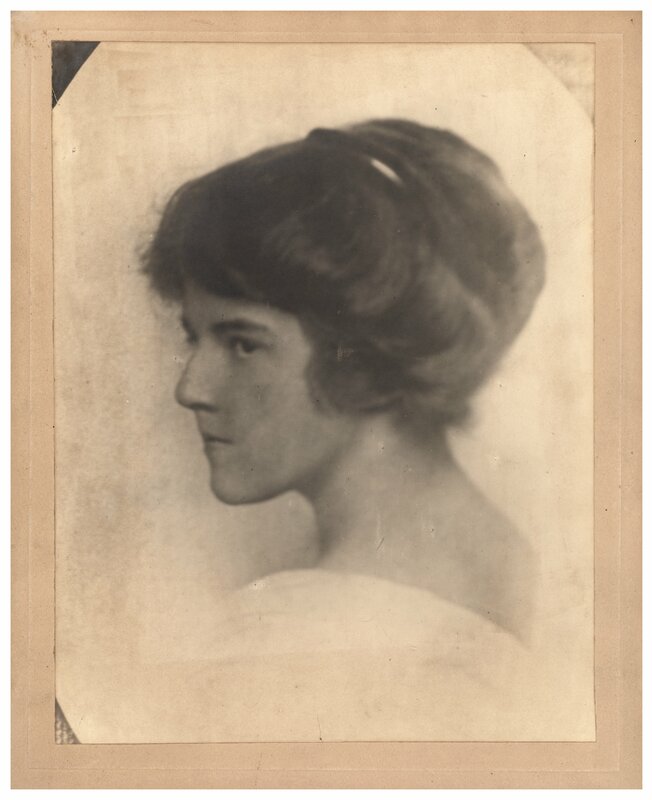 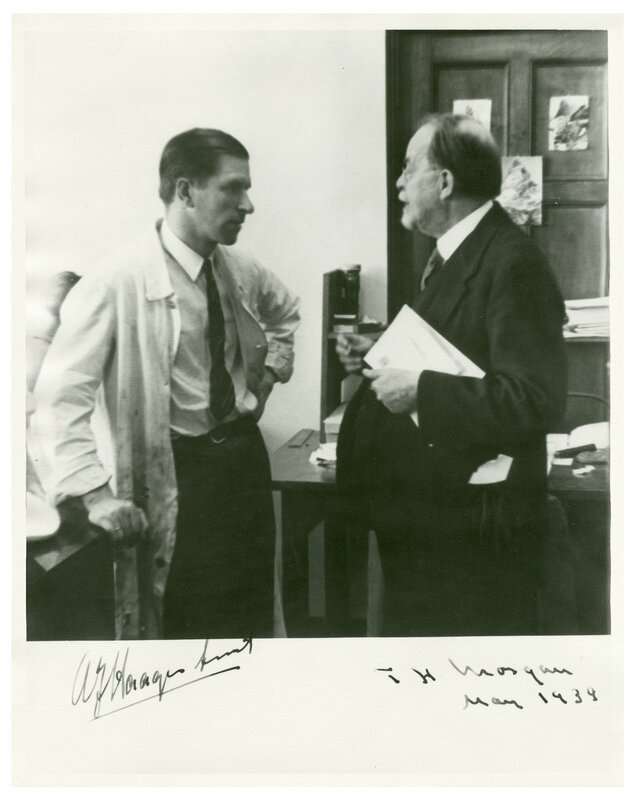 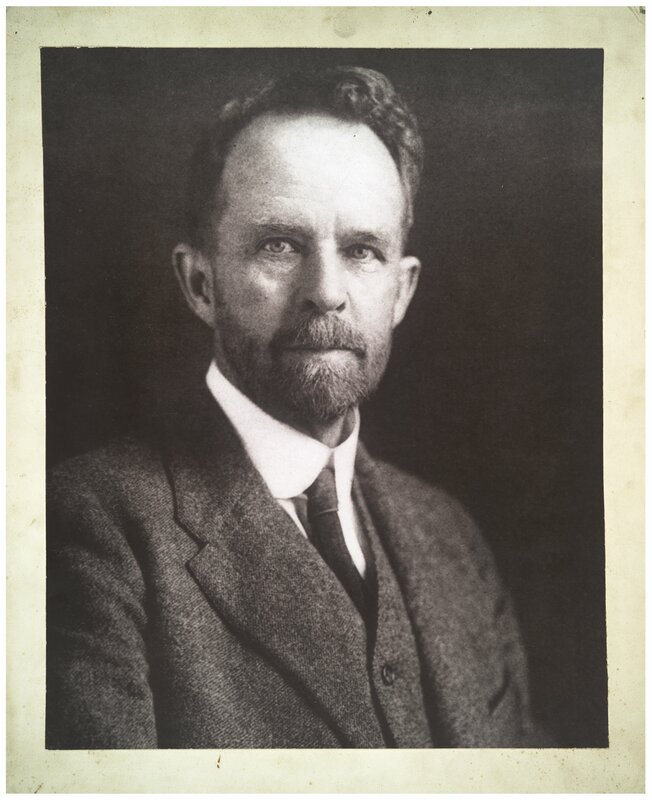 In 1915, Morgan and his associates Calvin Bridges and Alfred Sturtevant published The Mechanics of Mendelian Heredity, which established the Drosophila as the model agent for the study of genetics and Mendelian gene mapping. 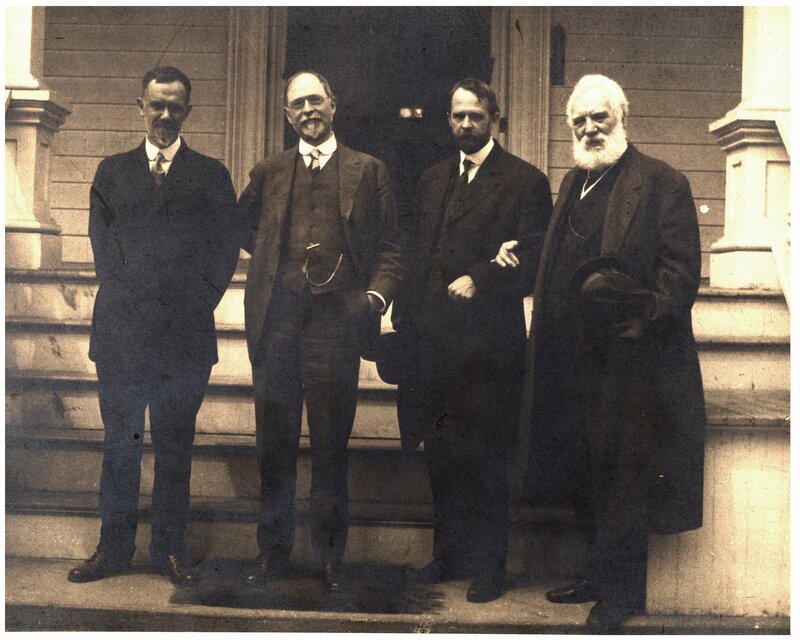 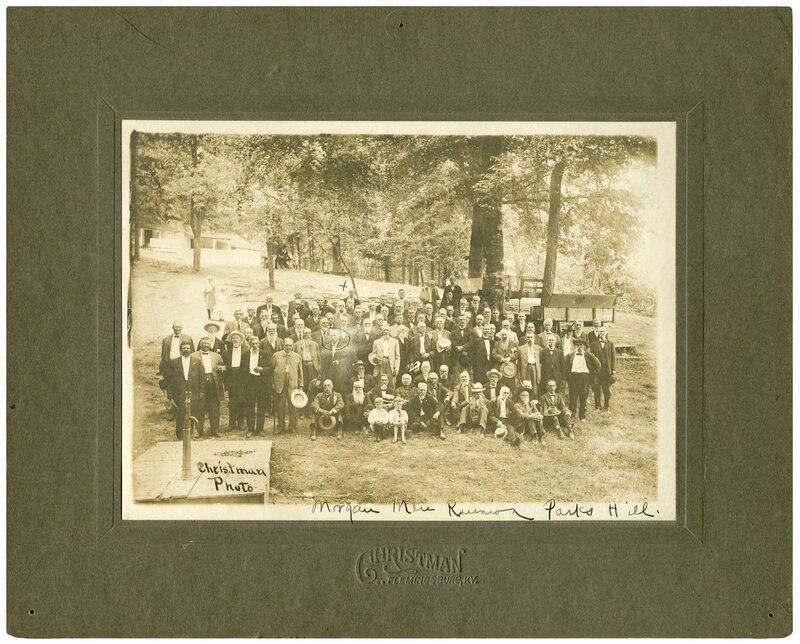 The group continued to work together after leaving Columbia for Caltech until Morgan’s death in 1945. 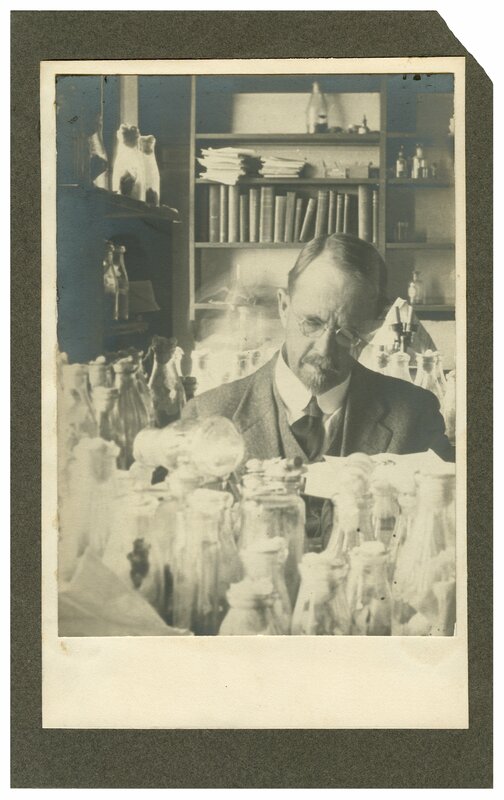 Although nominated in 1919 and in 1930 for the same work, Morgan received the Nobel Prize in Physiology (or Medicine) in 1933. 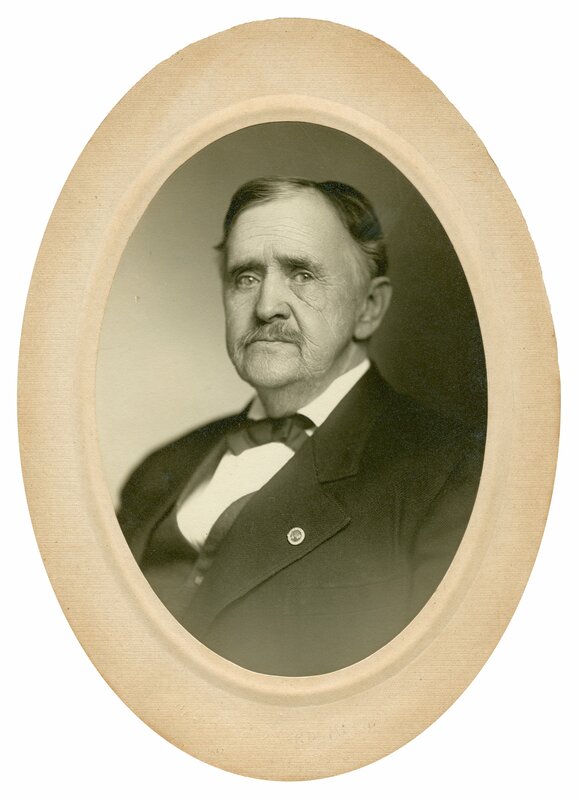 Ramage, James A. 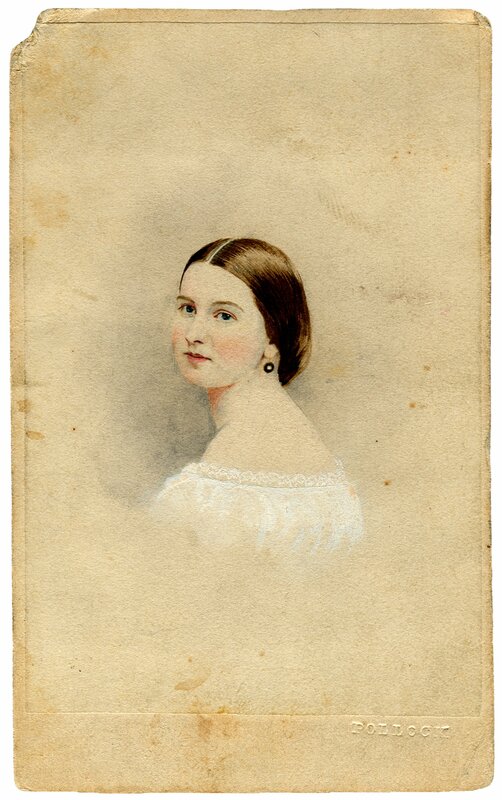 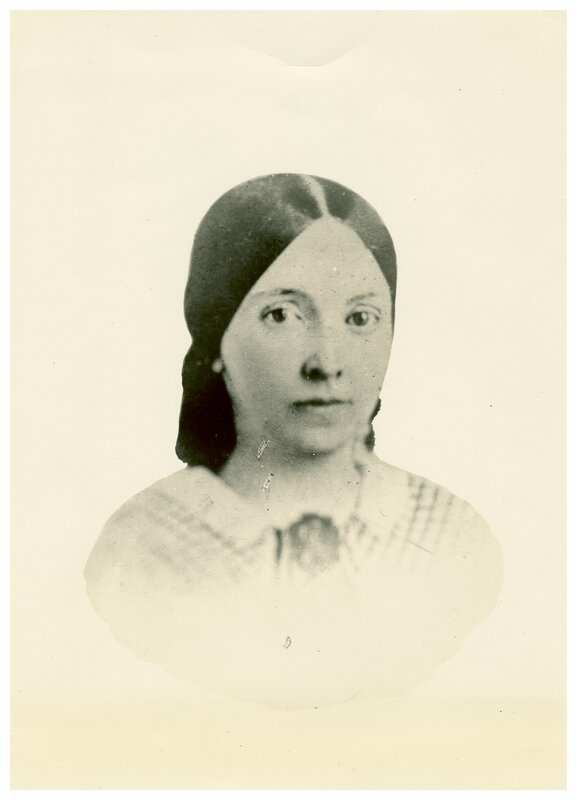 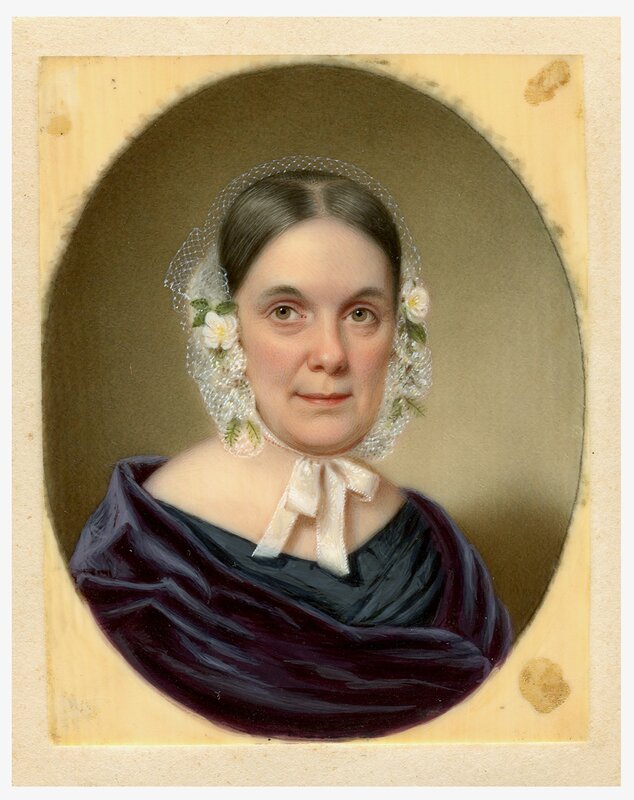 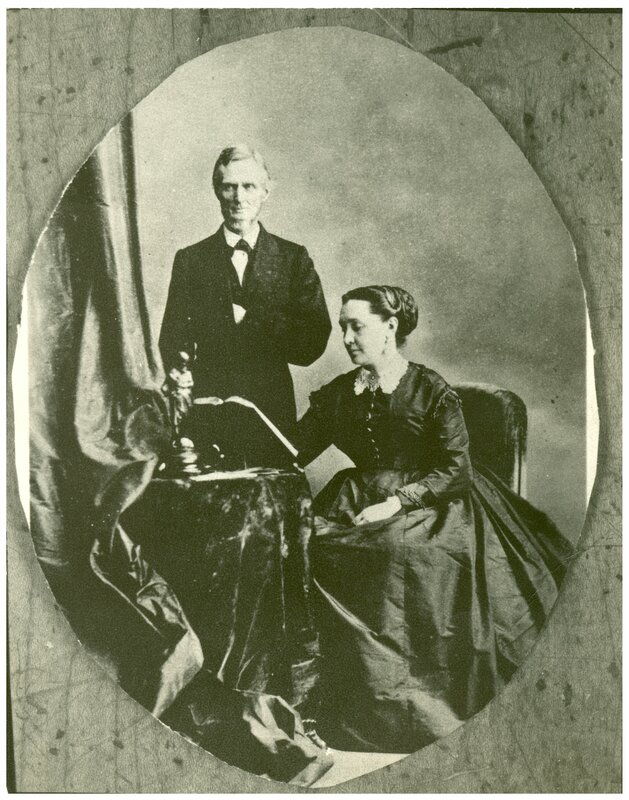 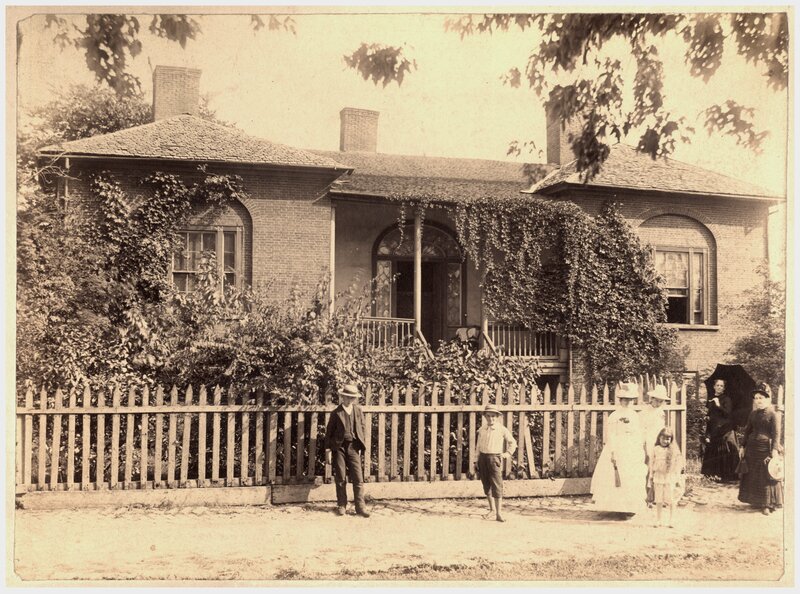 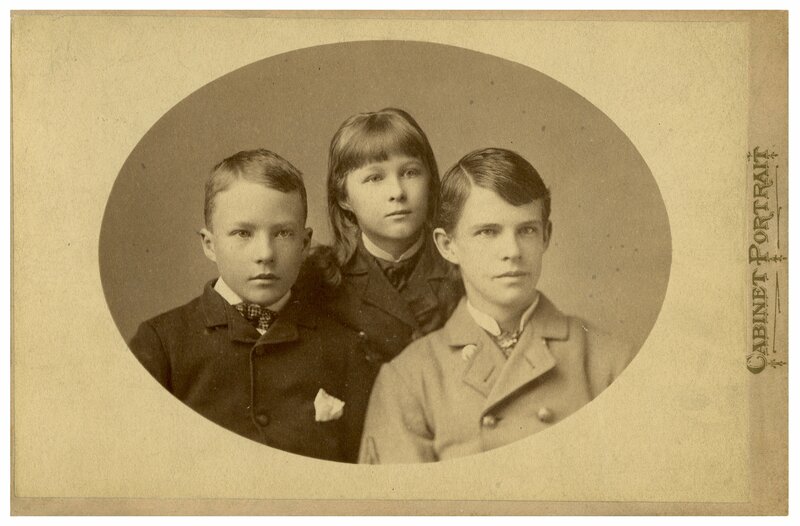 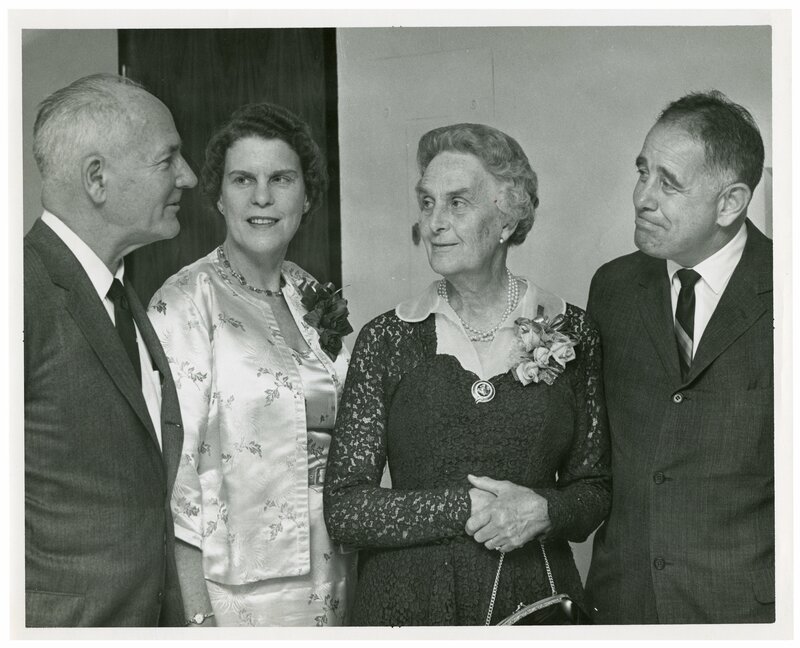 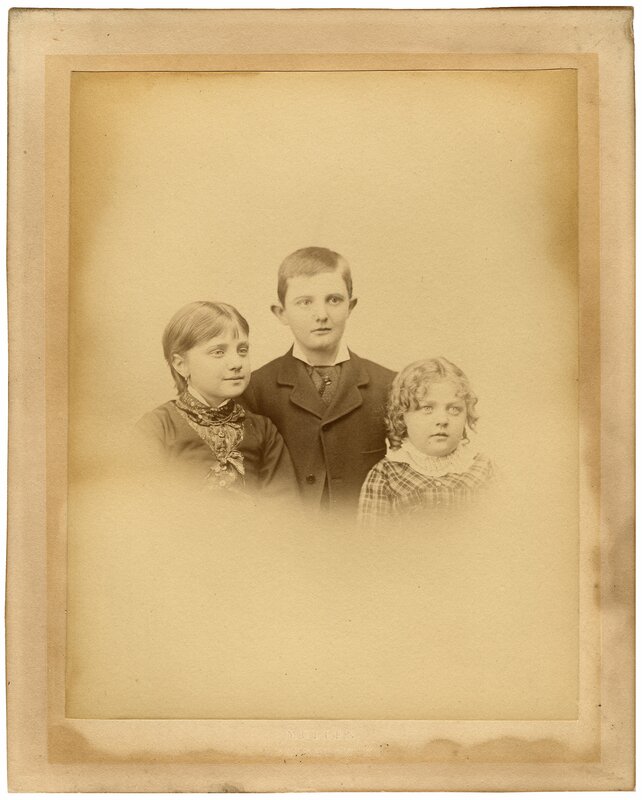 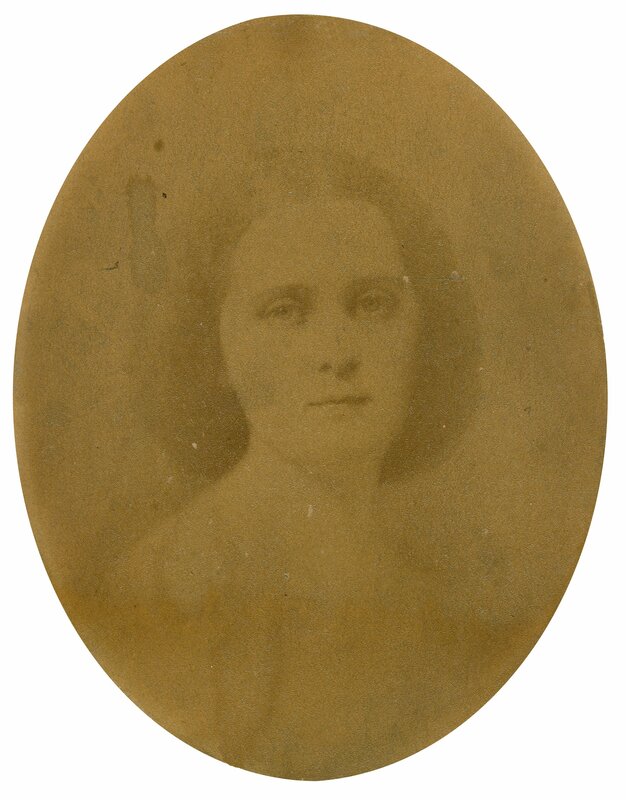 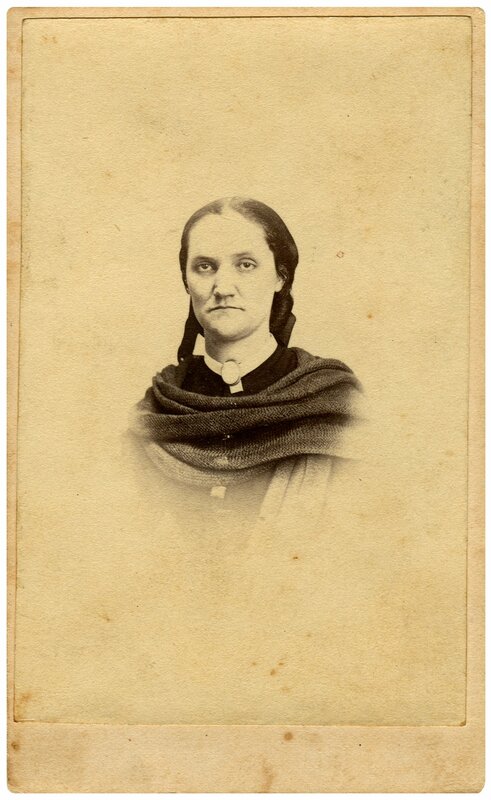 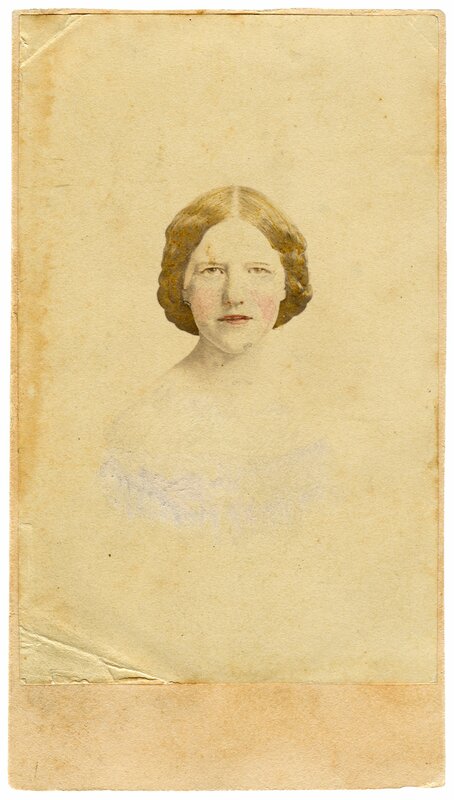 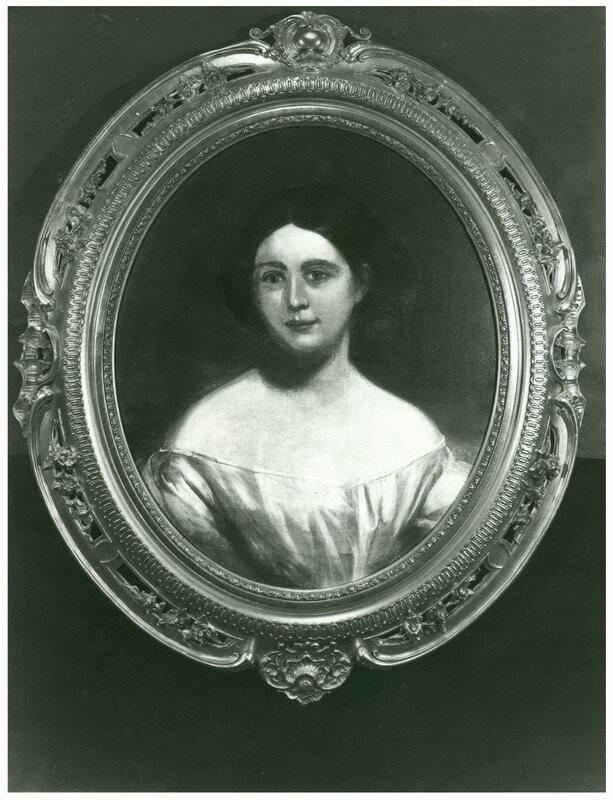 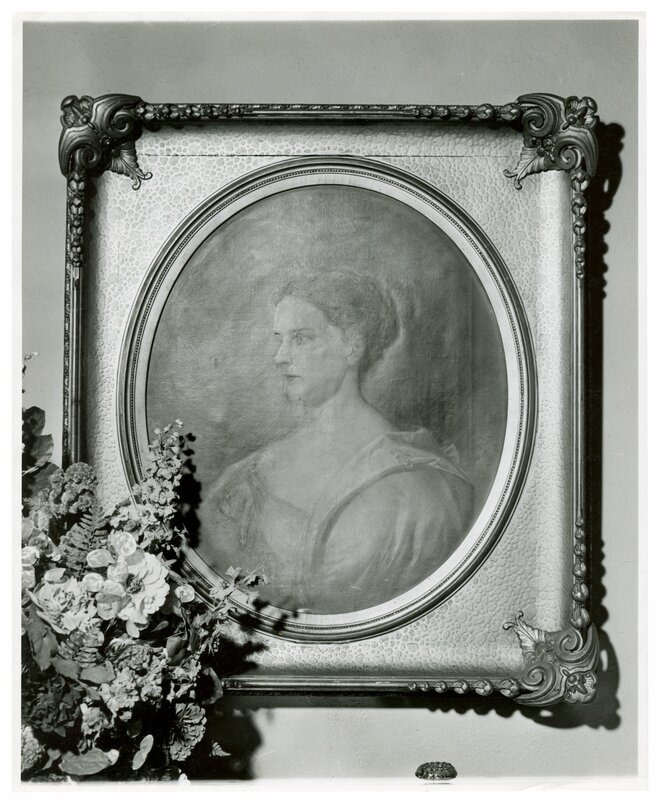 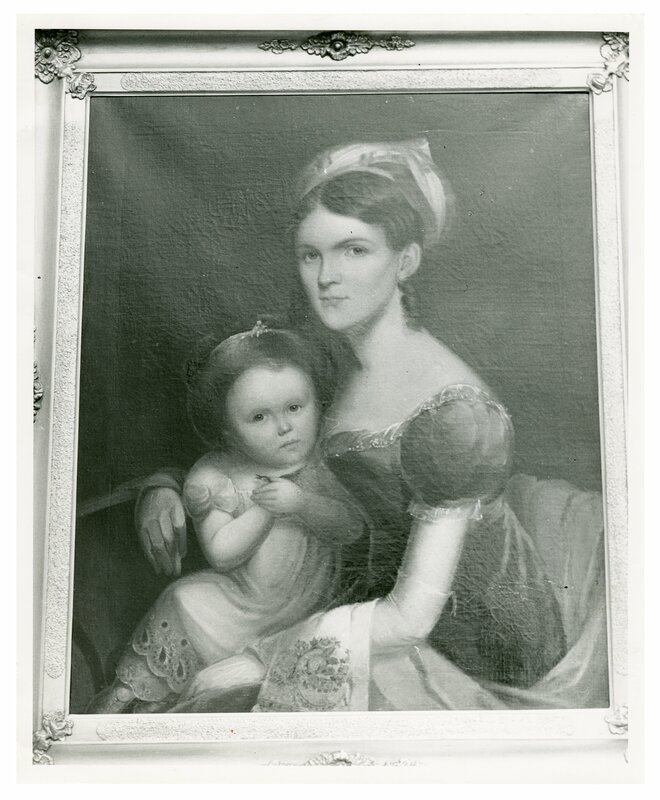 The Hunts and Morgans: a Study of a Prominent Kentucky Family. 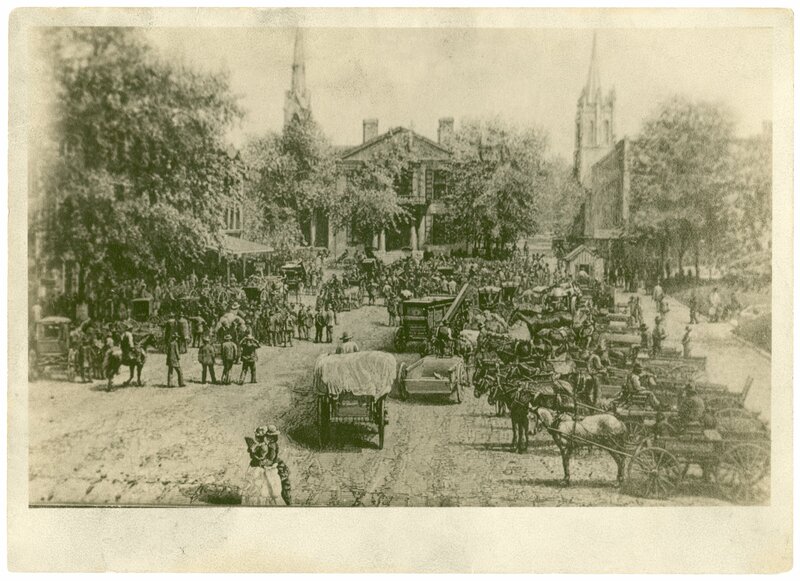 Lexington, KY: 1972. 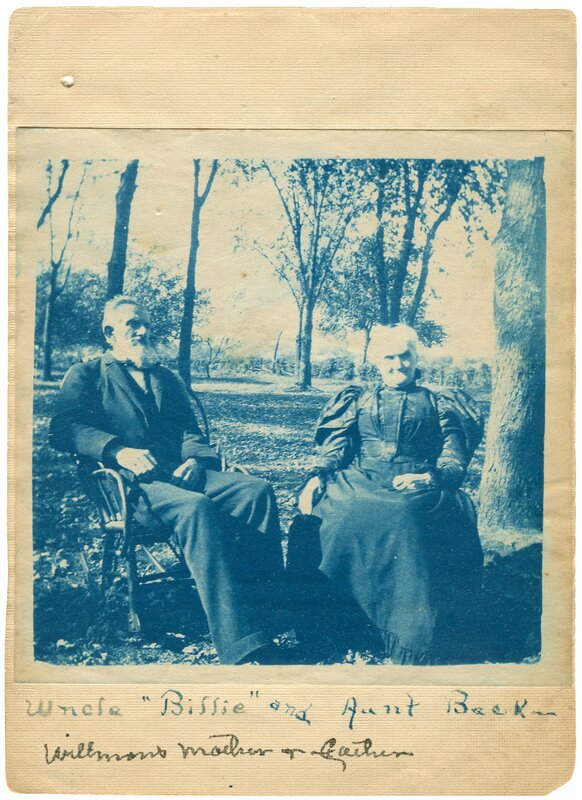 Stanton, Charles P. Bluegrass Pioneers: a Chronicle of the Hunt and Morgan Families of Lexington, Kentucky. 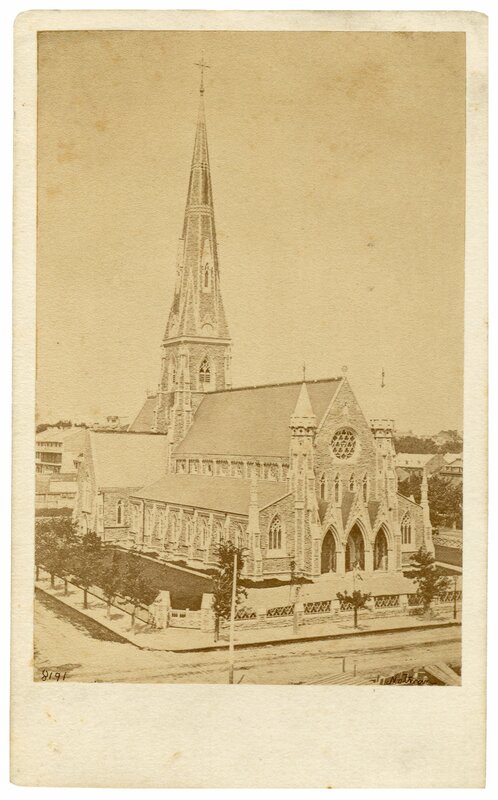 Brooklyn, NY: C.P. 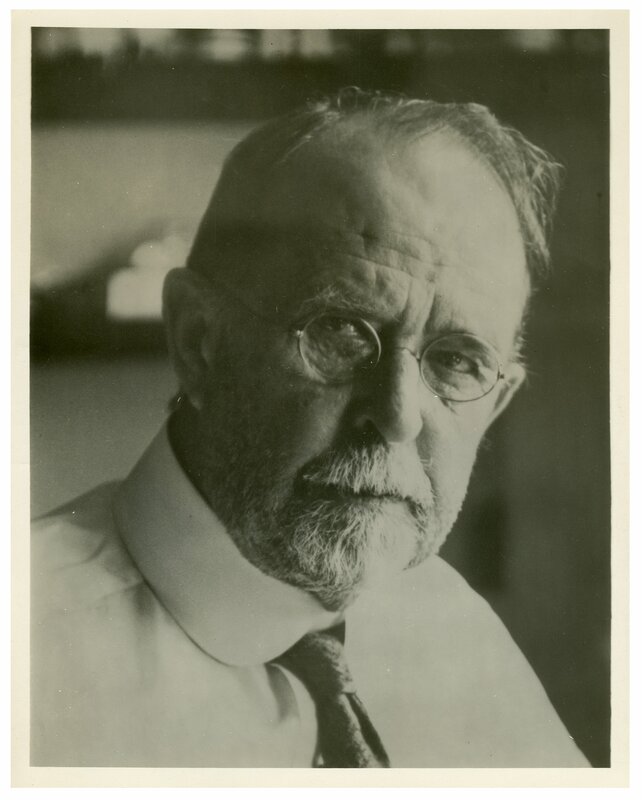 Stanton, 1989. 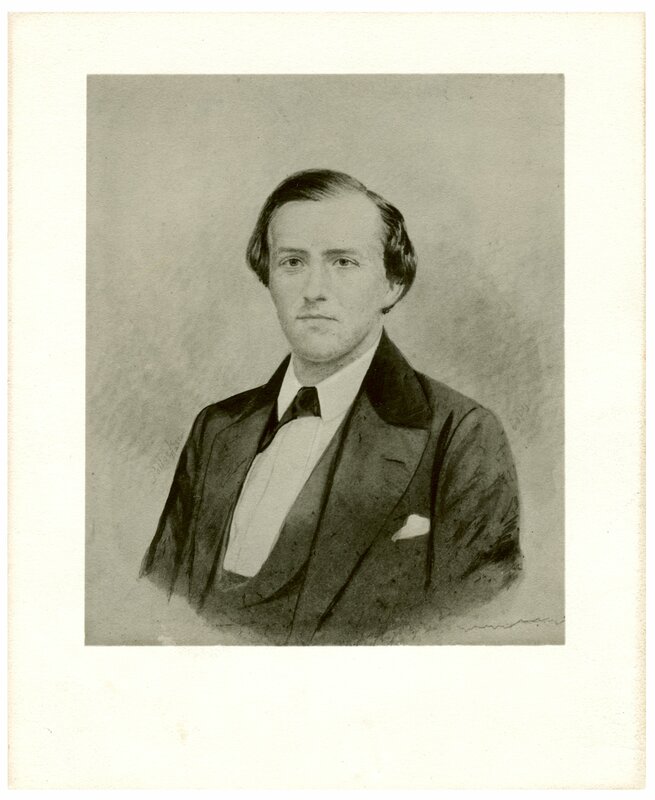 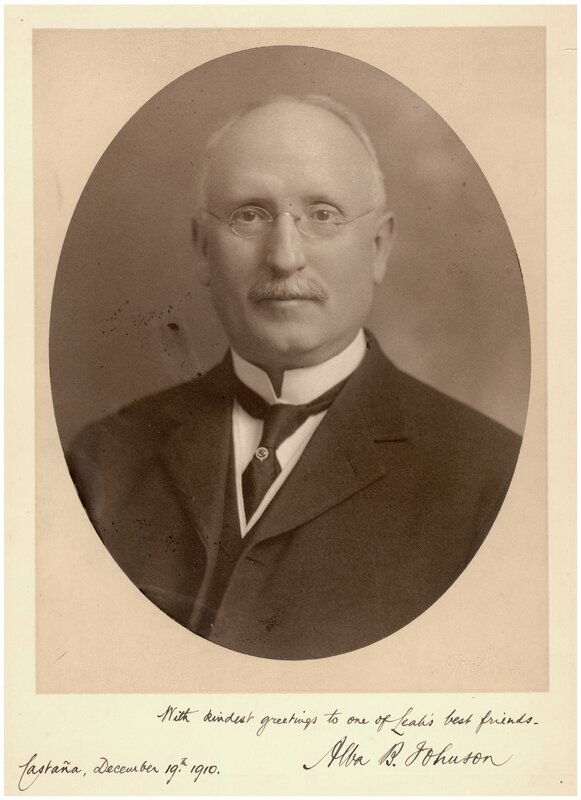 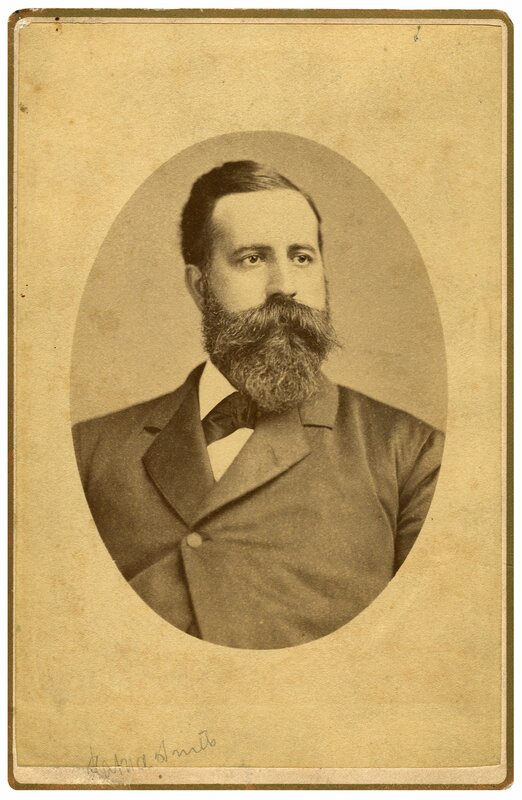 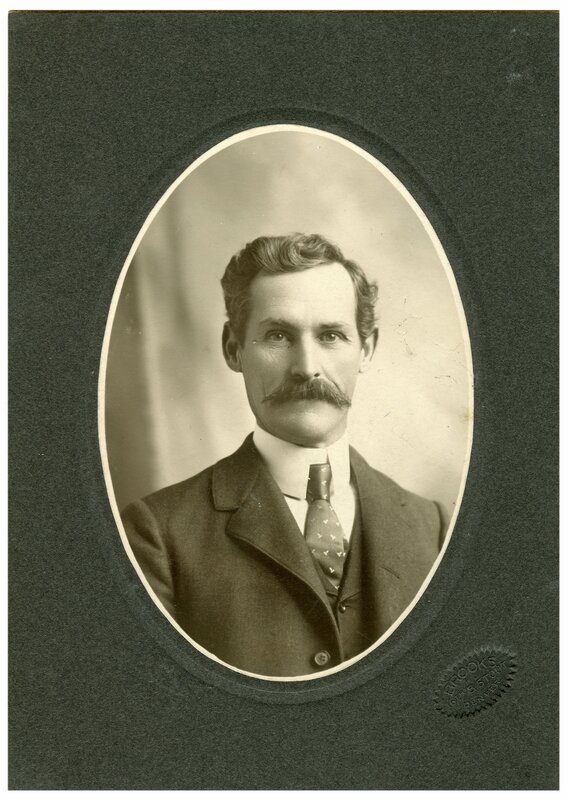 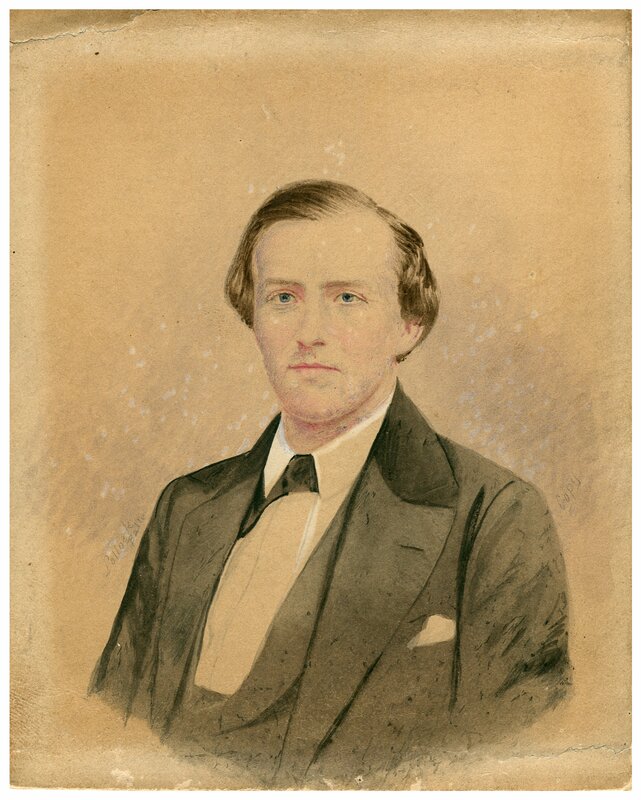 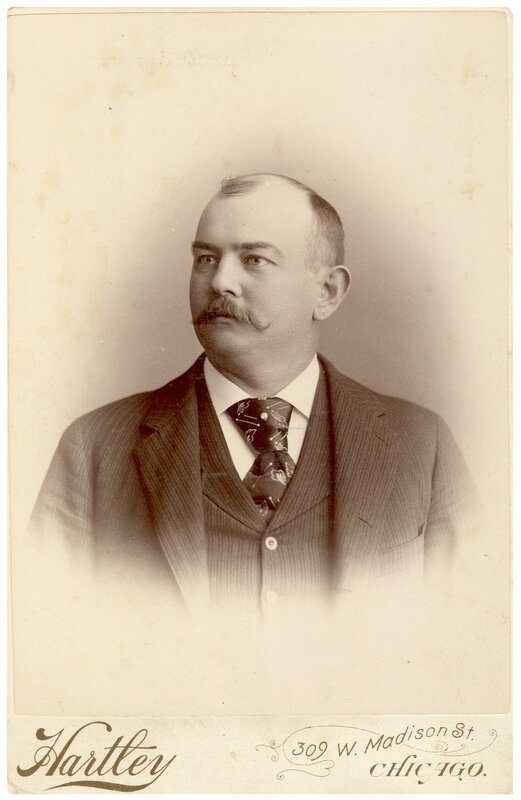 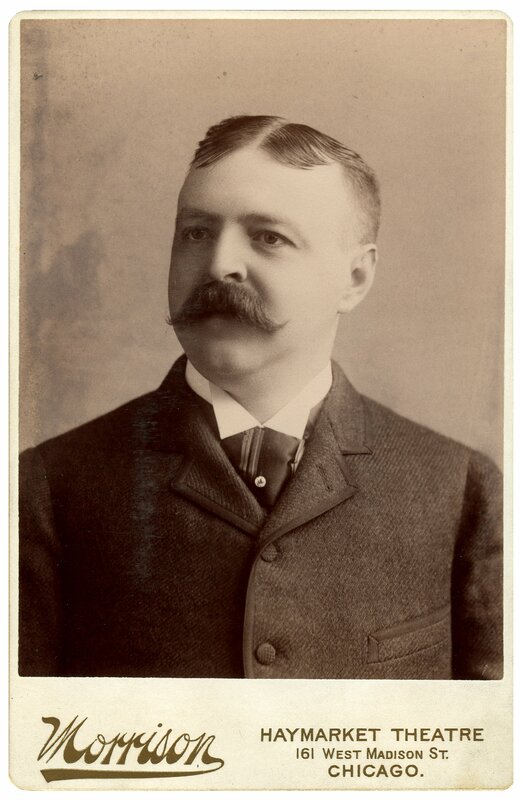 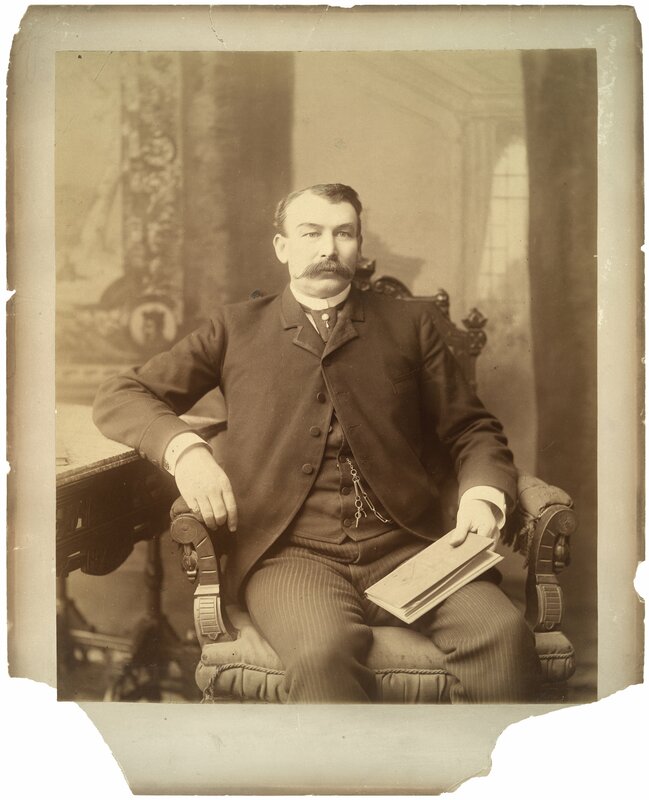 Ramage, James A. John Wesley Hunt: Pioneer Merchant, Manufacturer and Financier. 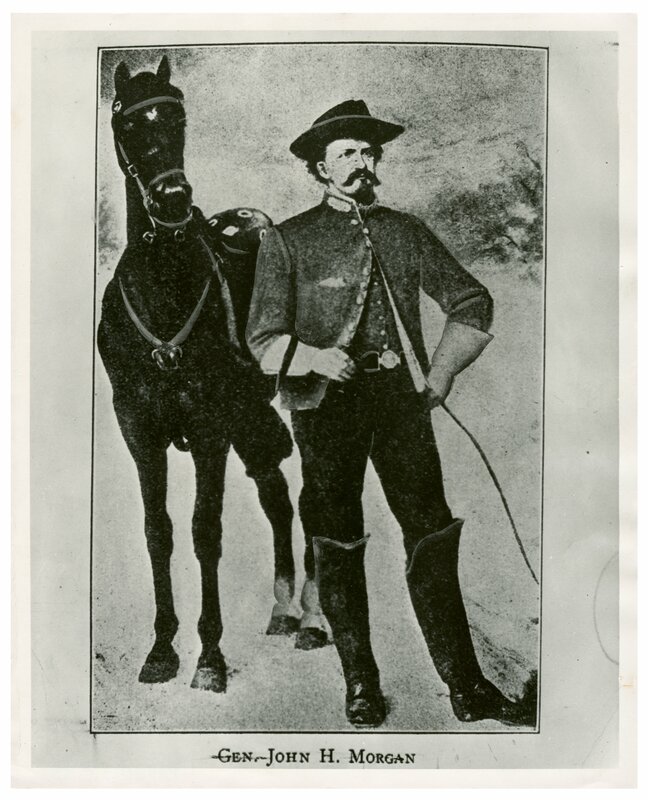 The Kentucky Bicentennial Bookshelf. 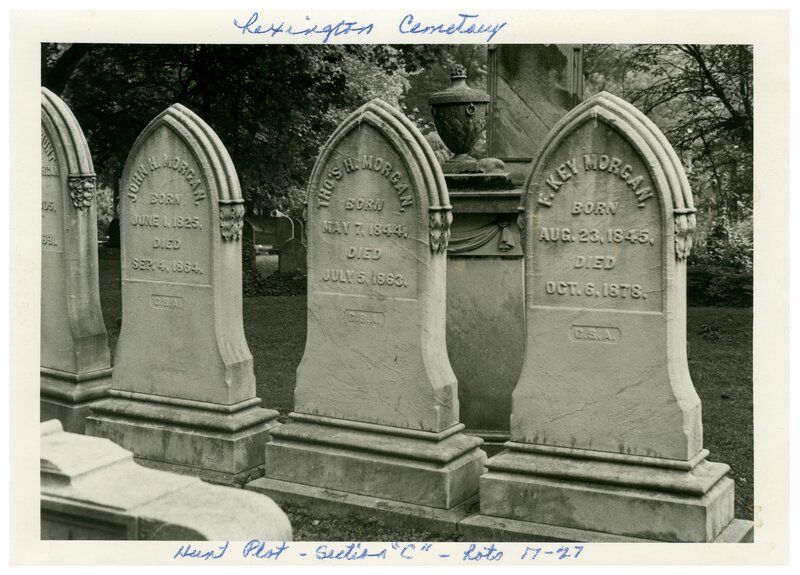 Lexington, Ky: University Press of Kentucky, 1974. 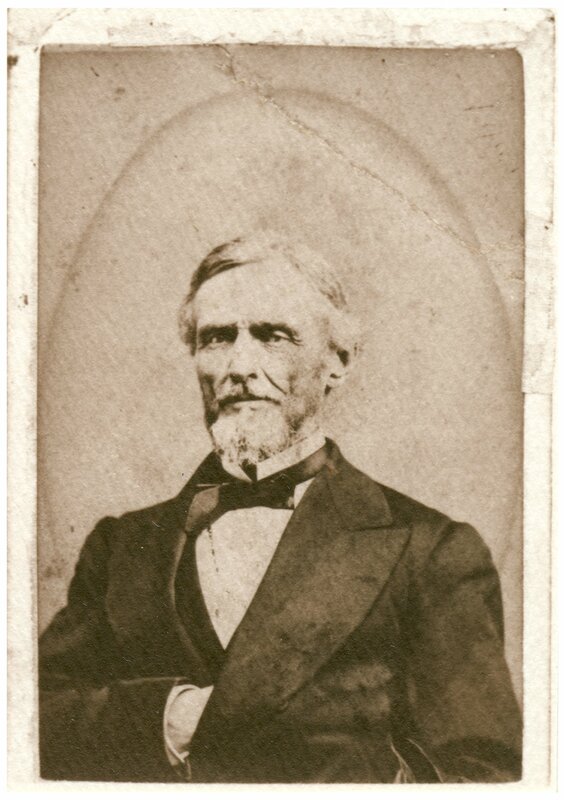 Ramage, James A. 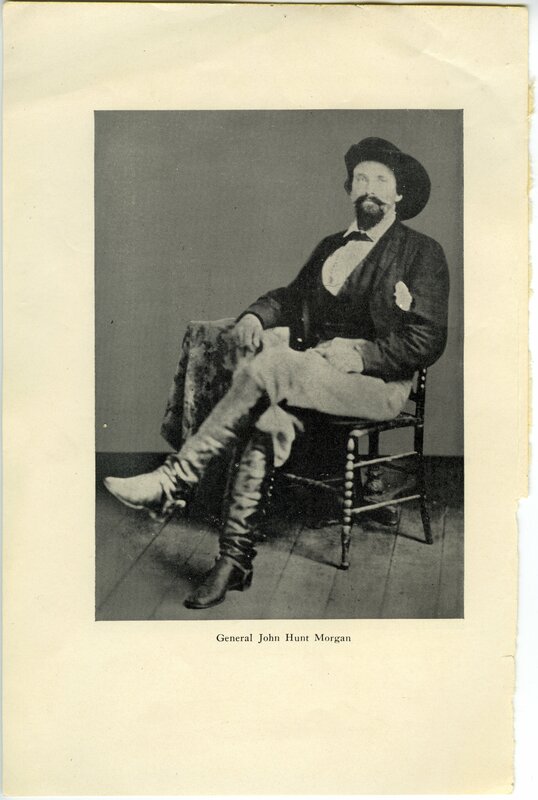 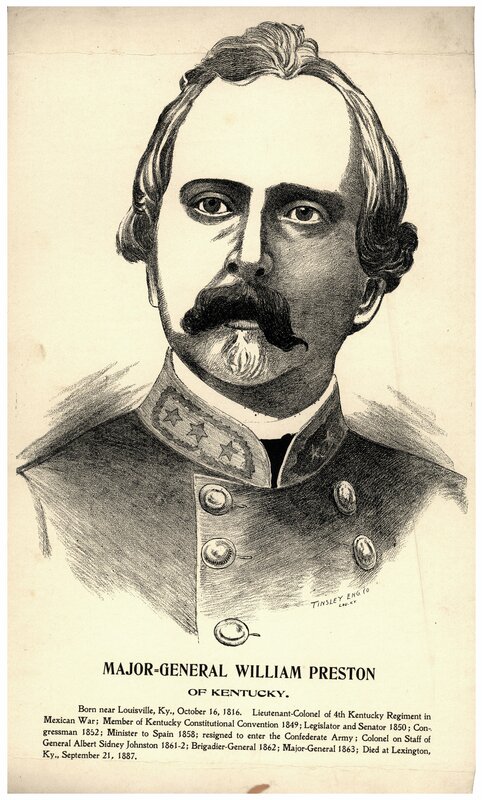 Rebel Raider: The Life Of General John Hunt Morgan. 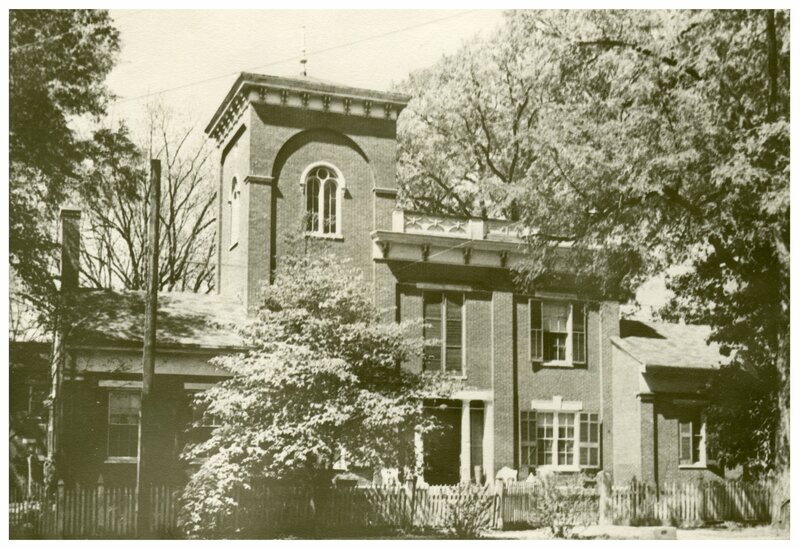 Lexington, Ky: University Press of Kentucky, 1986. 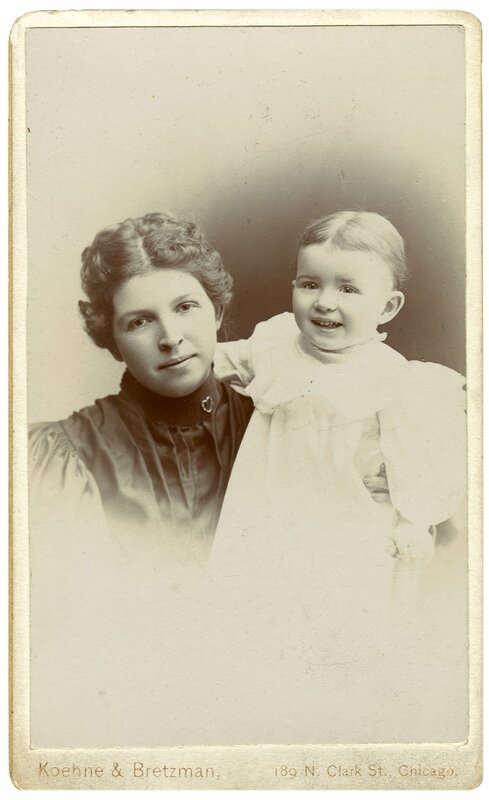 Shine, Ian and Silvia Wrobel. 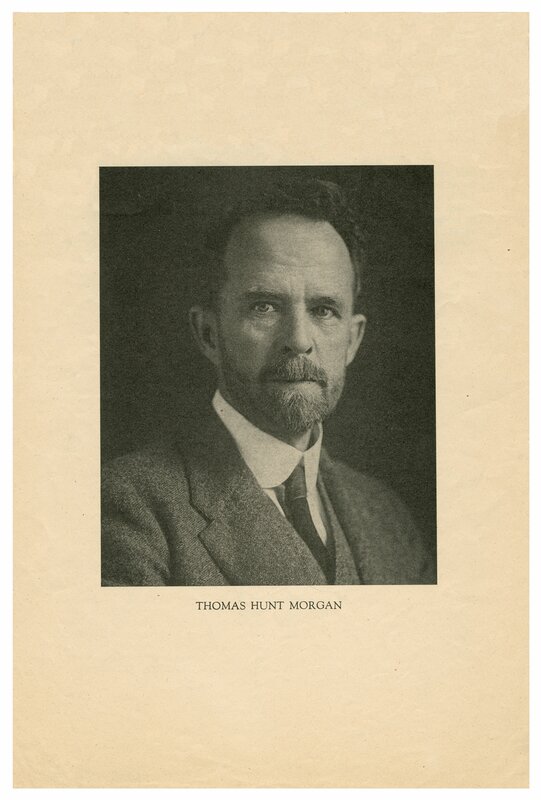 Thomas Hunt Morgan: Pioneer Of Genetics. 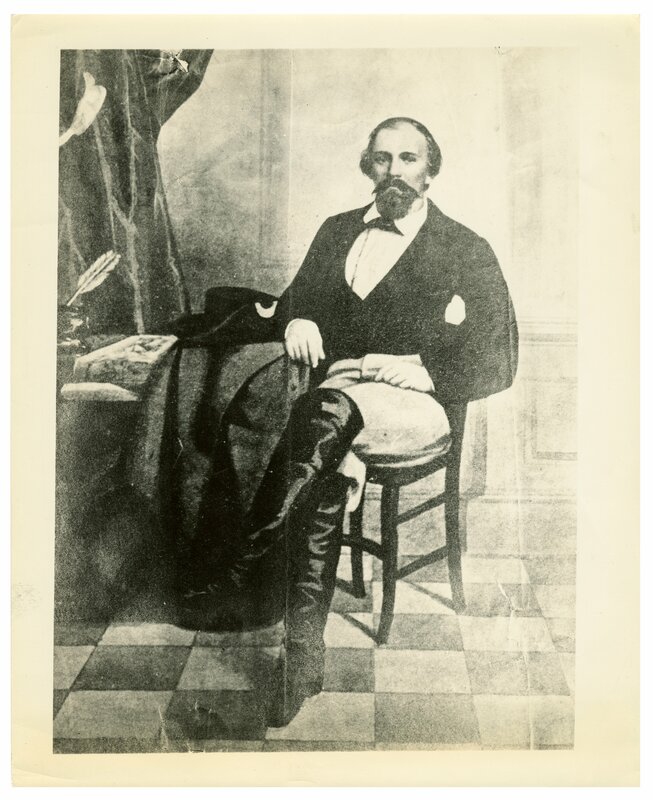 The Kentucky Bicentennial Bookshelf. 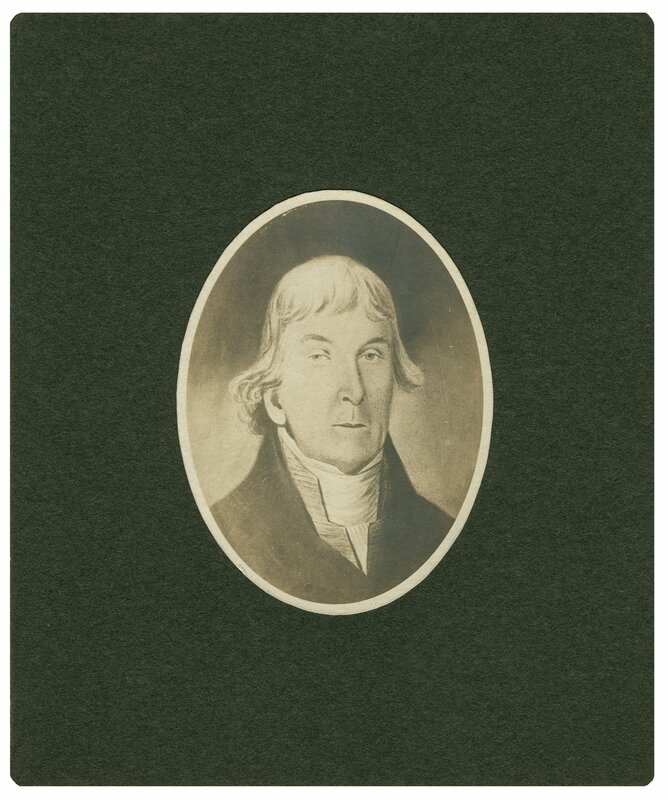 Lexington, Ky: University Press of Kentucky, 1976. 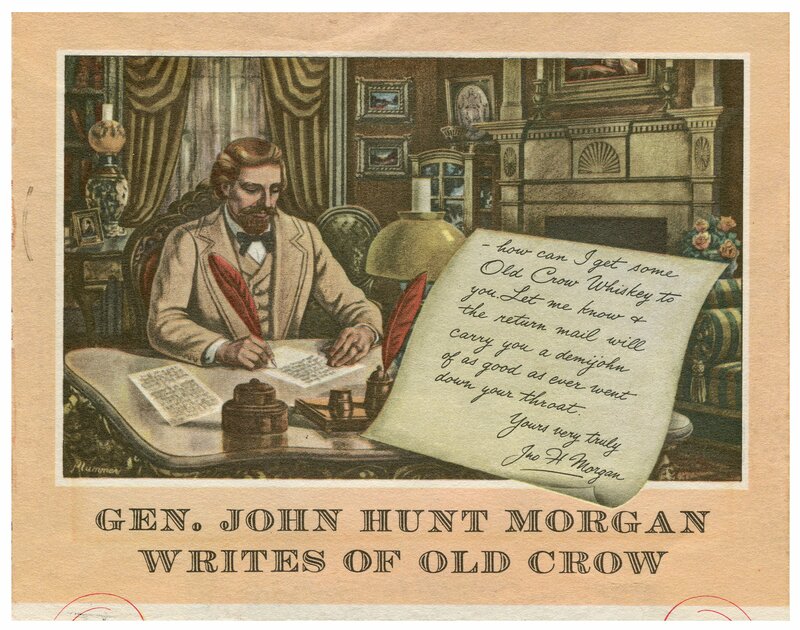 The Hunt-Morgan House Deposit photographs (dated 1860-1949; 2 cubic feet; 234 items) consists of images documenting the lives of Hunt-Morgan family members, primarily Brigadier General John Hunt Morgan. 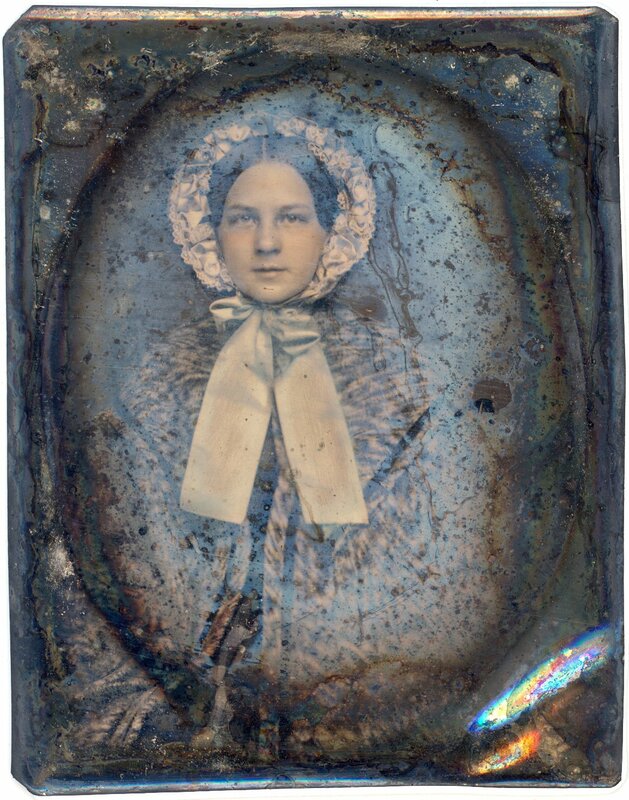 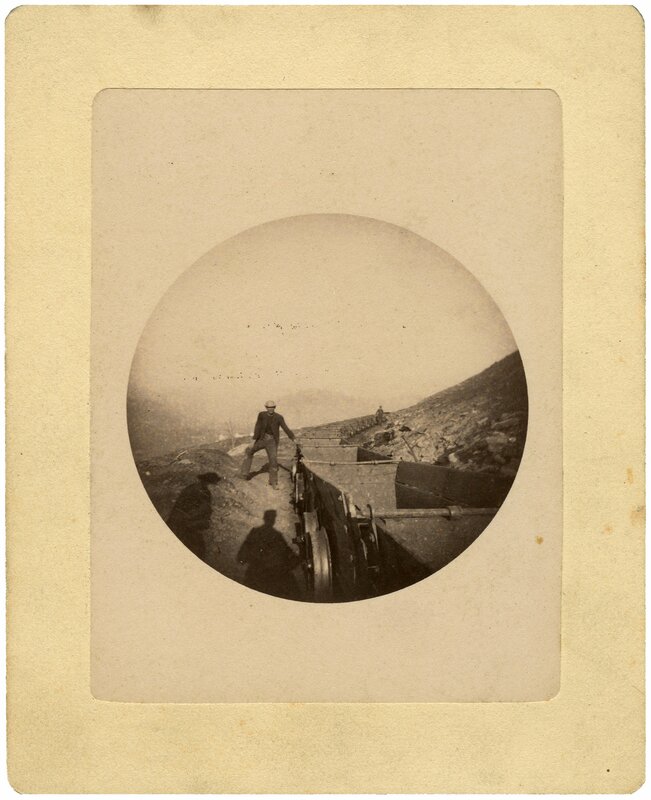 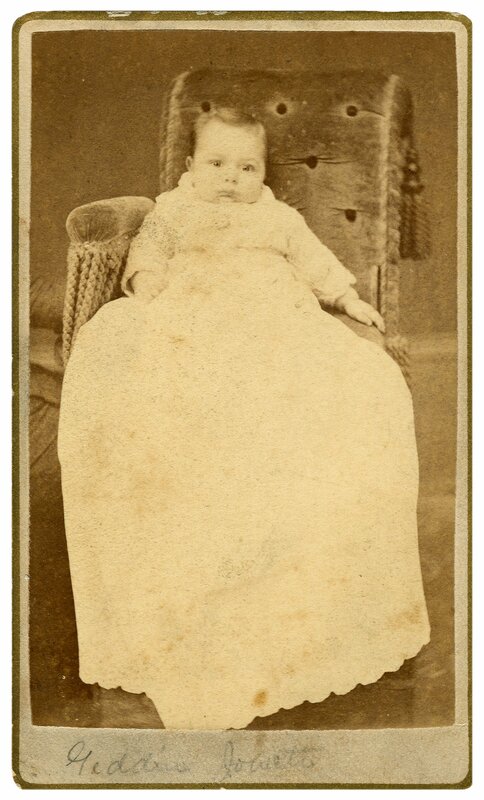 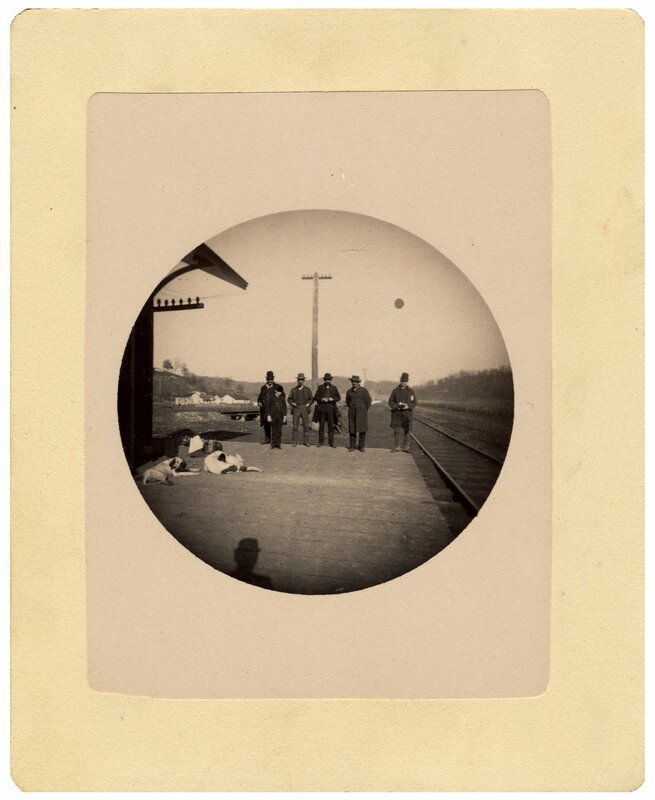 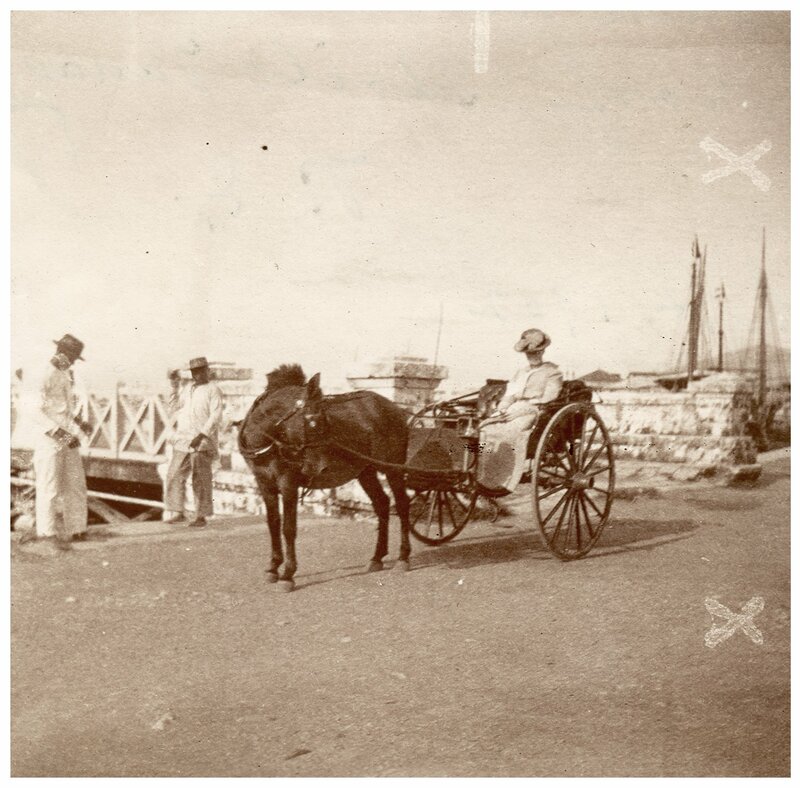 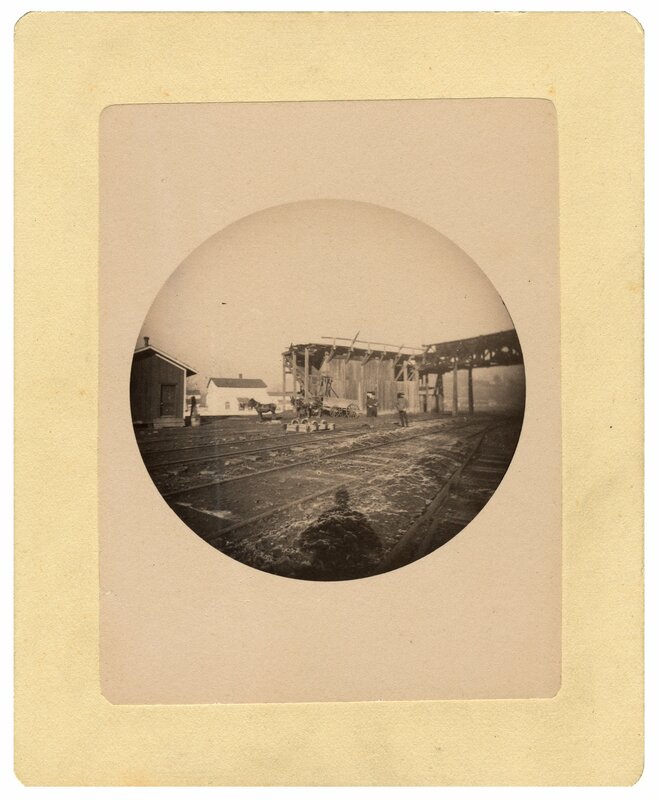 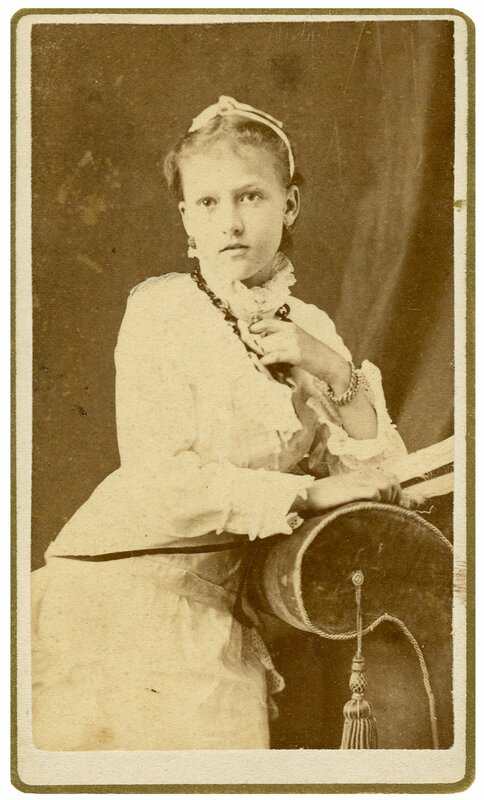 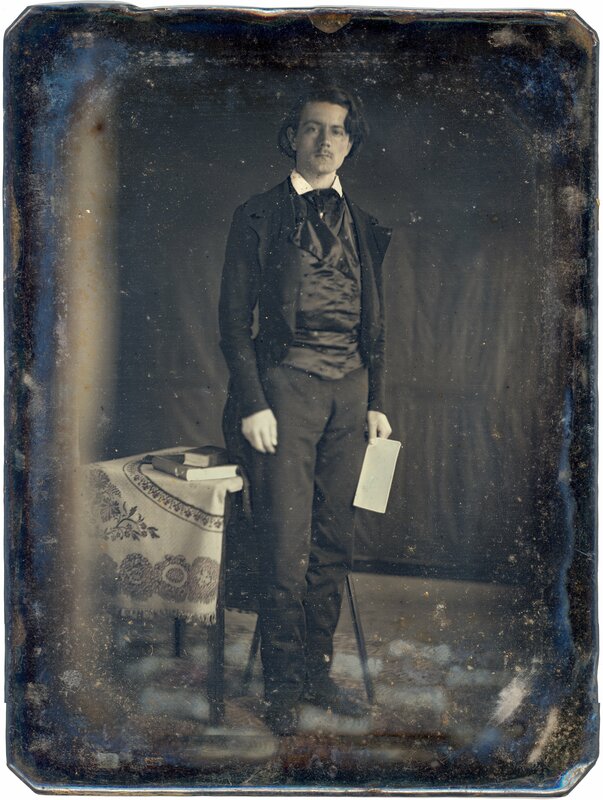 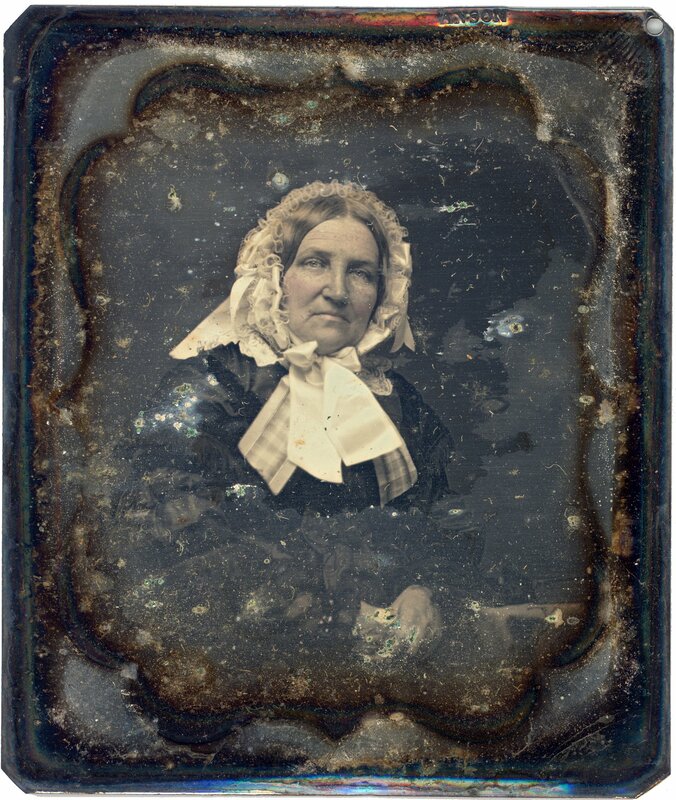 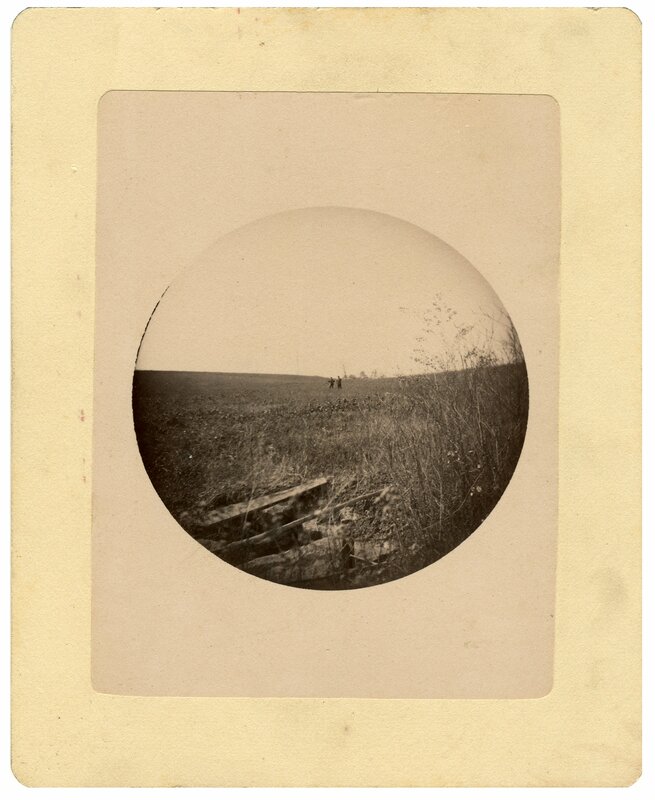 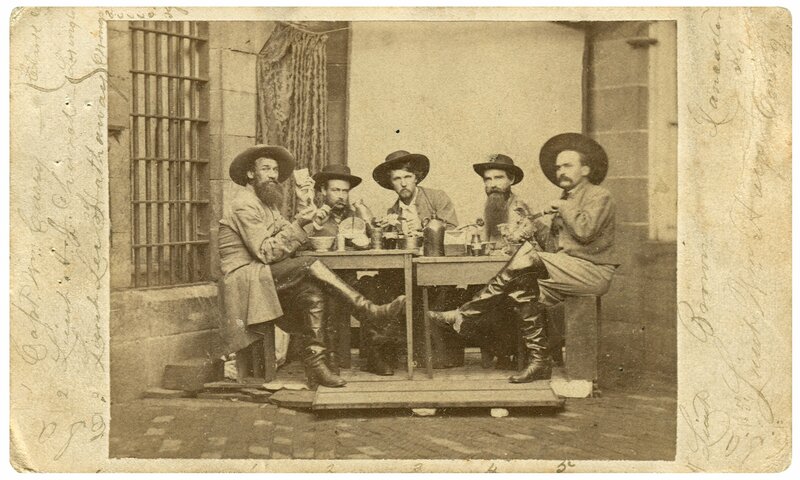 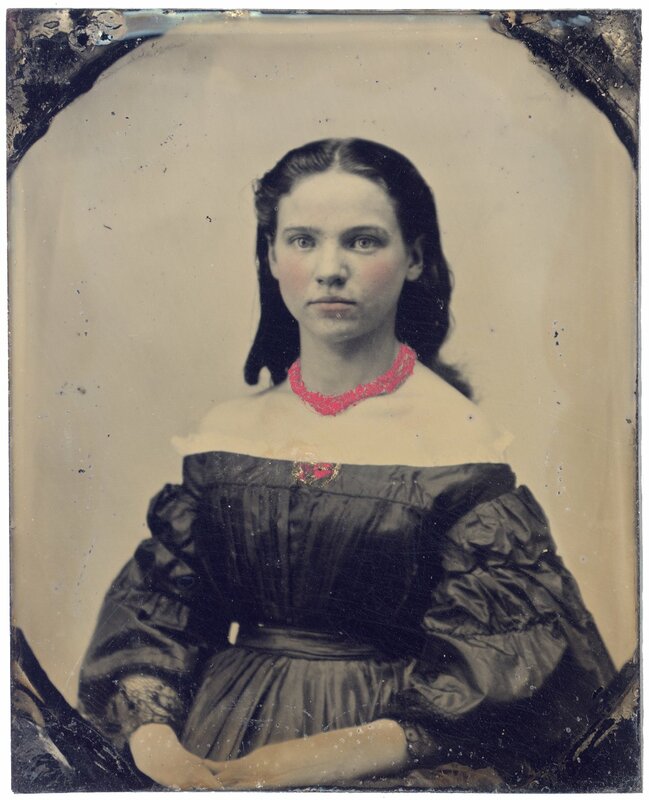 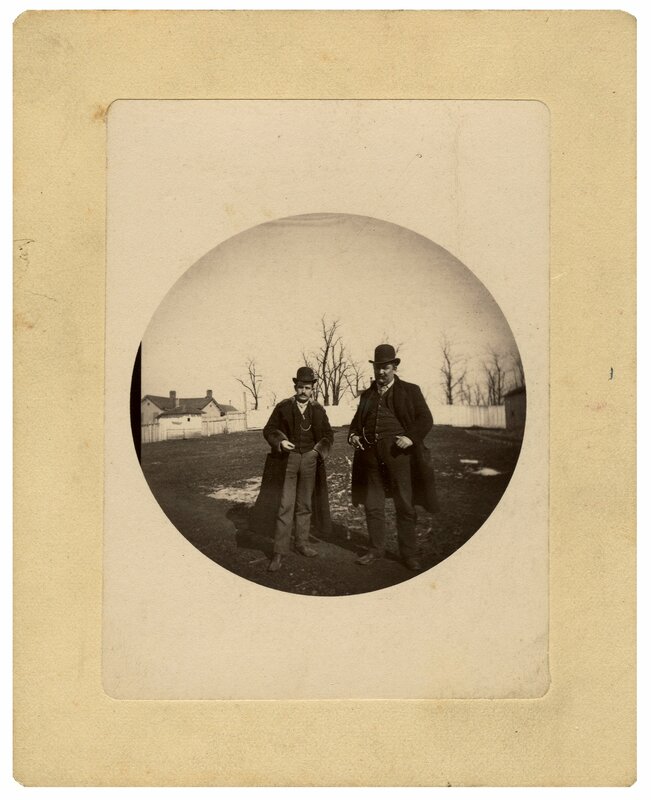 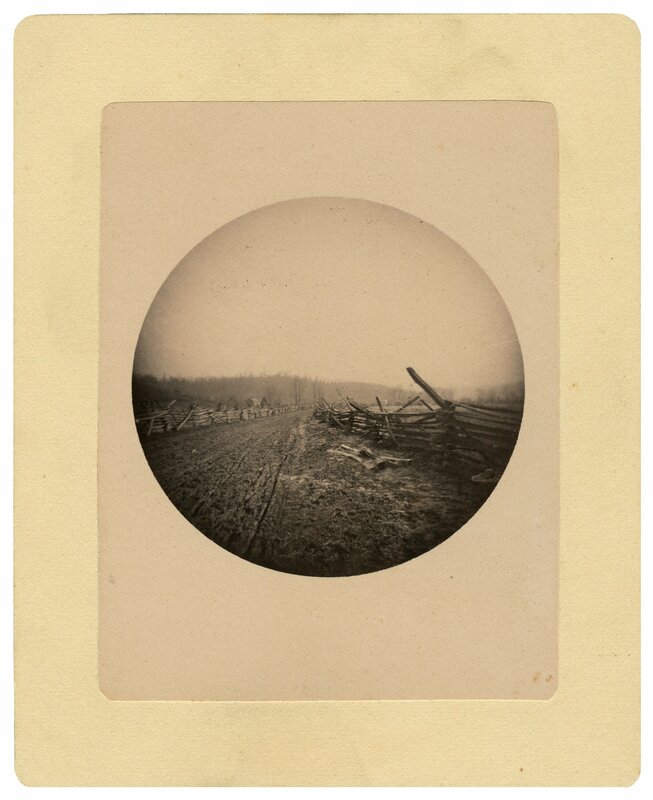 The images include a variety of photographic processes including albumens, tintypes, daguerreotypes and silver prints. 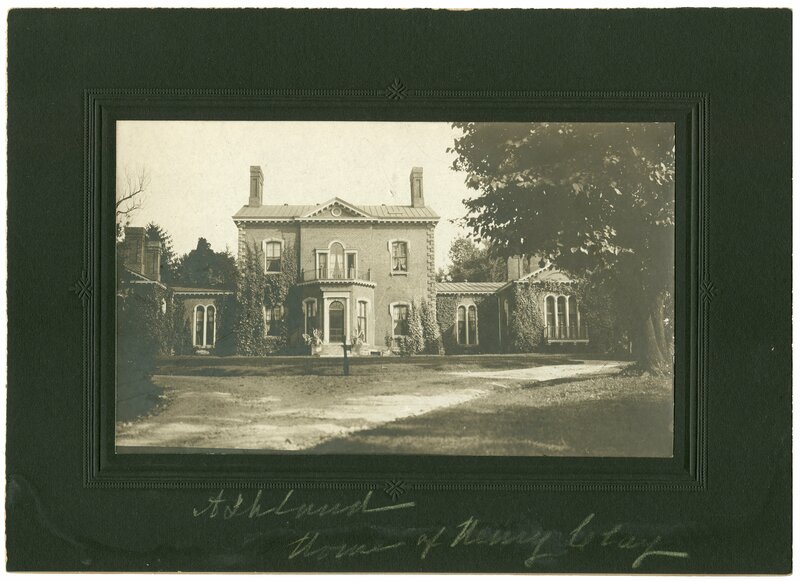 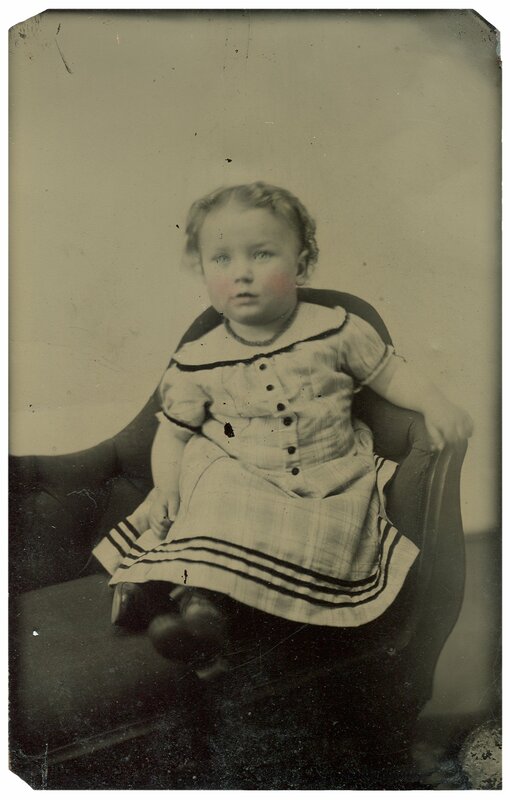 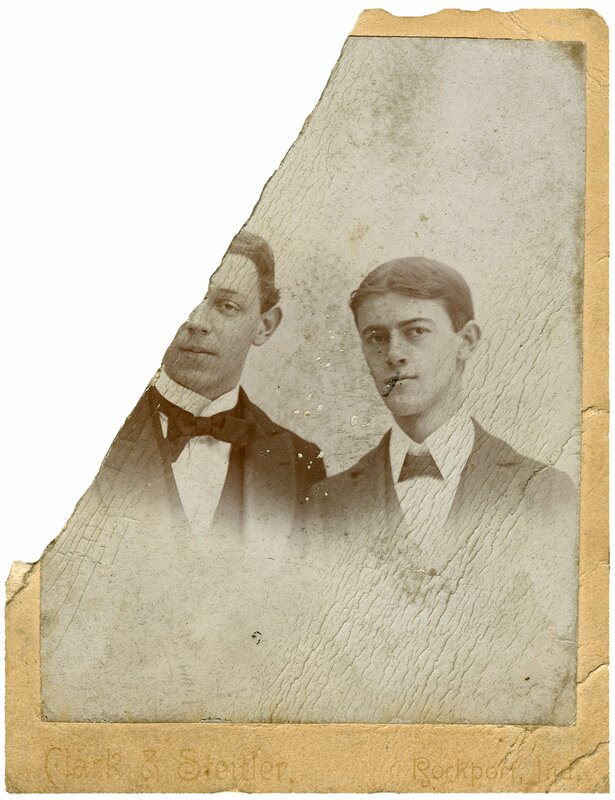 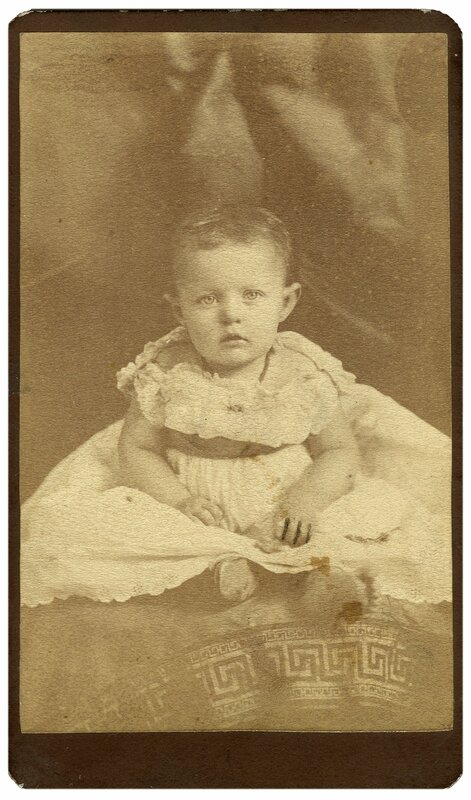 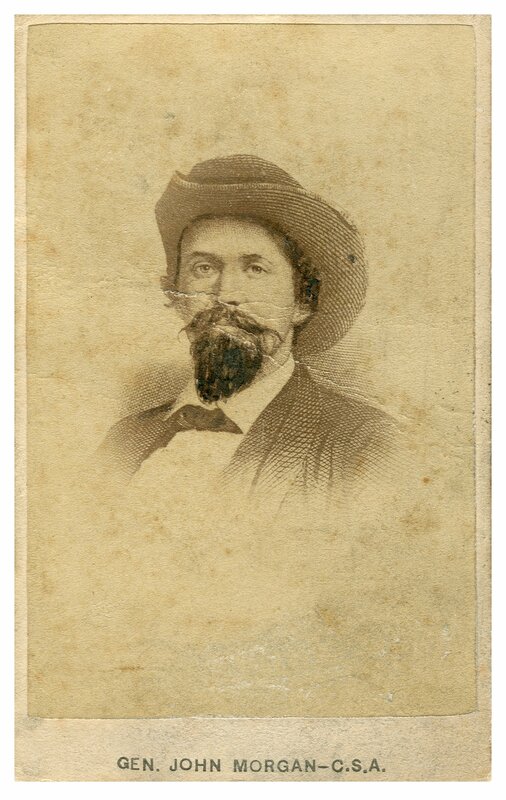 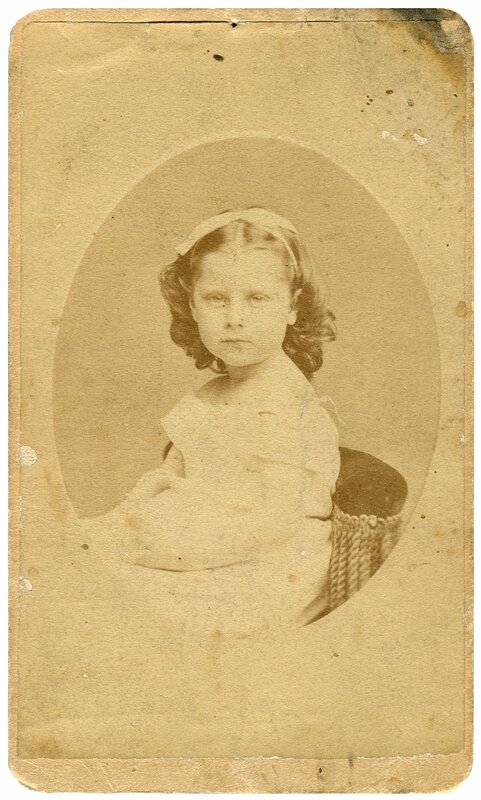 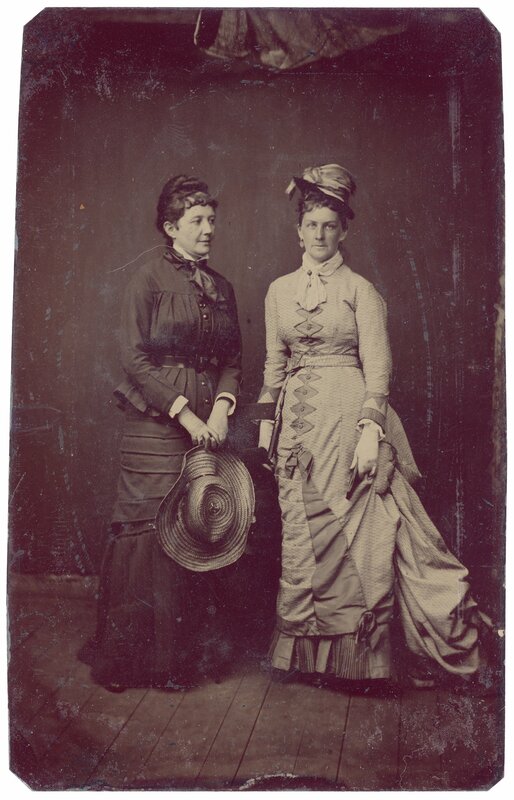 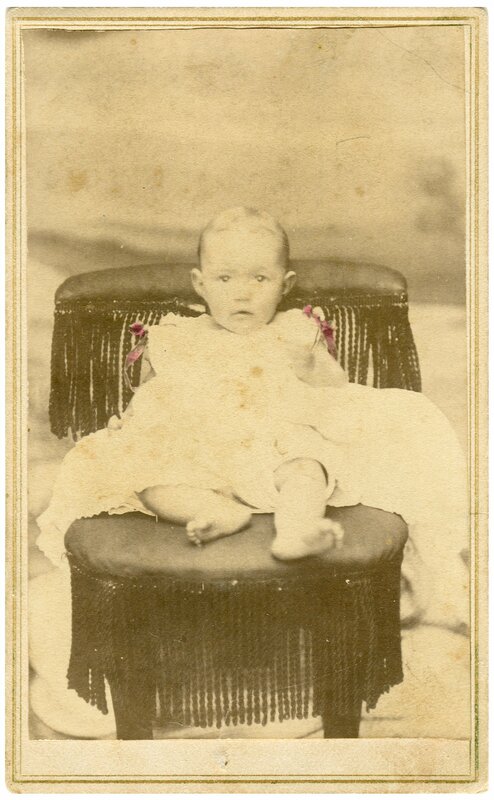 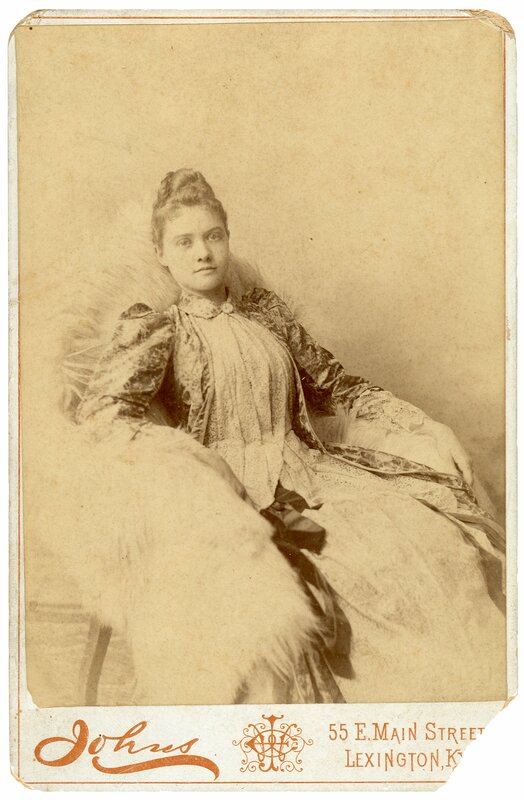 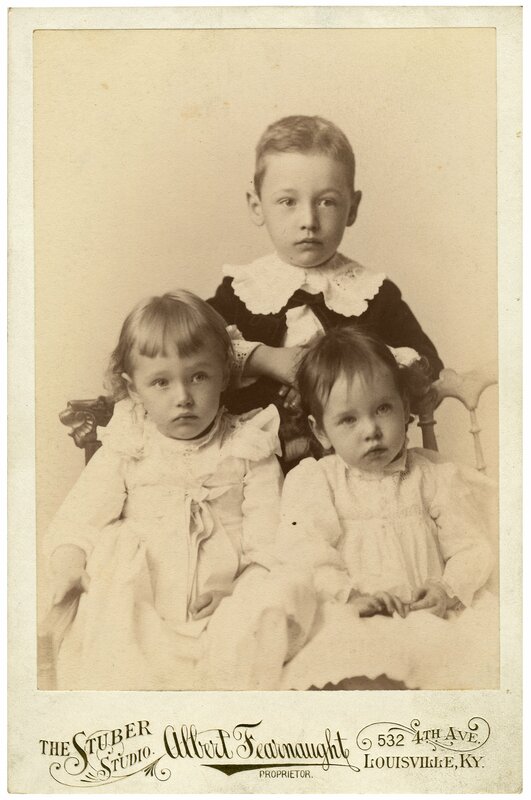 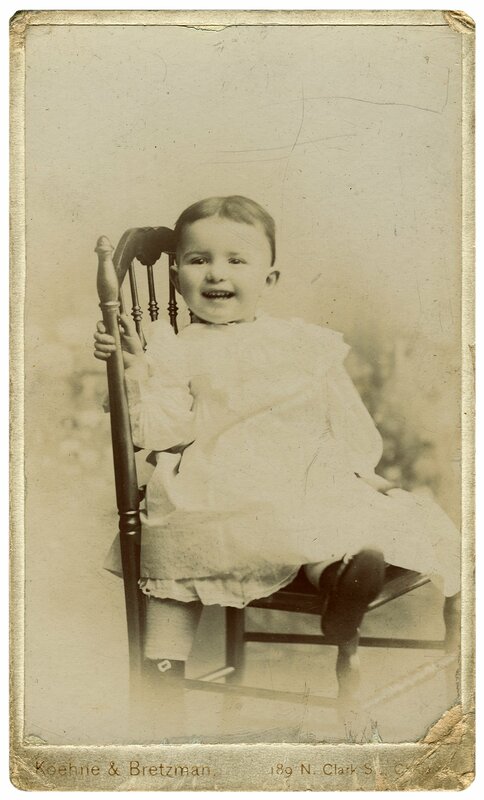 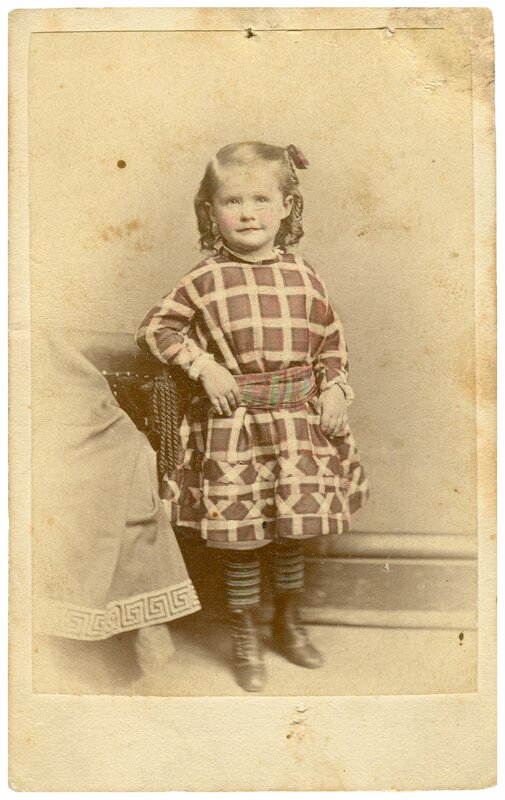 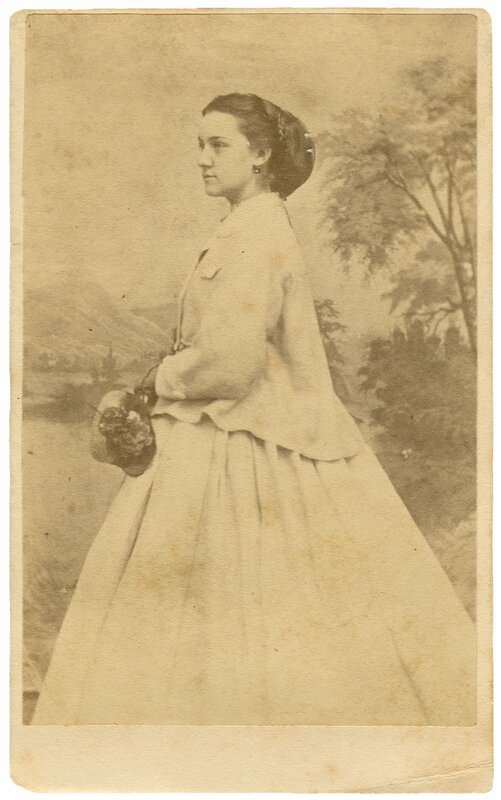 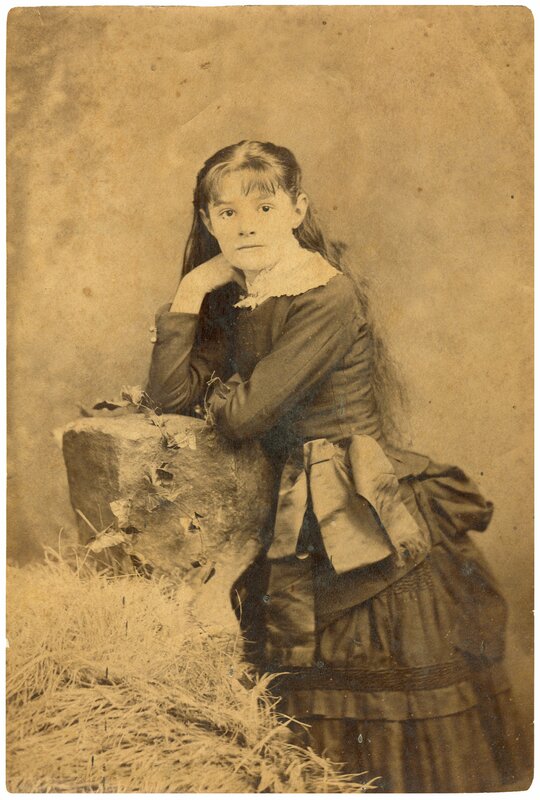 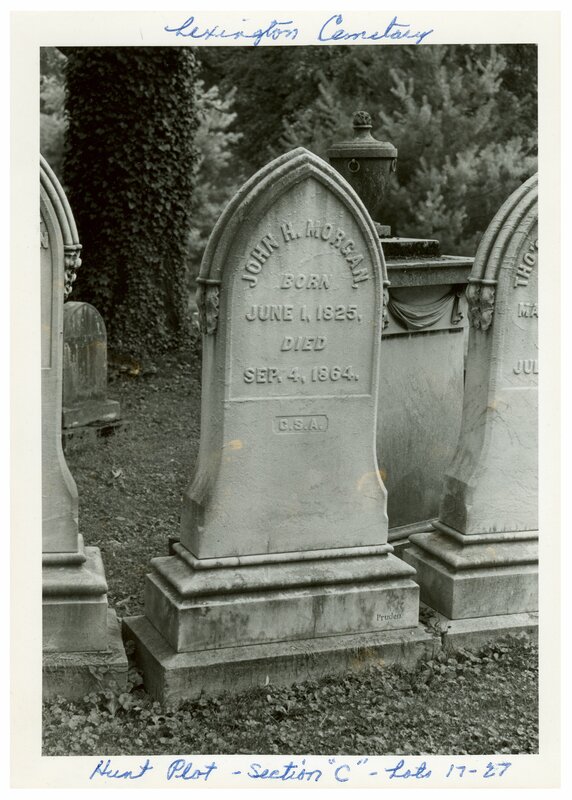 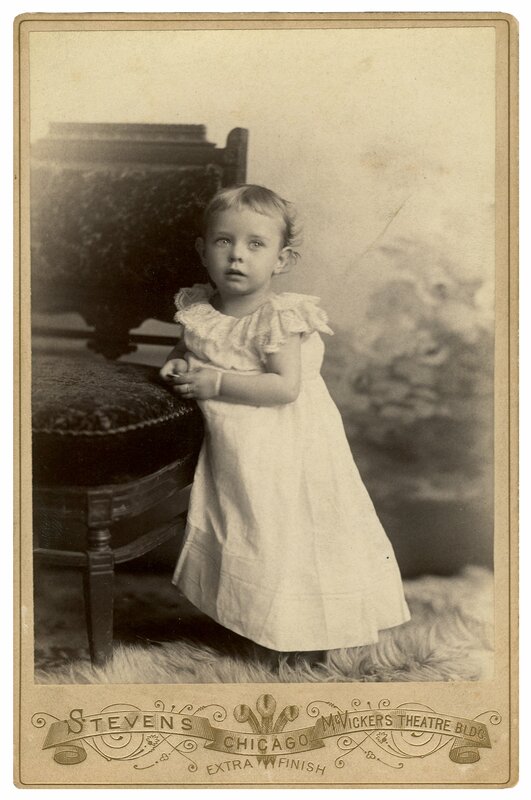 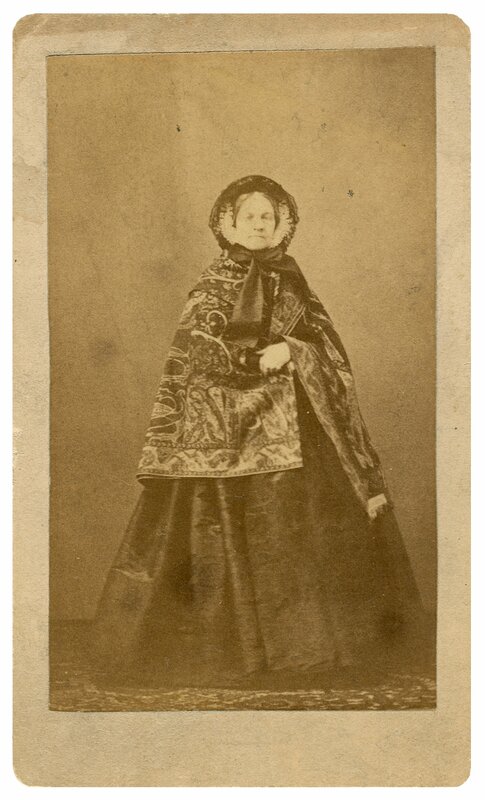 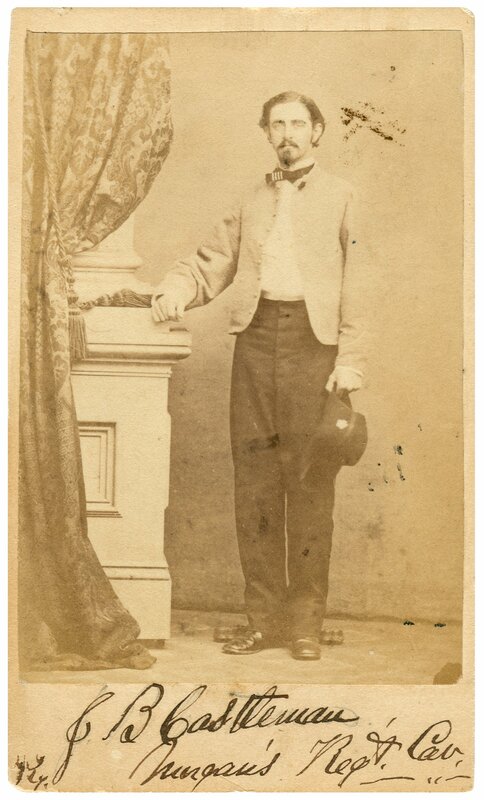 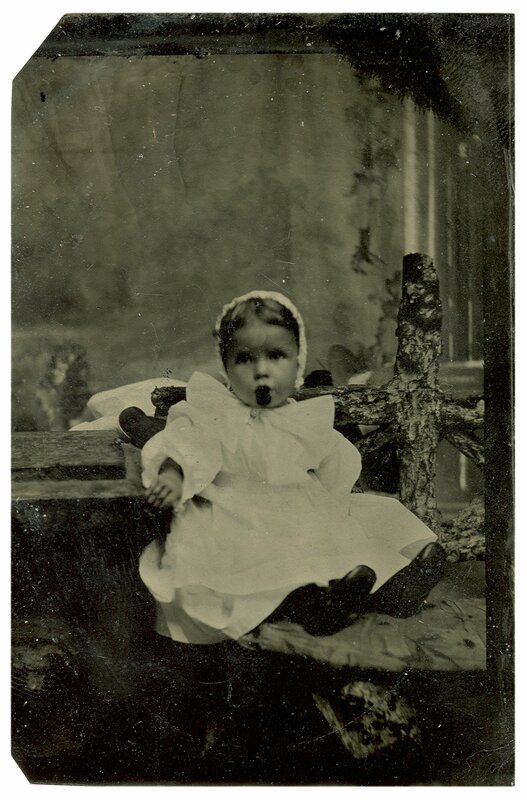 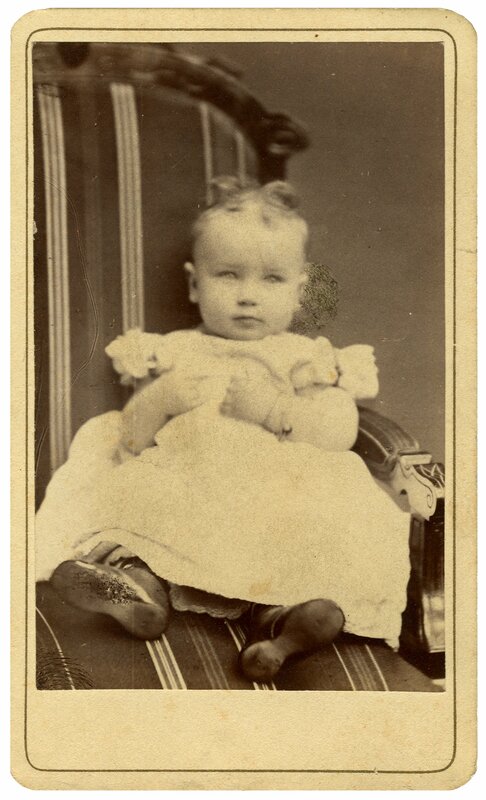 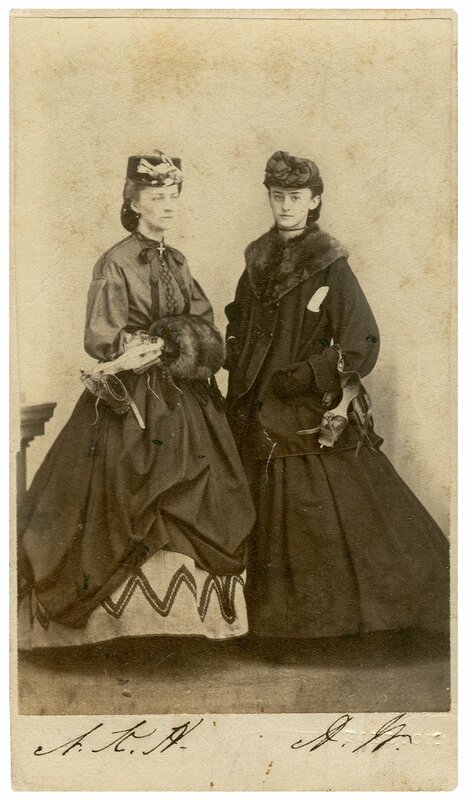 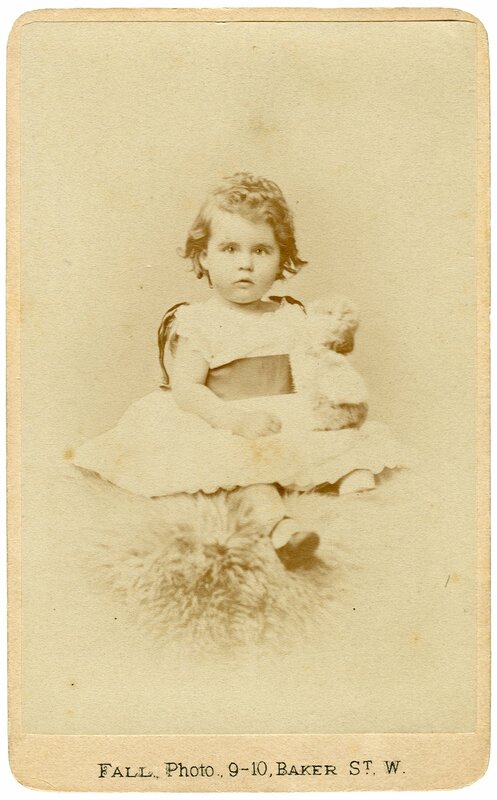 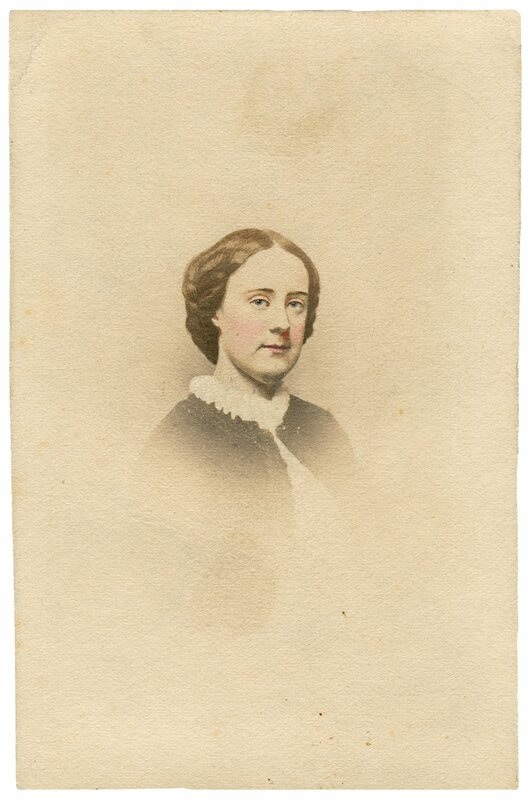 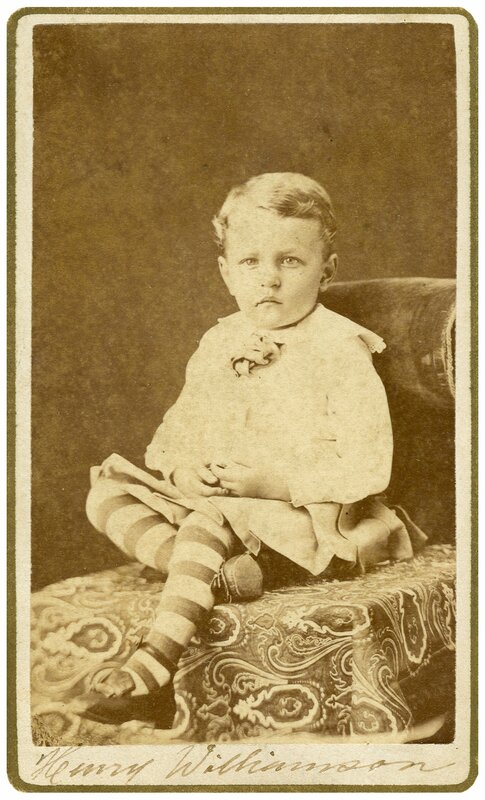 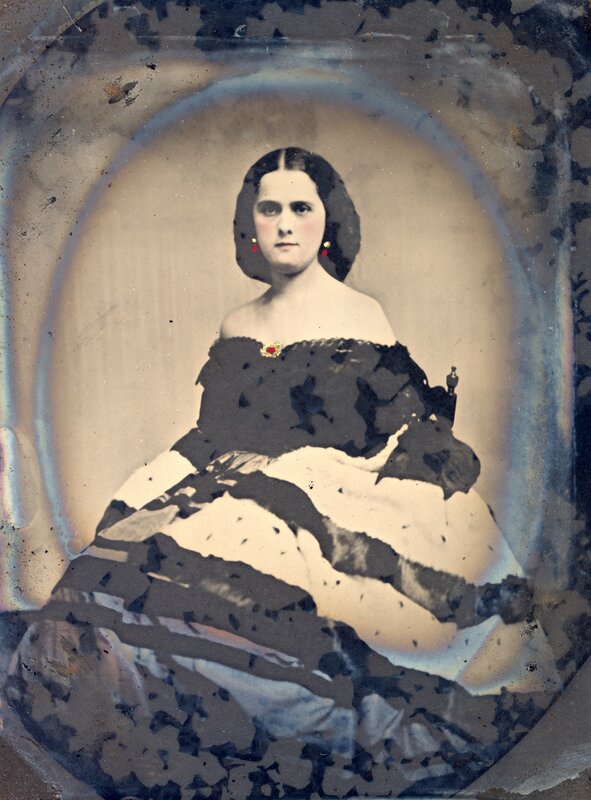 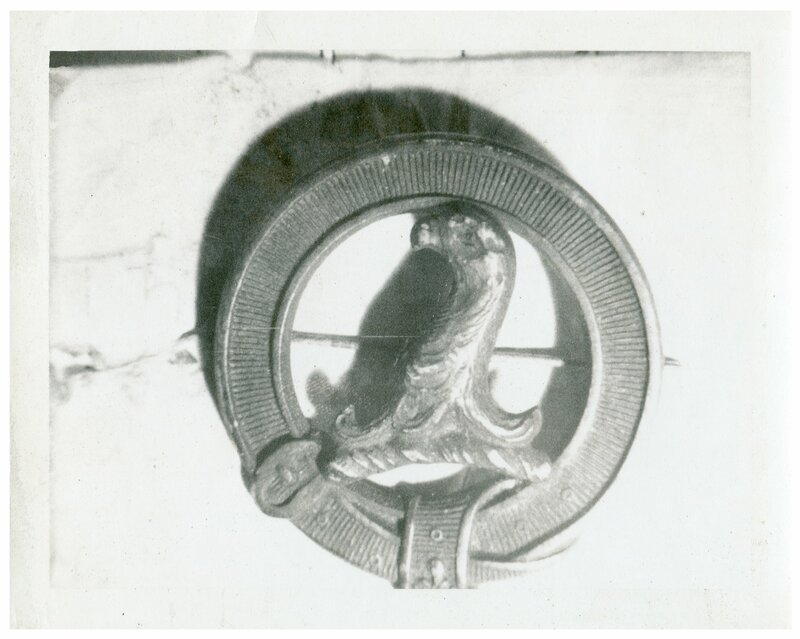 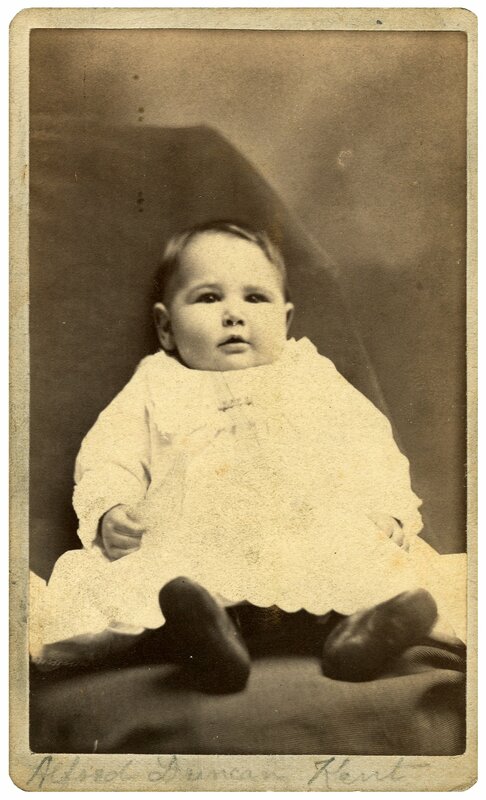 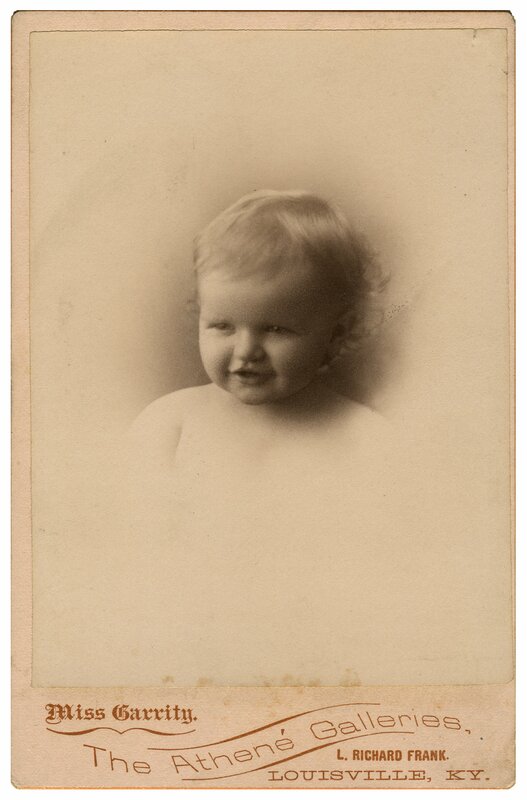 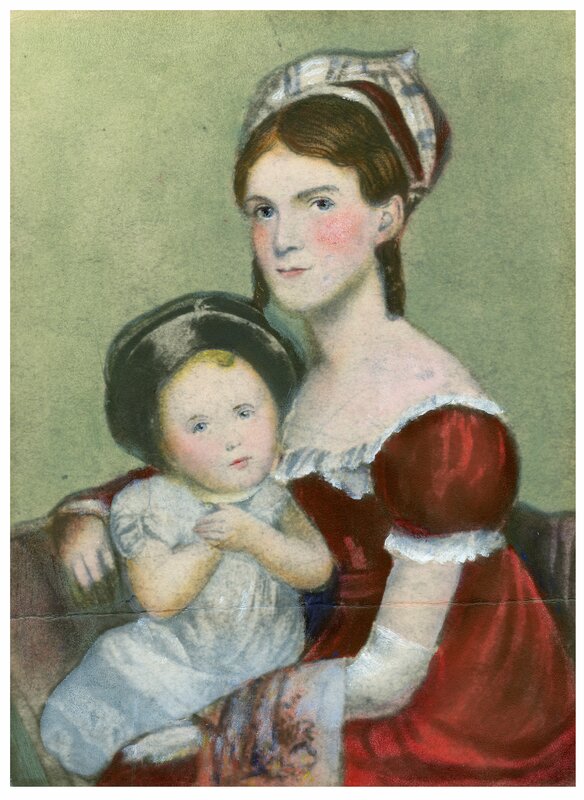 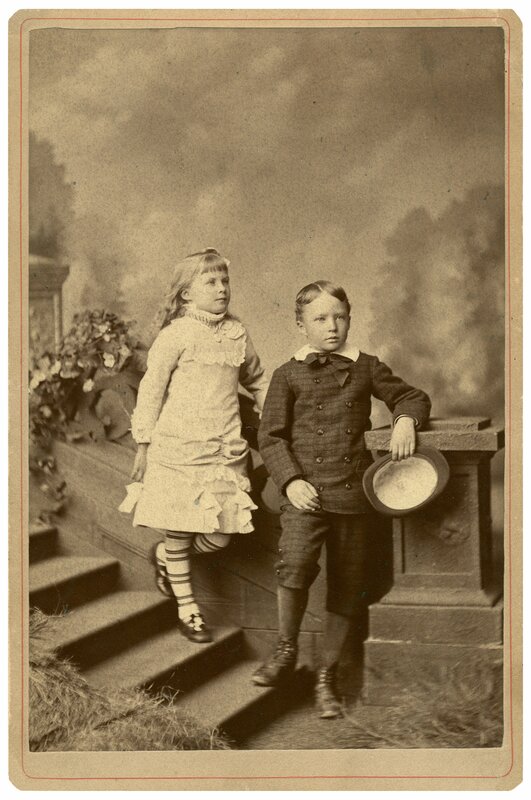 Most of the images in the collection are members or relatives of the Hunt and Morgan families. 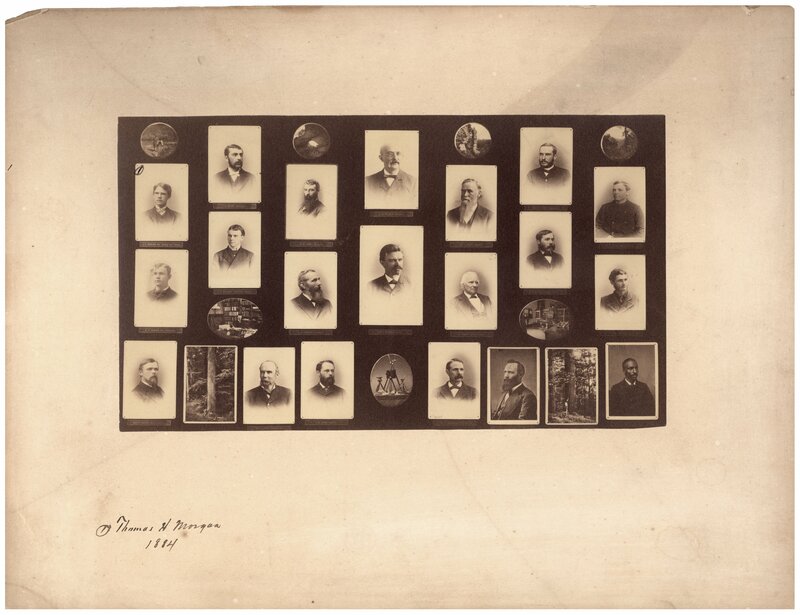 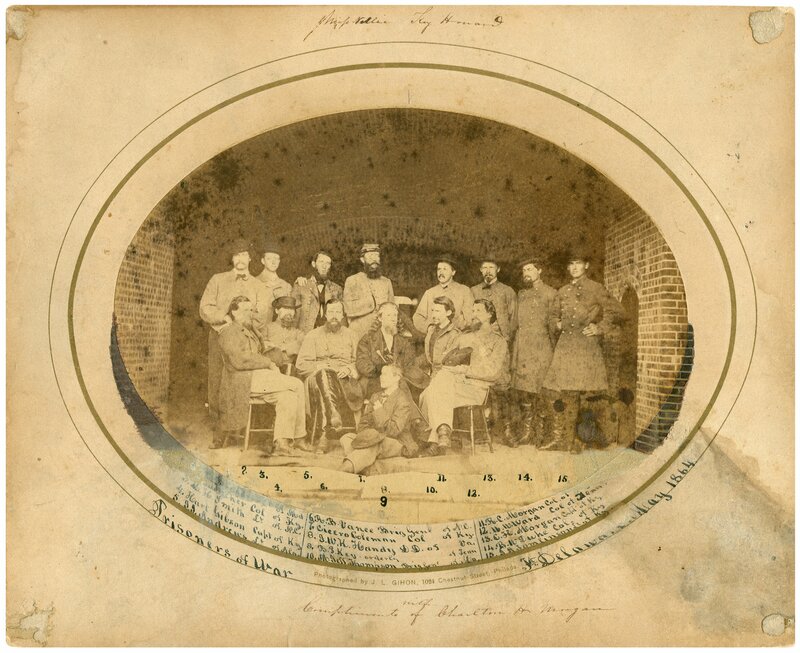 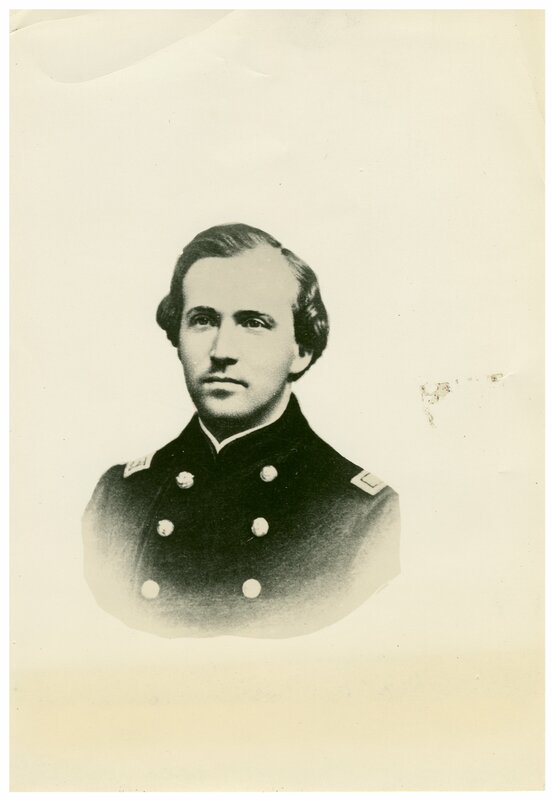 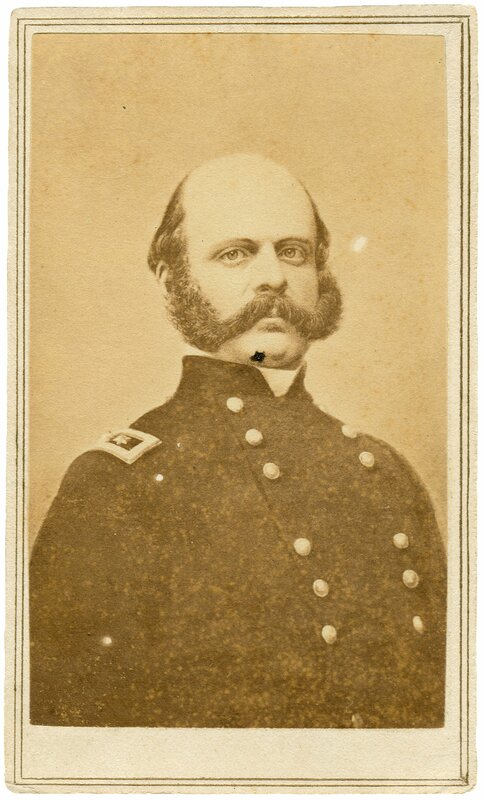 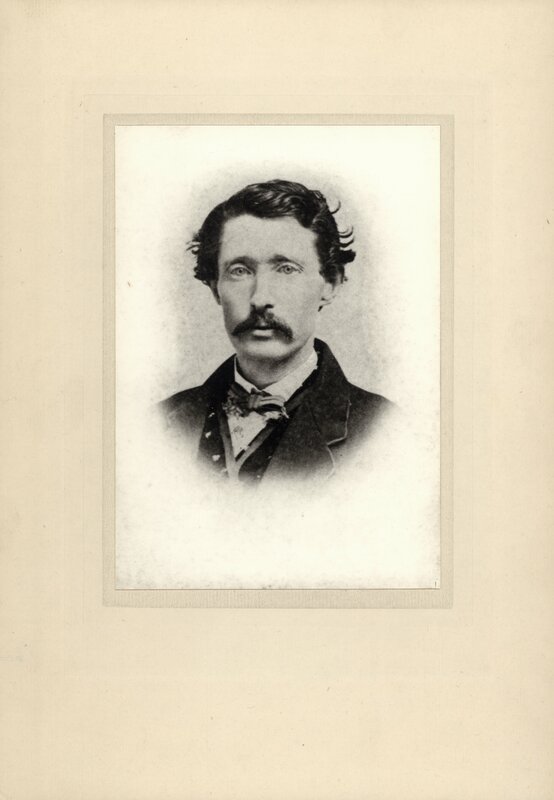 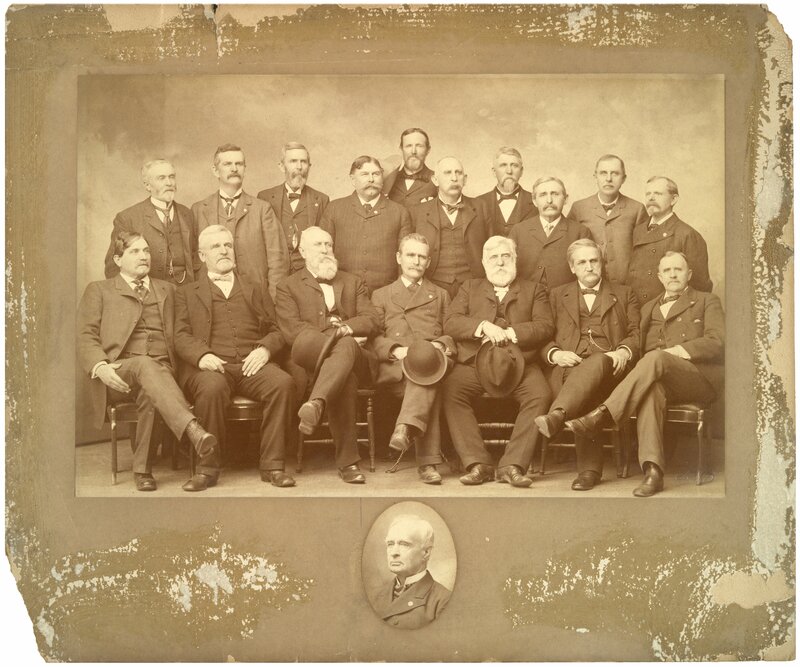 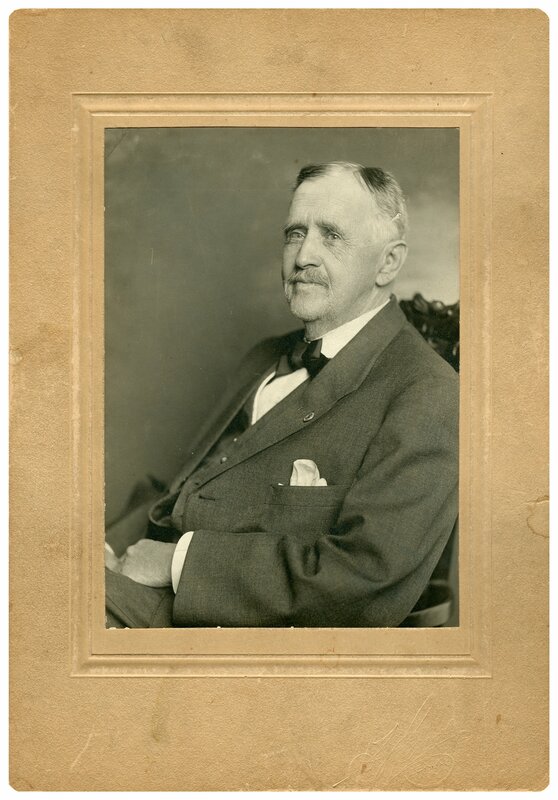 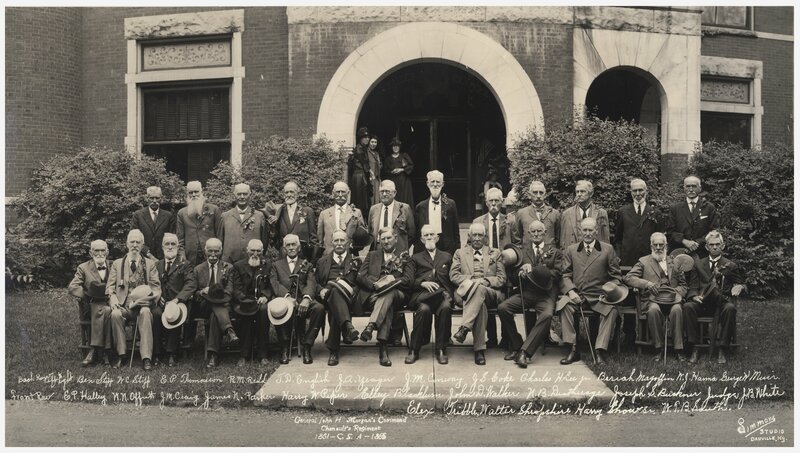 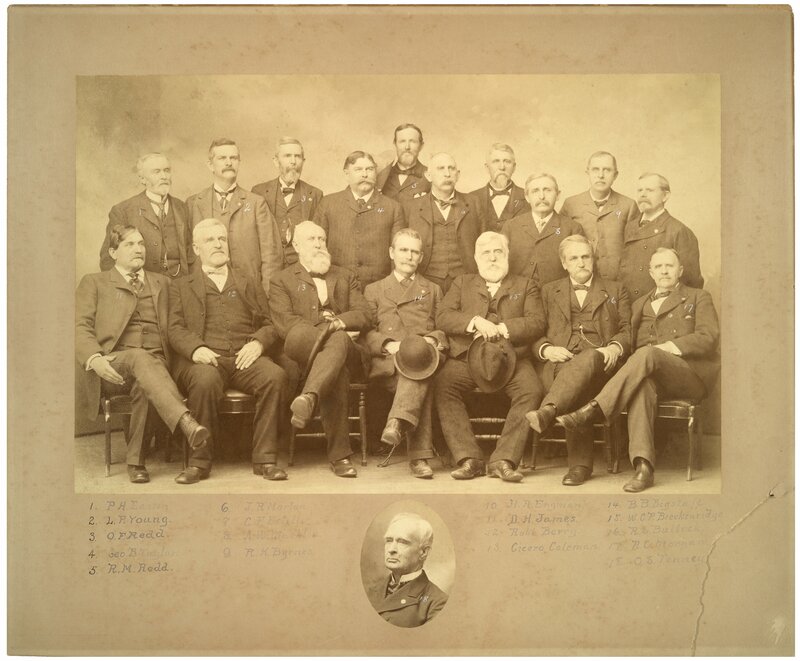 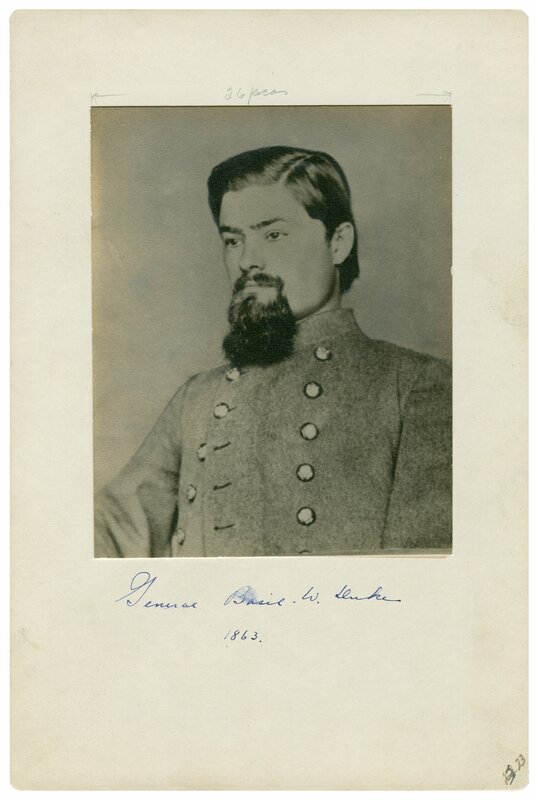 Included in the collection are photographs of men who served with General John Hunt Morgan and some fellow scientists of Thomas Hunt Morgan, geneticist. 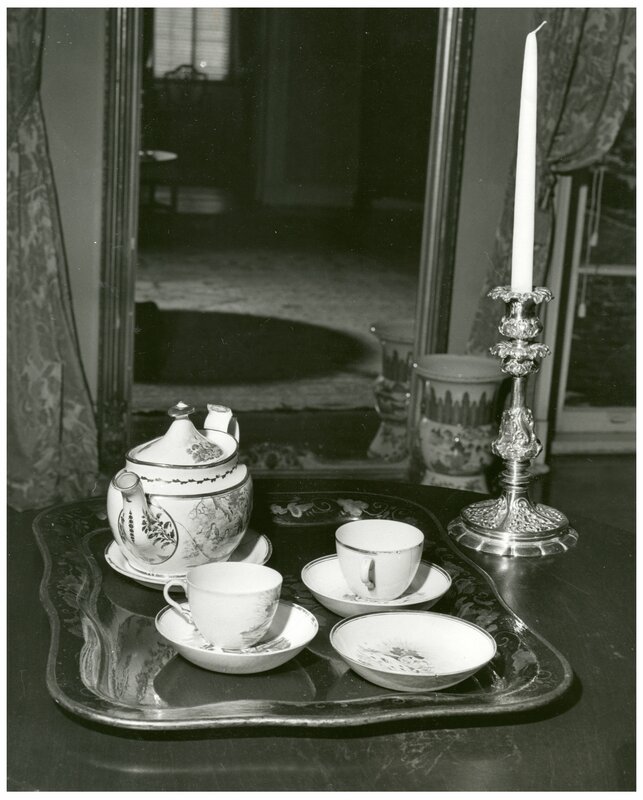 Text and dates accompanying these images are derived from the items themselves. 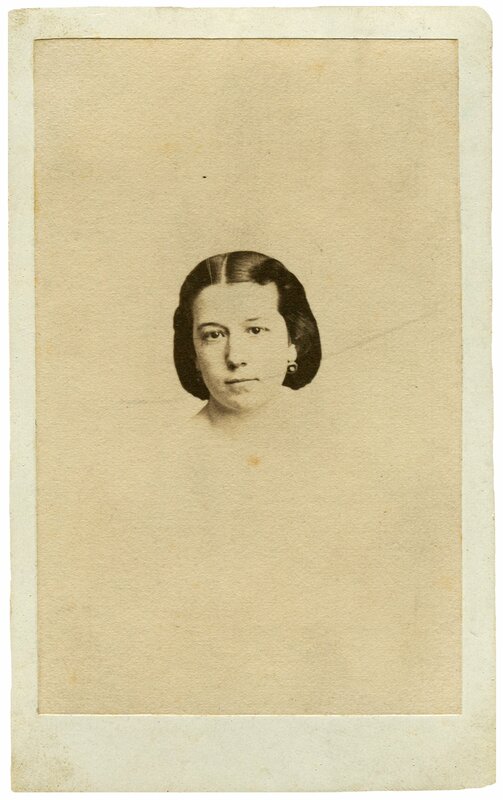 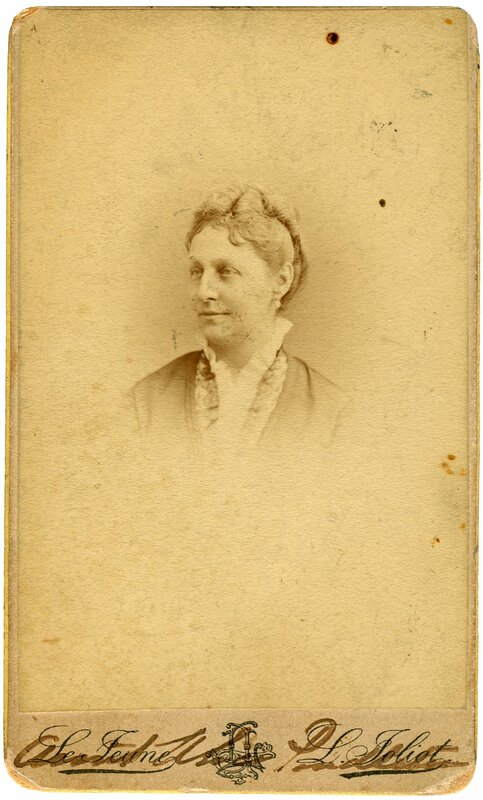 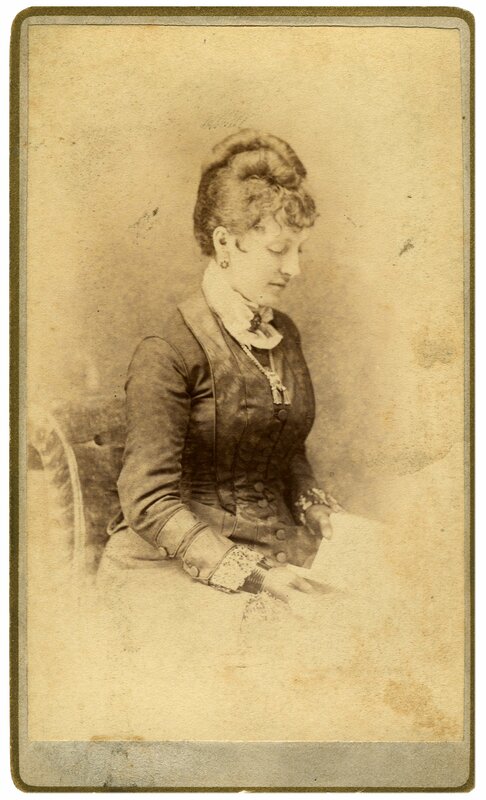 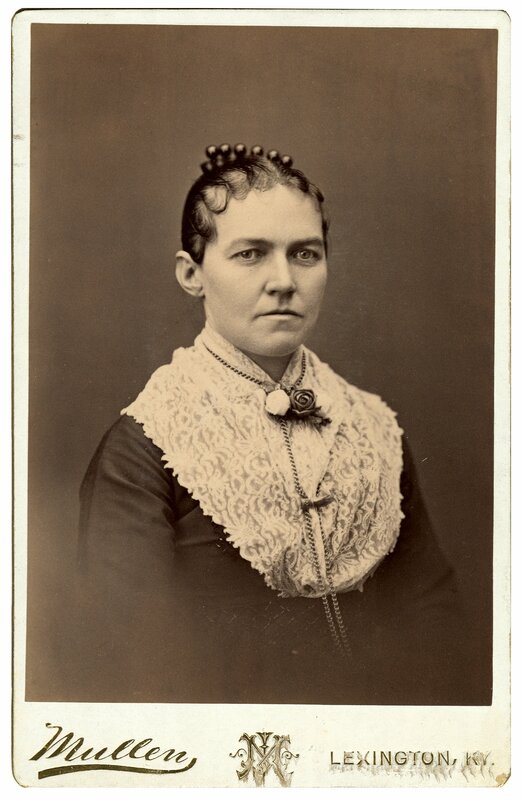 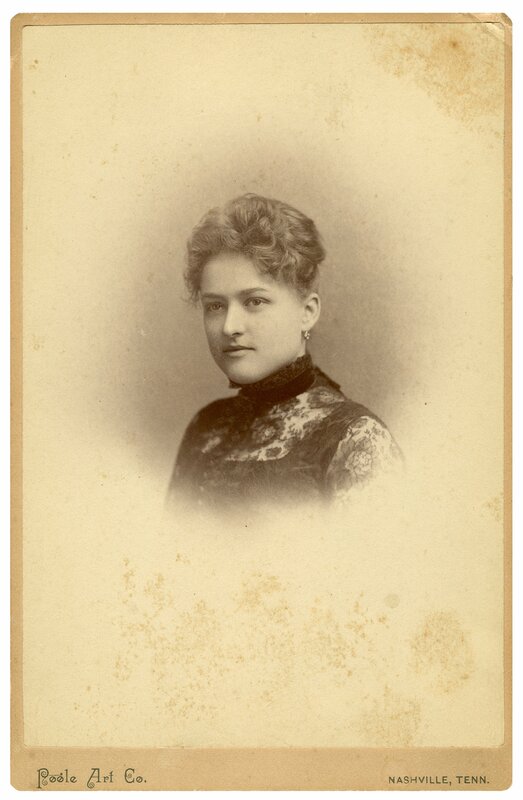 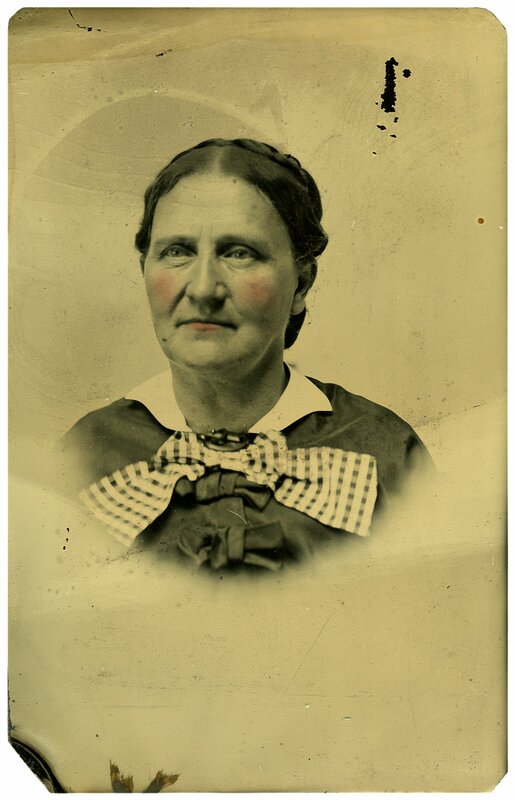 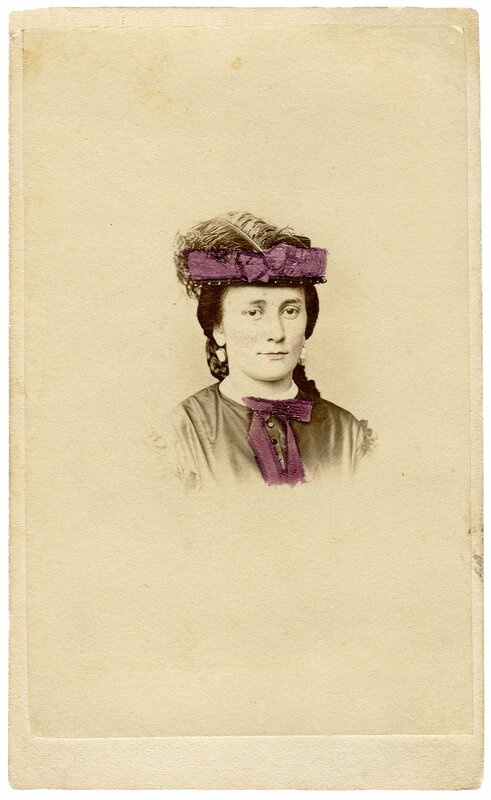 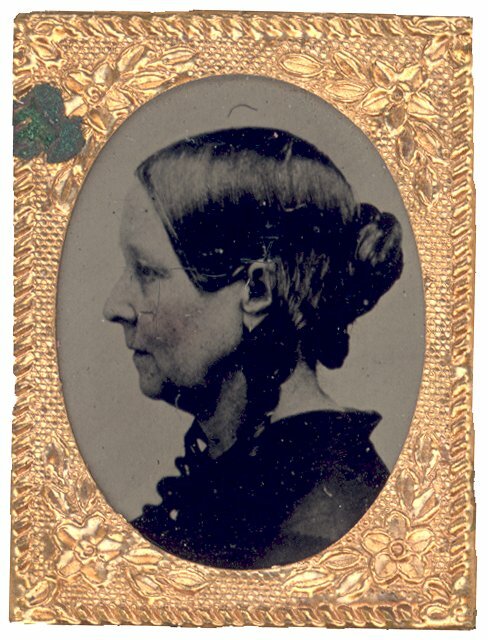 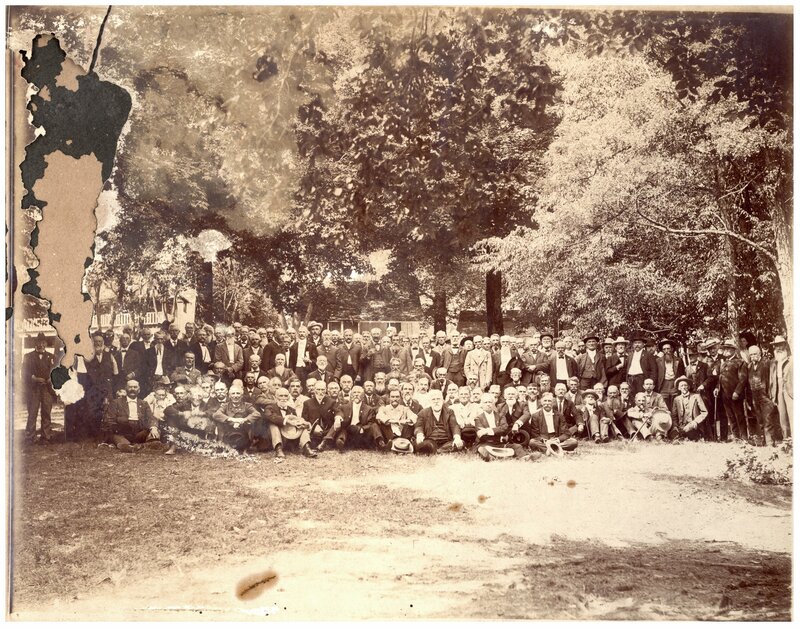 Many individuals depicted in the photographs are unidentified. 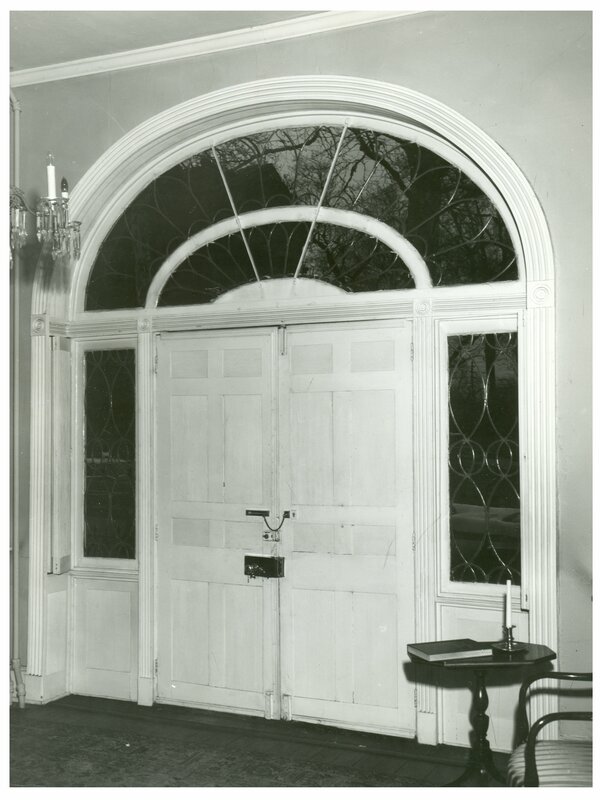 The collection is on deposit with the University of Kentucky by permission of the Bluegrass Trust For Historic Preservation. 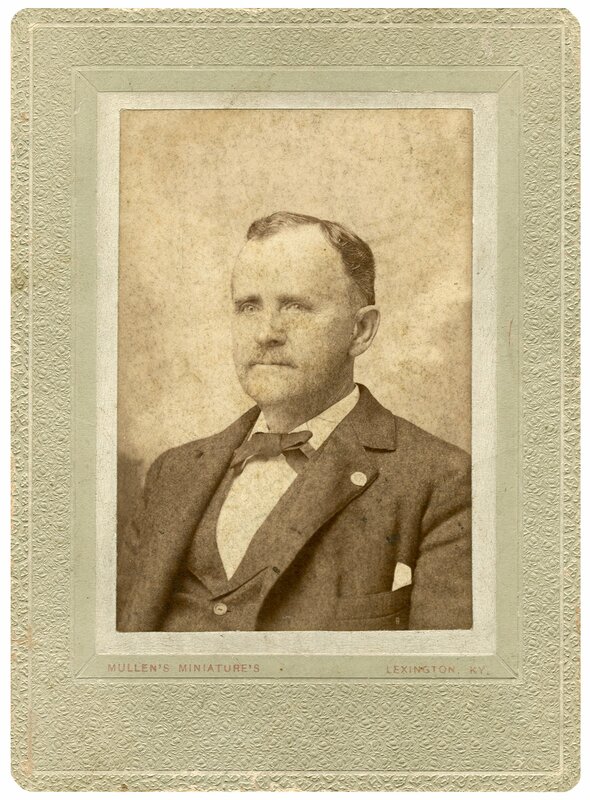 Reproduction rights can be assigned by the University of Kentucky.